My husband tells me that he has to go to Krakow on business. He leaves on Sunday the 2nd of October, his birthday. Do I want to come with him? This is his nth visit to Krakow but I have never been there. I happily agree and plan to have a celebratory dinner together in Krakow. I book myself in another hotel as he will be busy in his conference and I won’t see much of him anyway. However I manage to get myself on the same flight in and out. Our flight is delayed. Sigh! It is late by the time we arrive in a very cold and rainy Krakow. Our idea of settling in our hotels, changing and strolling out for a nice meal is not going to work. I had made a list of a few nice restaurants which we were going to check out. Instead we go to the fall-back option and head straight to an Indian restaurant recommended by friends. Dinner is acceptable but it is not the festive occasion I had planned it to be. My husband drops me at my hotel and we say our goodbyes. I shall see him only on the day we leave. After a relaxed breakfast, I set out to start my day of sightseeing. It is a gloomy day, very wet and cold. I had been hoping for better weather but it is not to be. My hotel is not far from Wawel castle. I walk along the Vistula river which looks as grey and miserable as the sky. 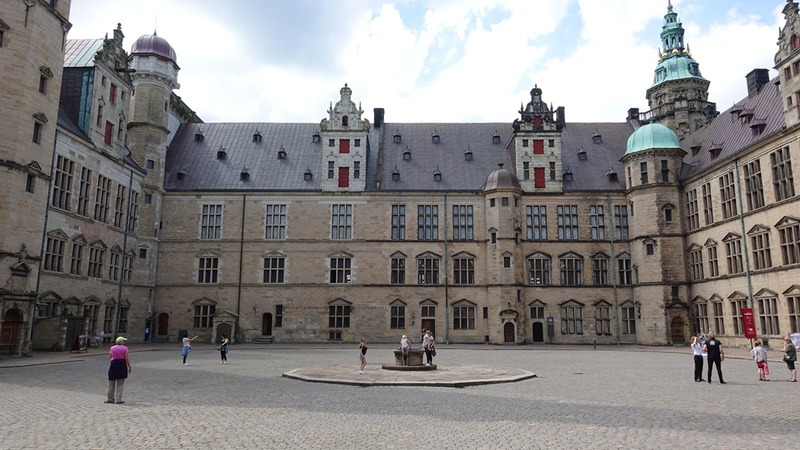 The castle is a complex of buildings with a big central courtyard. Used for more than a thousand years by different rulers, the site has seen many a change over time. 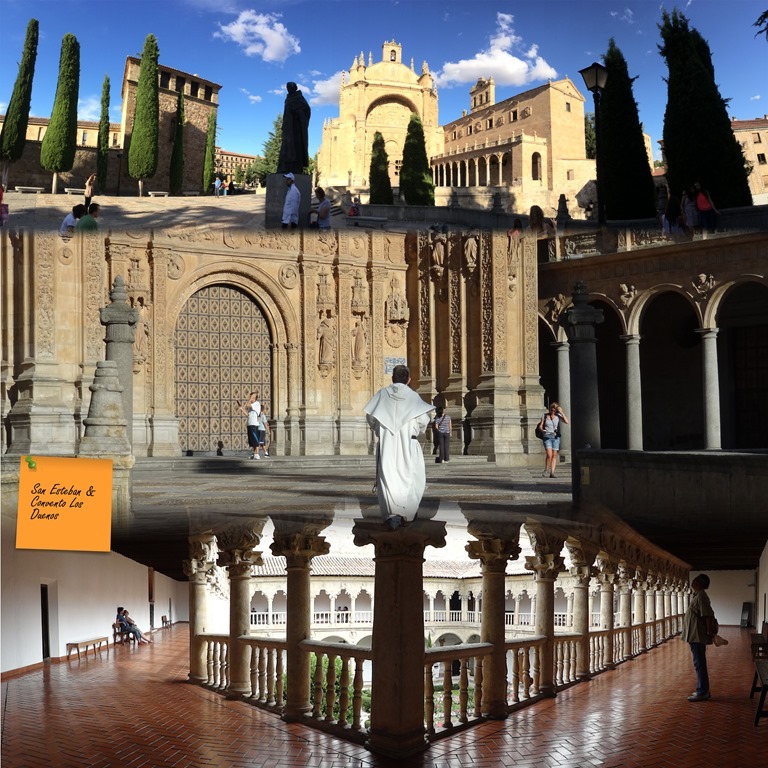 The complex includes a number of museums and a cathedral. Today being Monday two of the museums are free for visitors. I head first to the Crown Treasury and Armoury. How many weapons! Swords and lances, sabres, rapiers and daggers, guns, pistols, muskets and cannons. So many harbingers of death and destruction! The museum showcases both the treasures and the weapons used to acquire and/or protect them. I wander through the exhibits wondering where humanity would have been if only we had used our skills, our strengths and ideas in other directions. I also check out the Lost Wawel exhibition which has some interesting archaeological and historical information. I then head to the Cathedral. Sitting in the stalls, I admire the beauty around me. I have just passed by the grave of a 20 year old whose body was never found. My sadness from the armoury continues. How many unknown, unnamed young men have died in all these wasted pursuits of wealth and glory! How many mothers would have wept for their loss! 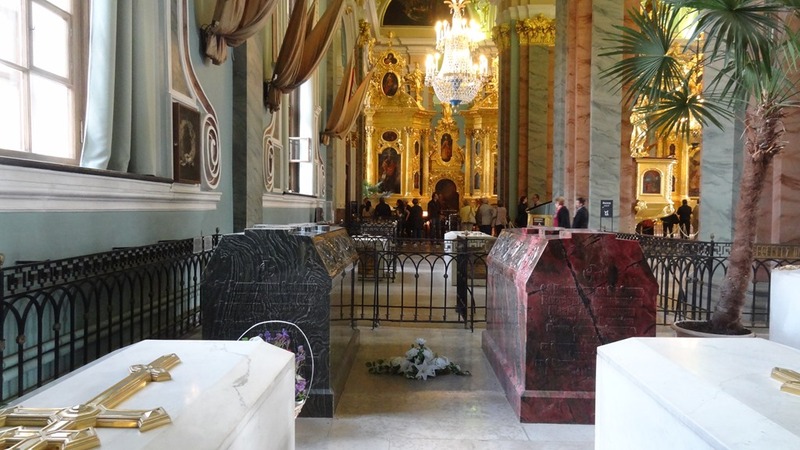 I go and look at the crypt of Chopin. He at least has left a wealth which is a true treasure. Leaving the castle I walk up to the station to buy train tickets for my visit to Warsaw tomorrow. Then I indulge in a nice lunch at Glojonad, a vegetarian restaurant close to the Barbican and city gates. There is a ‘free’ walking tour in the afternoon which I plan to join. The old city is surrounded by beautiful parks. The first signs of autumn are strewn on the paths. The meeting point for the tour is close to the Barbican. 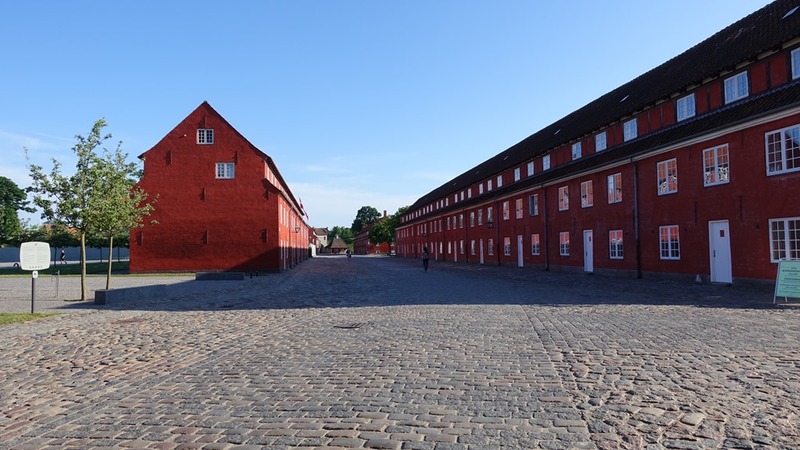 Once part of the city’s fortifications, it serves a much more benign function now as an exhibition/event hall. I love my first look of the old city. The basilica of St Mary looms like a jewel in this gloomy day. I always enjoy walking tours and this is no different. Our guide weaves a nice tale, with a judicious mix of history and myths. 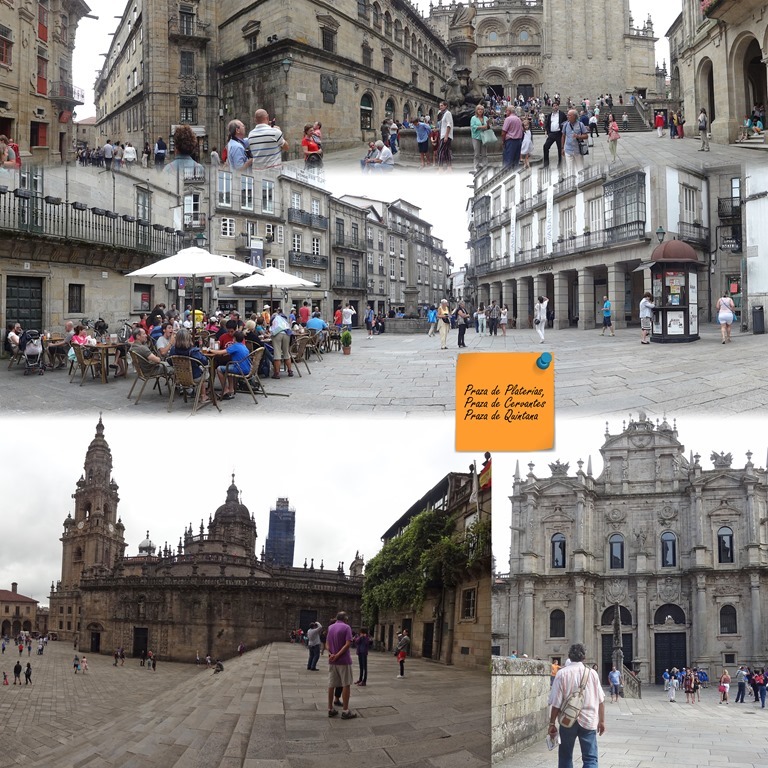 This large central square with the Basilica, the Cloth Hall and gorgeous residences all around is a true masterpiece. Dating back to the 13th century, it is beautifully designed and meant to impress. Which it does. Over the next few days I am going to be revisiting this square a number of times. Each time I see something else to admire! Look at that beautiful lamp! Next stop in our tour is the Jagiellonian University. Founded in 1364 by Caismir the Great, it is the oldest higher education institute in Poland. Nicolaus Copernicus is one of its illustrious alumni. The tour leads us back to the Wawel castle and I am happy to learn some more about its history. We have walked for almost two and a half hours. My feet protest so I decide to head back to the hotel for a rest before finding something to eat. I had researched about a vegetarian restaurant close to the hotel. Unfortunately it is closed so I walk to the Jewish quarter to another vegetarian cafe. This is not very good so I am not giving a link here. I am very tired by the time I get back to my hotel and no wonder, my fitbit tells me that I have done 33,841 steps today! I am up early and have a nice breakfast before setting out towards the station. Tram 2 which stops right in front of the hotel gets me there quite easily. There is a ticket dispensing machine in the tram; it takes only coins. In case you are wondering how I know which stop to get off, I follow our route on my mapping app in which I have marked the station in advance. The main hall of the station has an electronic timetable with platform numbers so it is easy to find my train. At the train, I hesitate. Is the coach and seat number on the ticket? Or is it free seating like in Switzerland? I ask a young woman for help; she points out the details printed on the ticket. The train leaves at 8:20, right on time. Fast, clean and comfortable, I recommend this as a very easy option for fellow travellers. There is only one other passenger in my coach. How flat is the country which streams outside my window, how green! I notice a lot of agricultural land. At Warsaw station, I find the public transport ticketing office and buy a day pass for 15 PLN. The accompanying transport map is not easy to read with my middle-aged eyes. Finding my way to the stop for a tram to the National Art Museum, I confidently get into the tram but realise after a few stops that it is headed in the opposite direction! Thank God for my mapping app! I get off, cross the track and soon find myself in the right tram. The museum has a nice collection of 19th century art. I am not a fan of it’s 20th/21st century galleries. Though I am not fond of Medieval Art, the collection here is impressive. By the time I finish I am ready for lunch. To save time I eat in the museum cafe. My meal is very tasty and I enjoy it with a hearty appetite. Next I get a bus to the Royal Castle. The bus stops are not as near each other as I expect; my stop is a good distance from the castle. It is cold but the skies are blue so walking is no hardship. Built in the 14th century and expanded in the 16th and 17th centuries, it was bombed during the war in 1939 and then blown up by the German army in 1944. The castle was reconstructed in the 1980’s and opened to the public in 1984. At the castle I buy the tickets and head straight to the Lanckoroński Collection which includes the above two paintings by Rembrandt. I just love the works of Rembrandt; seeing these was a real thrill! 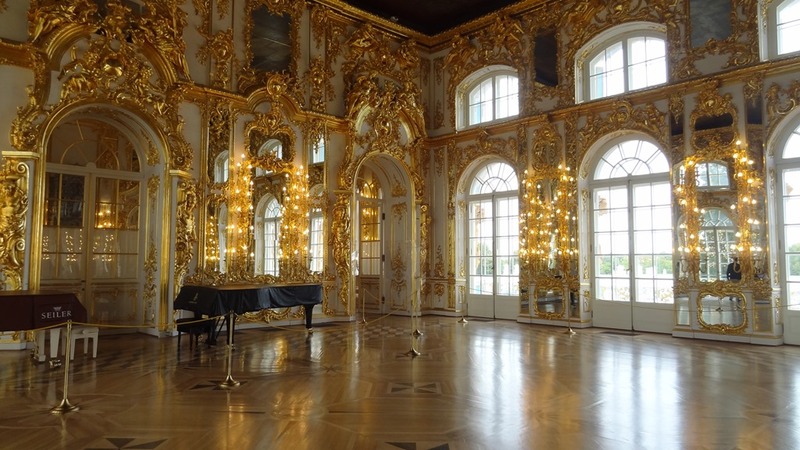 All the shiny gilt in the state rooms of the castle pleases the bling-lover in me! Look at those shiny eagles above the throne! There are lots of art works and objets d’art to admire. Information plaques in English describe the functions of each room. But the room which truly thrills me is the Caneletto room. 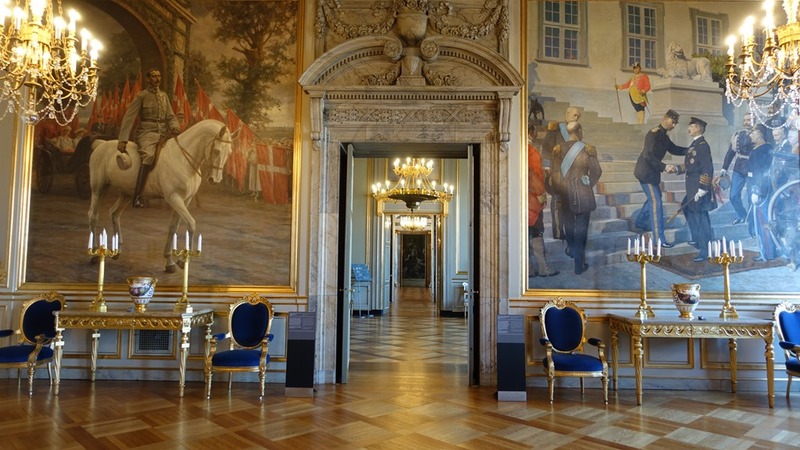 These paintings were an important part in the reconstruction of Warsaw after German troops razed it during the war. I really enjoy this visit to the castle. I am well in time to join the walking tour at 3:30 pm. 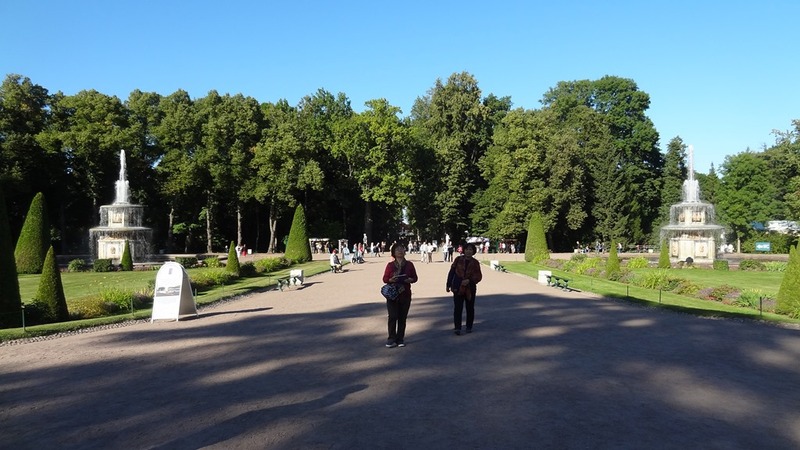 The meeting point is at the Sigismund´s Column which is right outside the castle. There is a musician singing Polish songs. Though I understand not a word, I enjoy the music. A handsome voice is a handsome one in any language, isn’t it! Soon the tour commences. The guide is a young lady who has a very nice style of delivery. She gives a historic context of the city, talks of its destruction and the literal rise from the ashes. I cannot quite believe it is a reconstructed city! How very well they have done it! We walk past the old city to the newer section. We are shown Marie Curie’s home (the white building second from left). I hadn’t realised that Marie Curie was from Poland, I always thought she was French! The guide tells us about the Polish uprising and the Ghetto. The story of Warsaw is a sad one. My throat feels heavy with unshed tears for all those who have suffered through the years. The Ghetto Boundary Markers are especially poignant. Our walking tour comes to an end here. This land has borne so much sorrow! I take a bus back to the station and get down one stop early to take a picture of the Palace of Culture and Science, the tallest building in Poland. I have a sense of déja vu – surely I have seen this somewhere before? 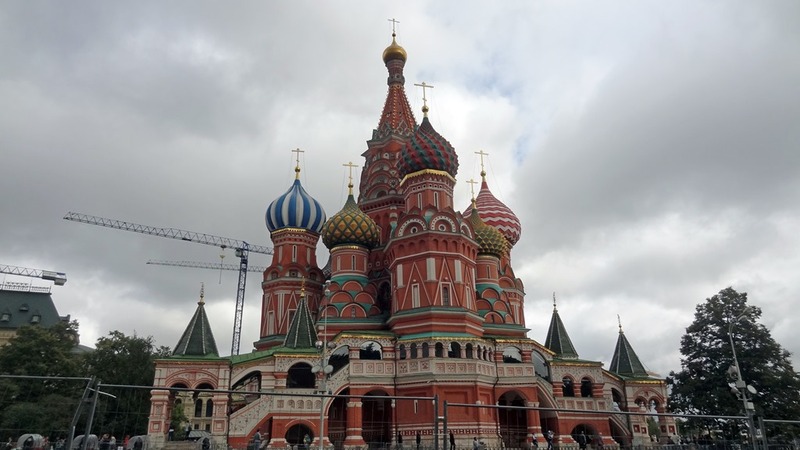 Later I do some research and find that it is in the style of several buildings in Moscow some of which I saw last year. At the station I buy myself a sandwich and drink for dinner. On the trip back I reflect on the indomitable spirit of the Polish; like a phoenix they have risen from the ashes again and again, have they not! What a courageous nation! Only 22,832 steps today, much like a normal day in my life but I am tired and sleep soundly. I wake up to another wet and cold day in Krakow. As I plan to spend a fair bit of time in Museums today, I am not much bothered. Still..a bit of sun would have been welcome! I start the day with a brisk walk to the tourist office. On the way I pass by a hairdresser and see that the rates are very reasonable as compared to Switzerland. As I am need of a cut, I walk in and make an appointment for the next day. At the tourist office I get myself a 2 day pass for 100 PLN which includes entry to a number of museums and use of public transport. 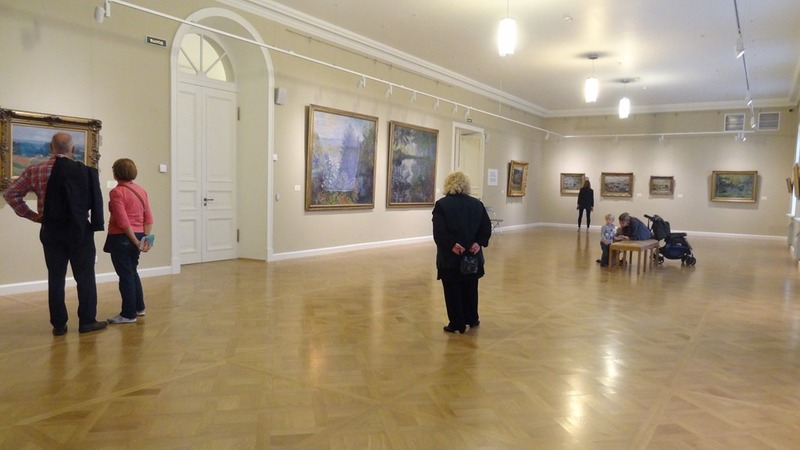 I calculate later that the museums I visited would have cost me 113 PLN in entry fees and about 15 PLN in transport. So it was a good deal after all. I head first to the Rynek Underground exhibition which is right under the market square. This is a fascinating, very well put together exhibition with interesting displays related to the history of the market square. It is very dark so I don’t take any photos but I do recommend this to visitors interested in history. I spend just over an hour and a half here. There are information plaques in English at each exhibit but they are positioned in such a way that they are rather hard to read. I then head up to see the Gallery of 19th Century Polish Art in the first floor of the market hall. Though I take great interest in art in general, I am not familiar with Polish artists so this is very educational. It is a small gallery but it is my favourite amongst all the galleries I see in this trip. I am particularly taken with the works of Jan Matejko and spend a lot of time admiring his large history paintings. I spend about an hour in this museum. Next I walk across the square to the 14th century Basilica. It is simply stunning! I love the exuberance of the decor. Just look at that ceiling! 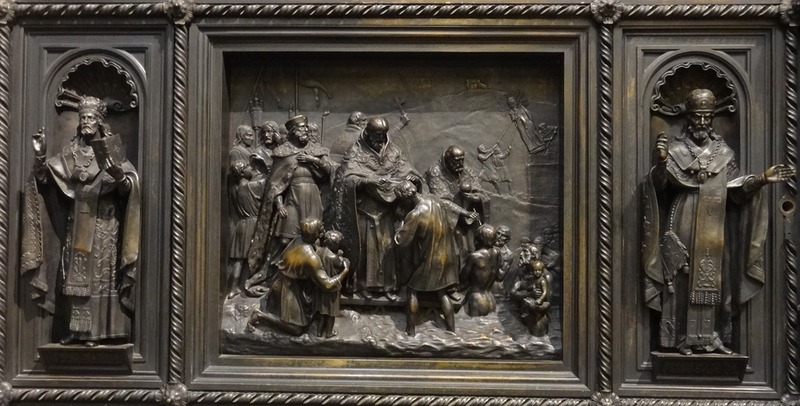 Most impressive of course is the famous wooden altarpiece by Veit Stoss. I am getting quite hungry. I had earmarked a vegetarian restaurant quite close by which I find quite easily. They have Pierogi on the menu, something I have wanted to try. Mine are filled with vegetables, mainly cabbage. They have a crisp shell and seem to be baked. Served with a cream sauce they are quite delicious. I take a tram to the main building of the National Museum. 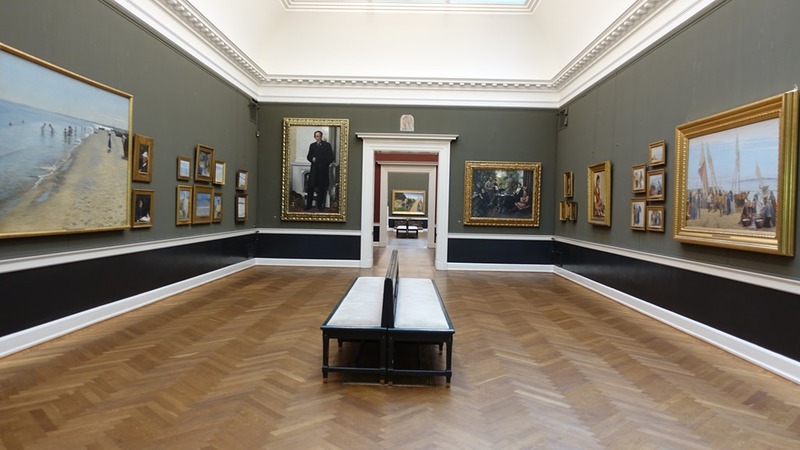 The permanent galleries are those of 20th century Polish art, Arms and Uniforms and Decorative Art. I have a wander through but the periods and subjects are not of my particular interest. By now I am comfortable with the public transport here. I take a tram back to the old city and head to Bishop Erazm Ciolek’s Palace which houses the galleries of old Polish art from 12th to 18th centuries. I seem to be their only customer! They have a small but nice collection. It is evening by now and the lights cast glimmering reflections on the wet pavements. I still have time to see one more museum. But as I try to work out my transport options I recognize that I am museumed-out for the day. It has started raining heavily again; I think longingly of my comfortable hotel room! Though not really hungry, the thought of coming out again to find dinner is not in the least attractive. I go back to the restaurant where I had lunch and get myself a bowl of soup and then take a tram back to the hotel. I enjoy a few hours of internet browsing and read myself to bed. At 21,998 steps, this day has not been too hard on my feet. I had made my haircut appointment for 9am. I am the first customer. The lady at the counter speaks very minimal English and the hairdresser has no English at all. But I get my meaning across and soon emerge with a nice coiffure. The tour guide is good with probably the best English I have heard in Poland so far. He is not Jewish but says that he has just learnt of his Jewish Great-Grandfather. He takes us into a working Synagogue. This is my first experience inside one and I am quite fascinated. The tour is informative and interesting. Though of course I have heard many stories of the atrocities committed here, standing on this earth and listening to the tales is a sorrowful experience. My heart is heavy as I stare at the stark and lonely memorial at the Ghetto. From here we walk to Schindler’s factory where the tour comes to an end. I go inside to visit the museum. Ah the sadness of it all! This is a monument of the failure of humanity; what happened here is as inhuman as it can be. I am not Jewish, nor a Pole, not even a German yet I am ashamed and distressed beyond measure. After about an hour here, I find that I cannot bear to read anymore, know anymore. I walk back to the tram stop, my heart heavy. I need to eat and rejoice in life once more. I go back to Glonojad and have a plateful of Russian Pierogi. They are quite different from what I had yesterday. Their casing is soft and the filling is made of cheese and potatoes. They seem to be boiled or steamed. I am a fan! I wonder if there is a ‘how to’ video on youtube.. Finally I get to see the old city on a sunny day! The squares are buzzing with crowds. I take pictures to my heart’s content. Tourists to Krakow invariably visit two of its most important sites – Auschwitz and the Salt Mines. I had decided even before coming here that I will not visit Auschwitz, I am sure I would not be able to handle the experience. I had reserved the Salt Mines for this afternoon. But after seeing the sun for the first time in Krakow, I do not really feel like spending the afternoon underground. Instead I spend a happy hour clicking pictures and browsing through the market. There are a number of actors in period costumes but they are all just waiting about. I watch them for a while, wondering if there is a film shooting but nothing much happens so I wander away. I decide to climb the Town Hall tower for photo opportunities. There are 110 steps and I huff and puff my way to the top. Sadly there is glass on the windows, and not very clean either. Still, it is nice to see the city from a high vantage point. Given that I still have some time, I decide to check out the Europeum, the European art collection. I enjoy the walk. This is a small museum and there is no one here but me. I do a quick browse but nothing much grabs my fancy. I go back to the city for some more strolling and photo ops before having dinner and calling it a day. At 26,776 steps, this has been a fairly heavy day but thanks to the sun, they were very happy steps! I check out and meet my husband at his hotel for our trip back. He has had a busy and productive week and so have I!! Though my time in Warsaw was too short to do justice, I feel content that I have explored Krakow quite well. This has been a good trip! My husband reminds me that he is going away to Japan on a business trip next week. He says ‘Suja, why don’t you go somewhere for a short break?’. I hesitate for a moment..I have lots of travel planned for the summer, should I bother? Should I not be doing some spring cleaning instead? The moment that thought occurs, I rush to my computer to do some research! I check the Easyjet site. I set the ‘from’ to Geneva and look at the ‘to’s. 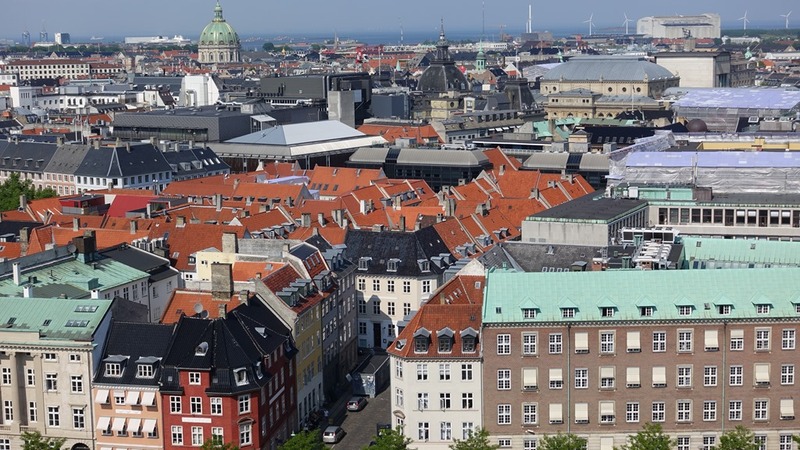 Copenhagen immediately catches my eye. It seems to fit all my criteria – not too far, safe, big city, somewhere I haven’t been. I immediately book myself in. The next day I go looking for hotels and get a shock at the prices. They are SO expensive! Is this because this is last minute? Ordinary chain hotels are charging as much as what we paid for a lovely cliff side hotel in the Amalfi coast..and that I thought was expensive! I decide to check Airbnb. I have never used their services but decide to take a chance. I find myself a small apartment not too far from the city for about 60% of the cost. I am panicking! I have been busy with two lots of guests last week and have had no time to do any planning. In fact, one couple is leaving this afternoon. I abandon them to their own devices to give 5 full hours of concentrated effort to my travel plan. I download Copenhagen region map to my CityMaps2Go App (Love this! ), download Danish to my google translate offline language (never use it! 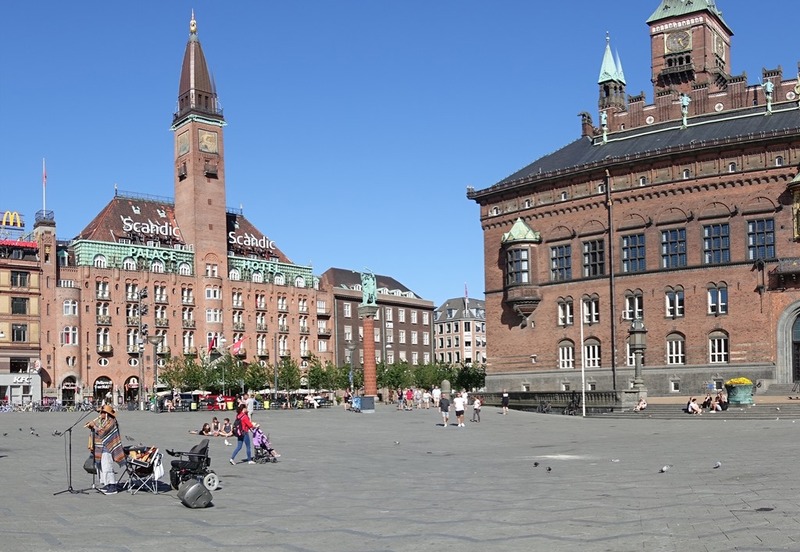 ), research places to visit using Copenhagen Tourism and Tripadvisor sites, decide on my priorities, pin everything on my offline map, pin the apartment, train and bus stops, find vegetarian friendly restaurants and pin that too, pack my bag as lightly as I can and finally feel ready for the trip. For those who are reading this, I take interest in art, architecture, history and monuments. I am not interested in restaurants, night life or adventure pursuits, so if these are your areas of interest, you may as well give up reading now!! 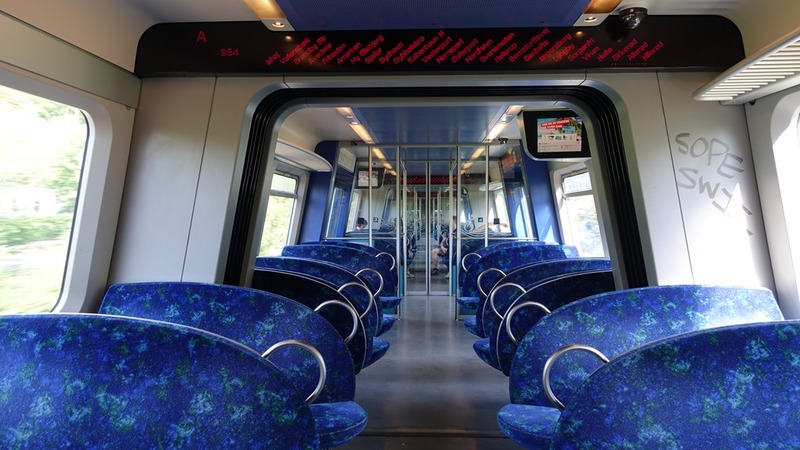 I take the train to Geneva airport well ahead of time. We board on time but then it is announced that we will not depart for another 45 mins. Something about weather. I worry. I am supposed to pick up the keys to the apartment from the corner store which closes at 11pm. Am I going to make it in time? I text the host. She replies that if I am late, her sister would be able to come and give me the spare keys. Still, this is stressful. Arriving in a new city at night and having to make your way to the burbs using public transport can be difficult. But thanks to my prep work everything went well. At the airport I struggle a bit with the metro tickets at the machine but there is nobody at the info desk, its too late. Finally I manage it. In the train the stop names flash across the scene so it is easy to get off correctly. After I exit the metro I figure out the bus stop. My CityMaps2Go uses GPS to show my position which I follow as I ride the bus. From the stop I again use the mapping app to find my way to the apartment. I make it just in time, it is 10:40 when I collect the keys. There is still plenty of light and the streets are busy on this Monday night. I have a relaxed start to the day and set out at about 9:15am. I am dismayed to see that it is raining, it was supposed to be a fine day! I walk to the tourist office, it takes about half an hour. 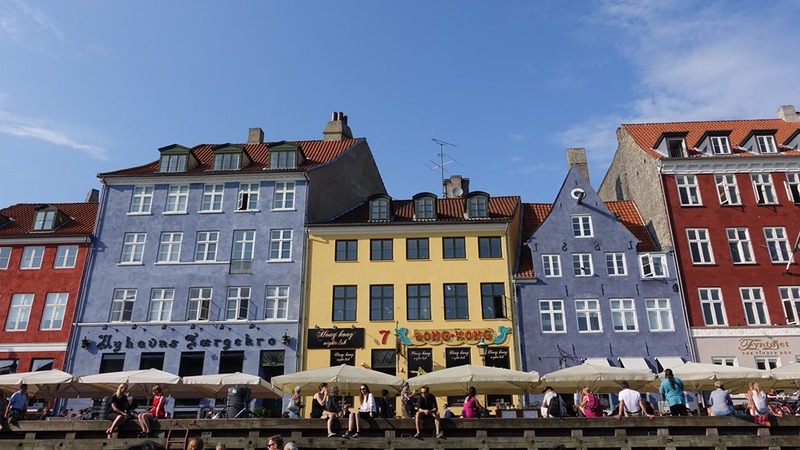 There is a bit of a queue but finally I get what I have come for, a three day Copenhagen Card which gives me free entry to all the sights I am interested in as well as free transport. It costs DKK 699 and I reckon it is a good deal. I also collect the free city map which clearly shows the bus routes and metro stops. Very useful. 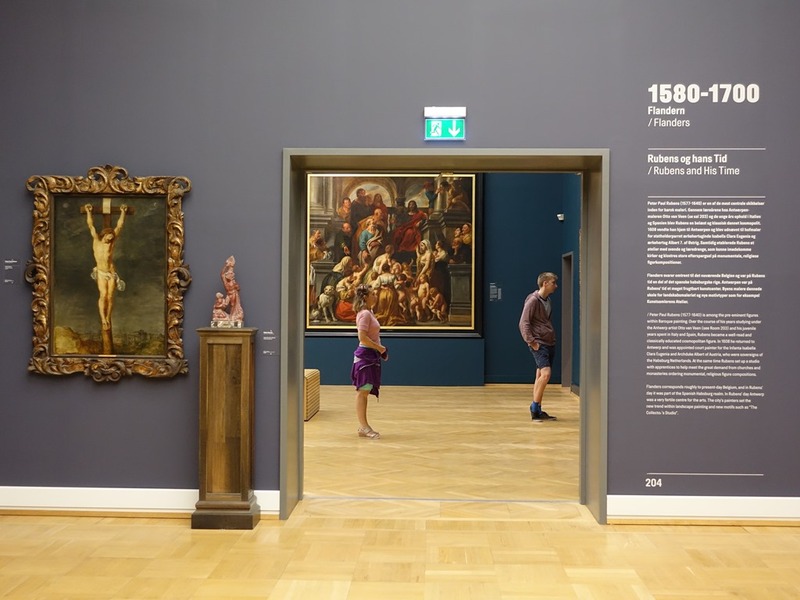 Nobody who knows me will be surprised that my first stop is at the National Gallery of Denmark – Statens Museum for Kunst. It opens at 11am and I am there before the gates open. 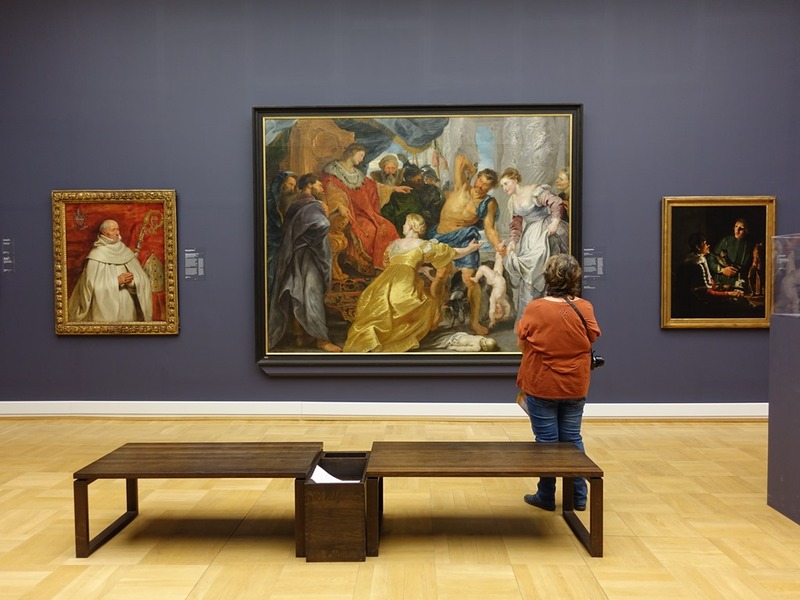 There are four main sections, European Art 1300 to 1800, Danish and Nordic Art 1750-1900, French Art 1900-1930 and Danish and International Art after 1900. 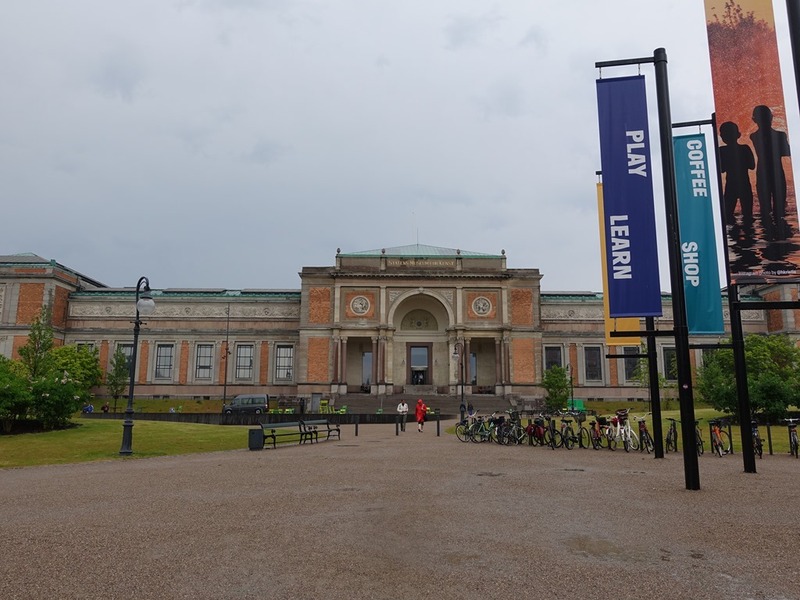 The exhibits are very nicely arranged and descriptions are in both Danish and English. I really enjoy the Danish and Nordic Art as well as the European Art from 1300 to 1800. The French collection is OK but I have seen many better collections so I am not much taken with it. I quite dislike the last section; it is not to my taste. I abandon it after a couple of rooms. I spend a total of 2 hr 30 mins here. 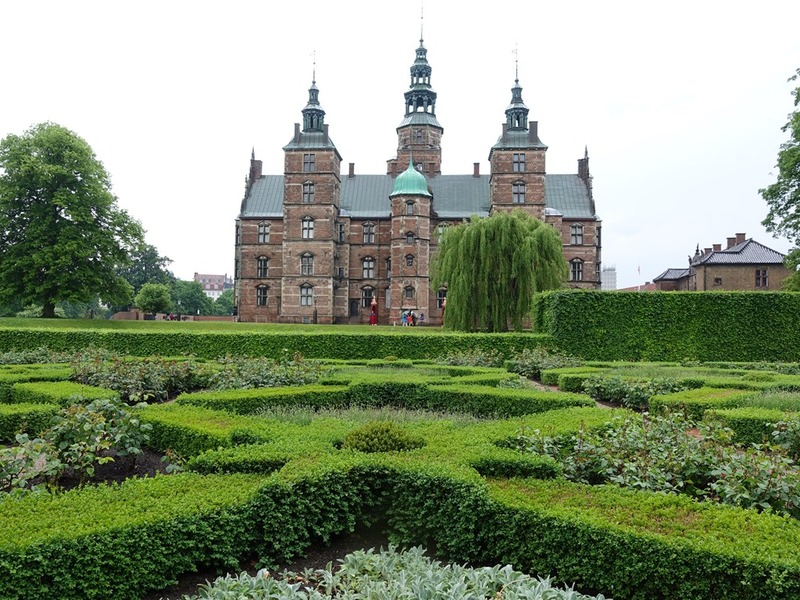 The Rosenborg Castle is just a few minutes walk from the National Gallery of Denmark. It stands in a beautiful garden called the Kings Garden. I walk around snapping pictures from different angles. A very photogenic castle! There are some interesting exhibits. I particularly enjoy the gorgeous Venetian glass collection, some very pretty Porcelain service and, of course, the Crown Jewels including a beautiful jewelled sword. I spend about an hour including both outside and inside. Next, I head out to the Round Tower. I had been planning to climb it but then seeing that it is already almost 3pm, I decide to skip it. I am feeling really hungry and stop at a café for a quick carb kick of pasta and juice. I feel rather overcharged for a very simple and ordinary meal. 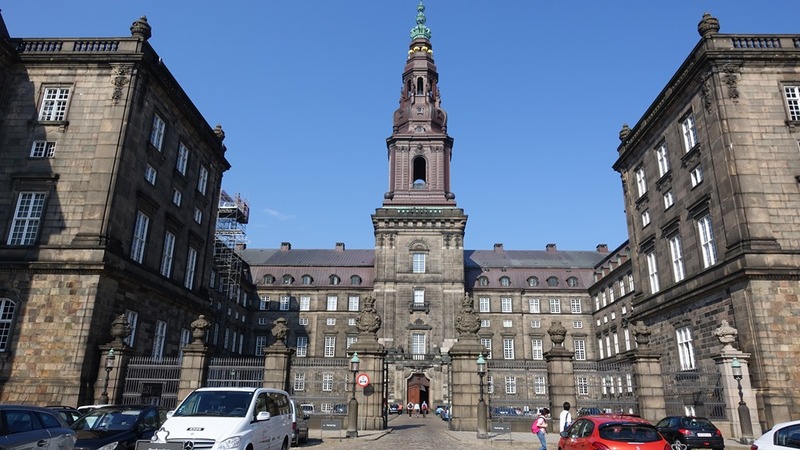 My next destination is the Christiansborg palace which is also the seat of Parliament. As there is hardly a queue I decide to first go up the tower for a view. There is a security check but it is quick. The views from above are very good but I don’t stay long; I want to see the reception rooms and they will close soon. The inside of the palace is sumptuous, I especially admire the many gorgeous chandeliers. 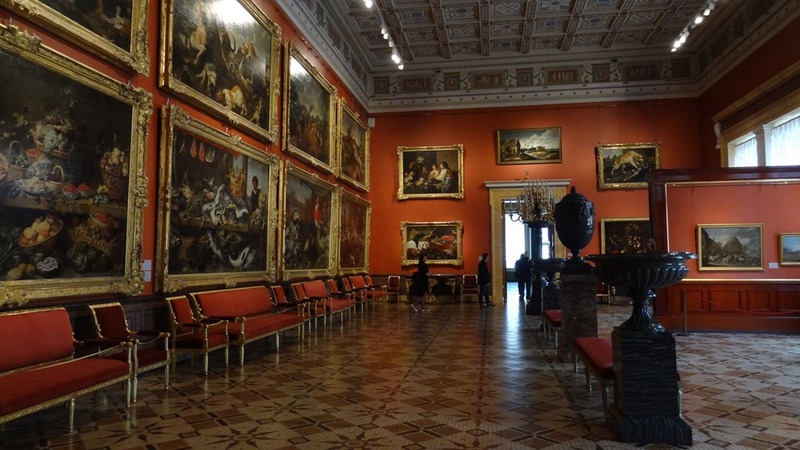 There are plenty of beautiful paintings and objets d’art to be admired. However I am conscious that the palace closes at 5 pm so I am brisk. I spend about one hour here; I could easily have spent another hour or two; as it is, I have no time to see the kitchens or the stables. Sigh! The reality of short trips is that one cannot see everything. Is it better to see a bit of as many places as you can fit, or just choose a few for a thorough exploration? I tend to go with the former but sometimes it leaves me disappointed, as in this case. My feet are really tired now and I need a rest. I decide to take the canal boat ride. The current boat is already full, I need to wait 30 mins for the next one. I don’t mind, I am happy to sit at the pier and enjoy the sun. Yes, the morning rain gave way to wonderful sunny weather while I was indoors all day in museums!! The boat ride has live commentary to point out places of interest but it isn’t exactly riveting. But this is a very pleasant way to spend an hour watching the world as they watch us back. 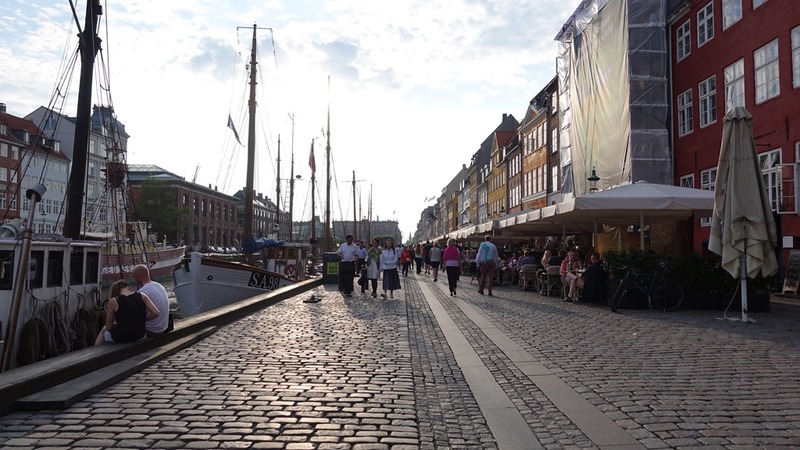 After the ride, I walk down to Nyhaven area which is very lively and full of restaurants. But after my rather late lunch I am not hungry so I decide to find a café near the apartment to have a salad. Stupidly, for I was tired, I decide to walk back as I normally enjoy walking everywhere. But I give up half way through and take a bus. The café experience is suboptimal..I should have chosen more carefully. I upload my pics on my computer and savour my day once more before falling into bed to an exhausted sleep. My day yesterday has given me a more realistic picture of what is feasible and what is not. I spend a little time in the morning tweaking my plan and reordering priorities. As this is a fine day, I decide to head on a day trip to the two northern castles. I take the bus to Norreport and switch to the train to Hillerod. The station is easy to navigate, the trains are clearly marked and it is not at all hard to find my way to the right train. Hillerod is the last station. The bus stop is right outside the station and number 301/302 takes me to the castle entrance. I am at the castle by 10:15. 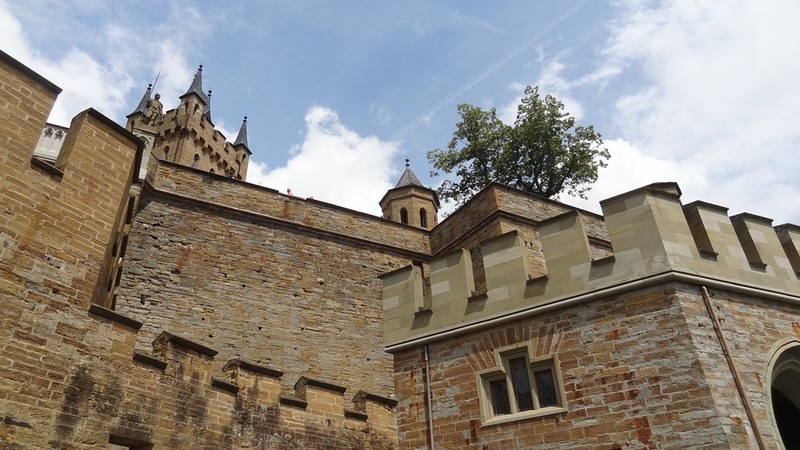 Most of the current structure is a re-construction from the 19th century after a fire destroyed major parts of the 17th century castle built by King Christian IV. It is now the National Museum of National History and houses some beautiful artwork. At the reception, I leave an id as deposit and take the free mp3 audio tour. The rooms are richly decorated with furniture, objects d’art, paintings, tapestries, panels etc. The audio tour is useful and interesting. I am so glad I have come to see this castle! 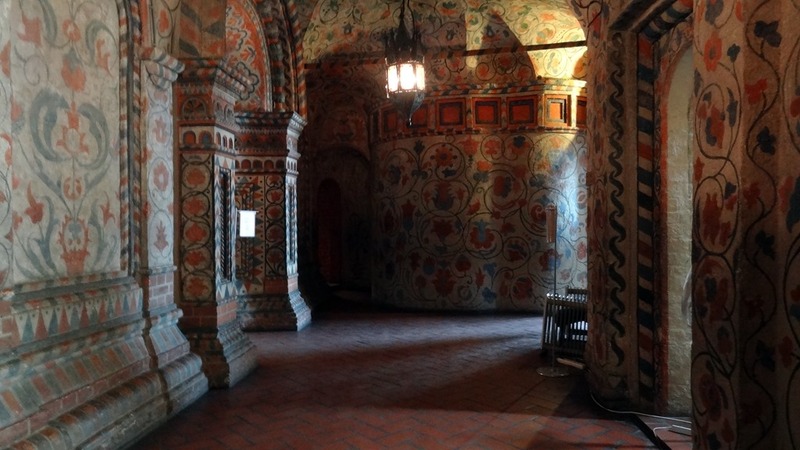 This beautiful chapel, which mostly escaped the fire, is gorgeous. 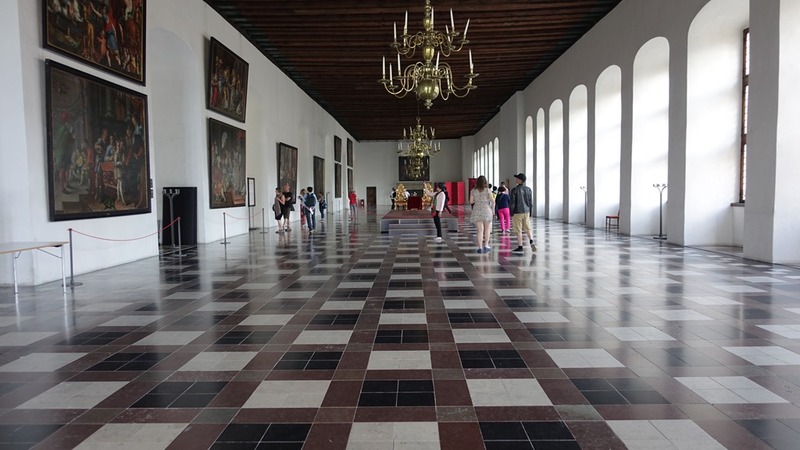 It is of great historical significance as this is where almost all Danish monarchs were anointed between 1671 to 1840. I admire the beautiful organ, the oldest in Denmark. The Audience Chamber is another room which escaped the fire. Large and airy, it has stunning views of the garden. I am amused by the hand-operated ‘lift’..the red chair you can just glimpse at the left corner of the room above. 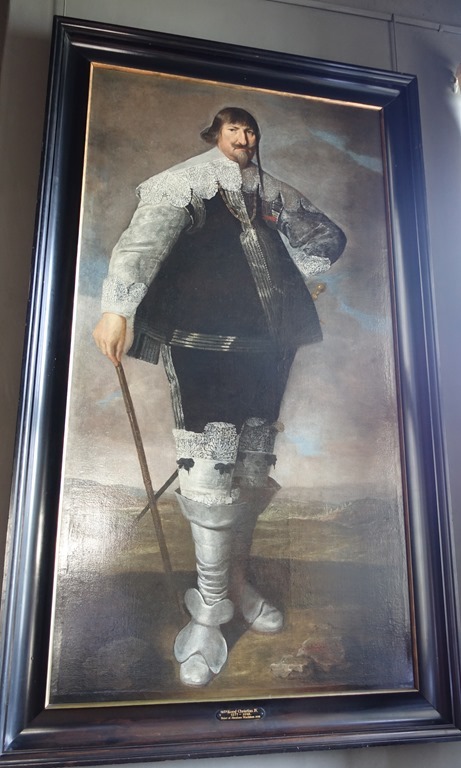 There are many wonderful portraits here, but my favourite is Christian IV because he has a marked resemblance to Obelix! See the braid? See the figure? He made me smile so! 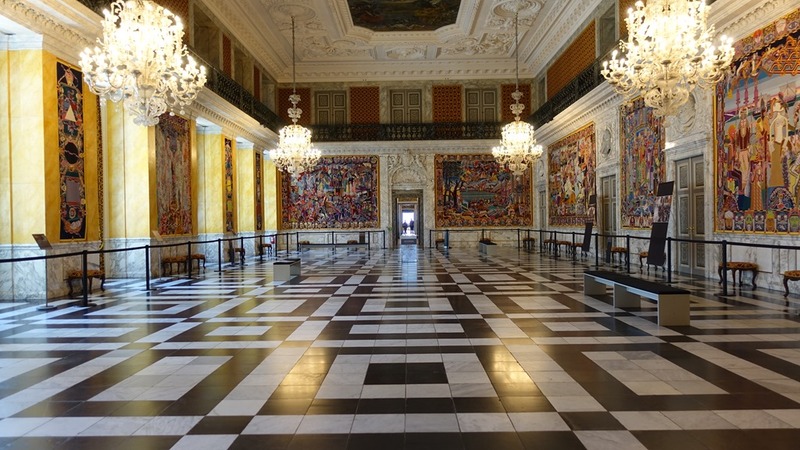 This grand hall looks amazing with a most intricate ceiling and many portraits of the royal family. I spend about 80 mins inside the castle. I then head out the large ornamental garden with cascading fountains. It is nice to be outside, so I take my time wandering down the paths and taking pictures. I head out back to the bus stop..or so I think. Instead I have exited from another entrance and have to walk around the moat to reach the bus stop. I feel hot and grumpy with my mistake; then realise I am hungry as well. I stop to have a sandwich and a drink. It is 1:15pm by the time I am back at the bus stop. I take the bus 301/302 to the station and catch the train to Helsingor to see Kronborg castle. The train is easy to find. Exiting from the station at Helsingor I see the castle in the distance. It takes about 15 mins to walk to the entrance; I am there by 2:15pm. 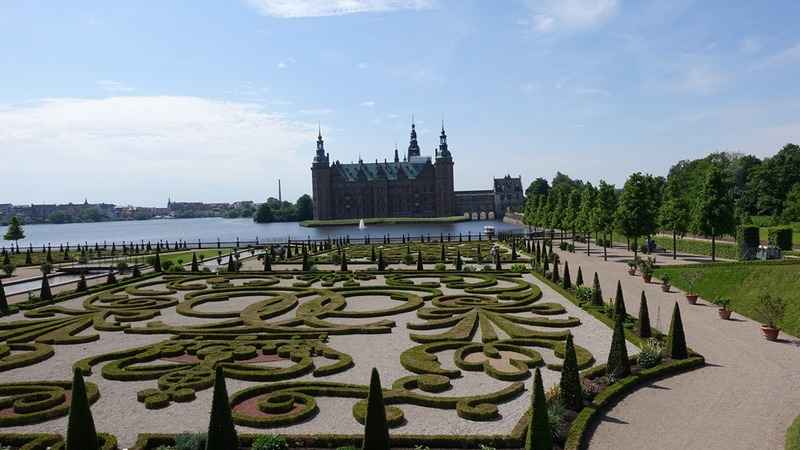 This castle is markedly different to Frederiksborg. 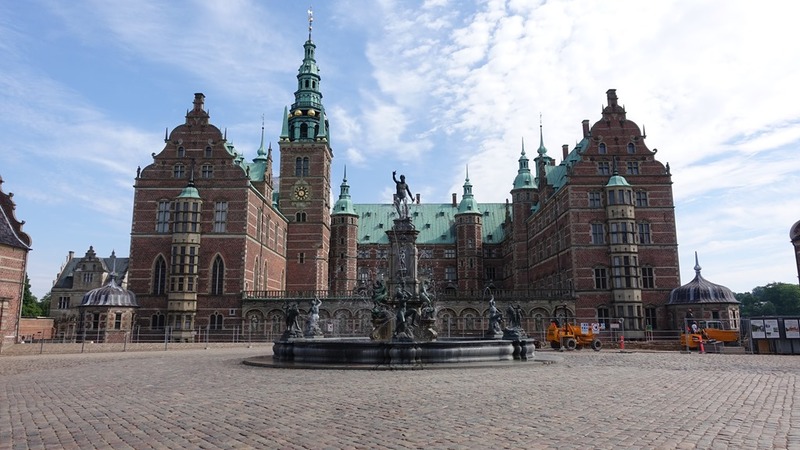 While Frederiksborg is a luxurious palace, this is more of a solid fortress. This castle is the setting for Shakespeare’s Hamlet and many famous actors have performed the play right here, starting from Richard Burton, John Giulgud and Christopher Plummer to Kenneth Branagh and Jude Law. There is a room with photos from their live performances here; I enjoy my star gazing! The insides are rather plain and not that interesting. I still do a complete walk-through in case I miss something. What I like best is a room full of beautiful tapestries. 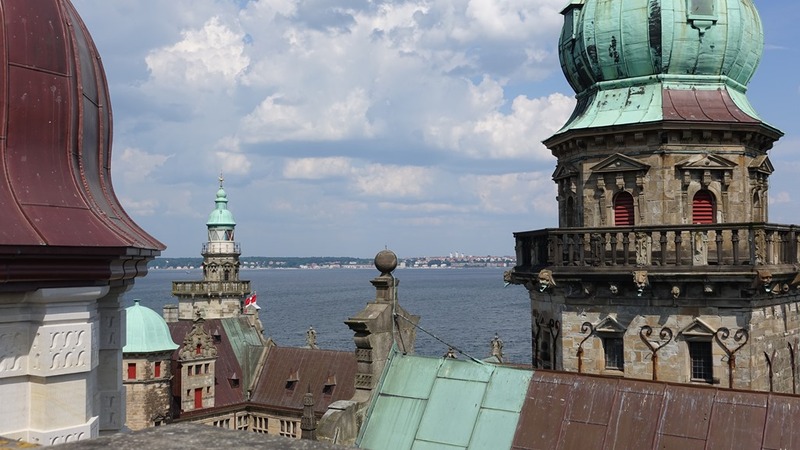 There are 144 steps to climb up the tower, but it is worth it as the views are amazing! I am alone up there, nobody else has bothered with the climb! Once I climb down again I head towards the exit. I hesitate in front of the dungeons. I don’t like dark and creepy places…and this one would have been such a sad place, with so many prisoners living in misery, seeking death as a relief. I decide that I don’t want to see it after all. I exit and walk up to the ramparts. 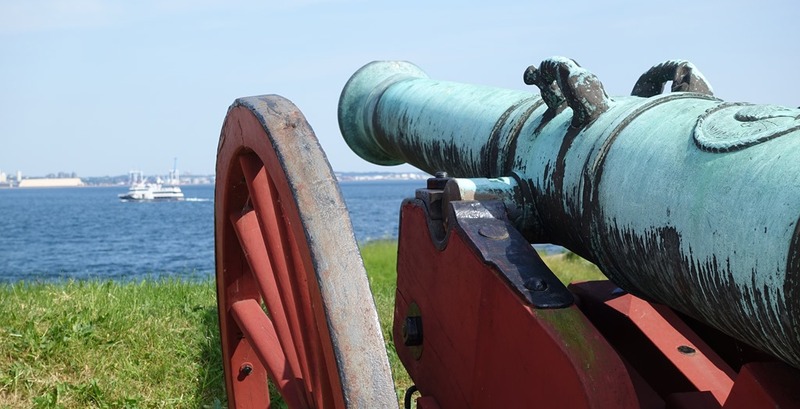 The guns here attest to the role of the fortress in days gone by. I walk back to the station, passing through Helsingor and admiring its lively central area. I find my way to my train and have a nice restful time while the train takes me back to Copenhagen. 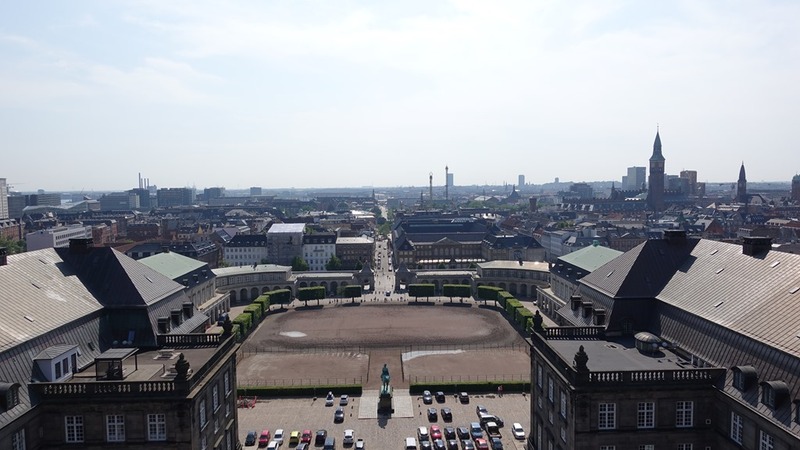 I reach Copenhagen Central station just after 5 pm and and head straight to the Planetarium. I somehow forget to take pics; this is from the tourism website. I haven’t been to a planetarium for many years, I am not sure what to expect. I certainly do not expect this huge 100 square metre screen and a 3D star voyage! The first 15 mins just take my breath away! It is incredible! The IMAX documentary which follows is also very educational. I really enjoy my experience. Note : If you carry headphones with you, you can save 20 DKK on buying one in order to listen to the commentary in English. It is past 7 pm and I am hungry. As the Copenhagen pass includes entry to the Tivoli gardens I decide to go and see what they have to offer. It is interesting to see an amusement park right in the centre of town! There are any number of eateries here but as a vegetarian, my choices are, as always, limited. I spot Wagamama, a chain I am familiar with. I am very pleased with my lovely vegetable and tofu stir fry. After dinner I wander around and spot a jazz concert in progress. I sit down and enjoy the music for about half an hour. I am kind of fading, it has been a long day. I head out and catch a bus back to my apartment. However the bus veers away from the normal path as there is some kind of a street festival. There are thousands of young folk thronging the streets. I thank heaven for my mapping application; I get off a few blocks away and trudge on tired feet back to my apartment. The noise levels are horrendous and the streets are a garbage dump. I cannot understand why streets should be trashed thus for the young to amuse themselves! It is late by the time I get to bed but the street noise doesn’t abate..I nod off in exhaustion but wake repeatedly; there is noise even at 02:30 am! The light wakes me up at 5. Not much sleep for my tired body. I am a bit dizzy with lack of sleep this morning but the day is bright and lovely and soon I feel myself again. I head straight out to the aquarium. This is just one metro stop away from the airport. A 10 minute walk from the metro gets me to the aquarium. If my flight timing had been suitable, it would have worked very well to see it on the way back but unfortunately that didn’t work for me. 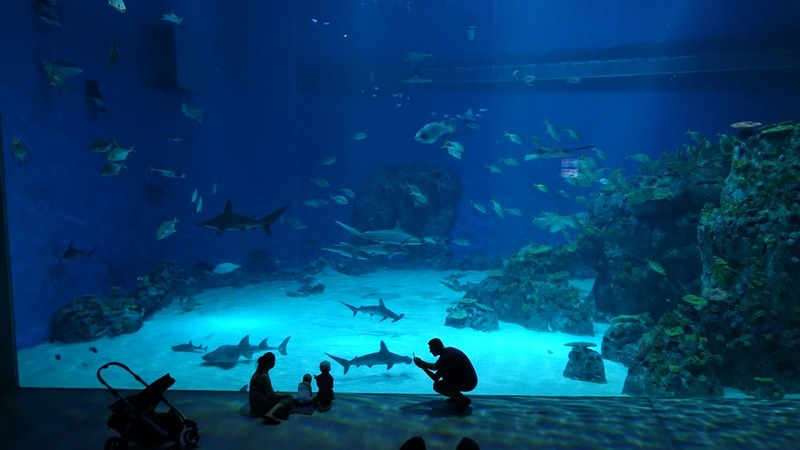 I’ve seen a few good aquariums in Australia; I wonder if this will stand up to those in Sydney and Melbourne? It turns out to be very charming. I am so glad I came! I am mesmerized by the so many different colours and shapes of the life forms, isn’t the world quite a magical place? I spend just over an hour here. I leave at about 11:15. 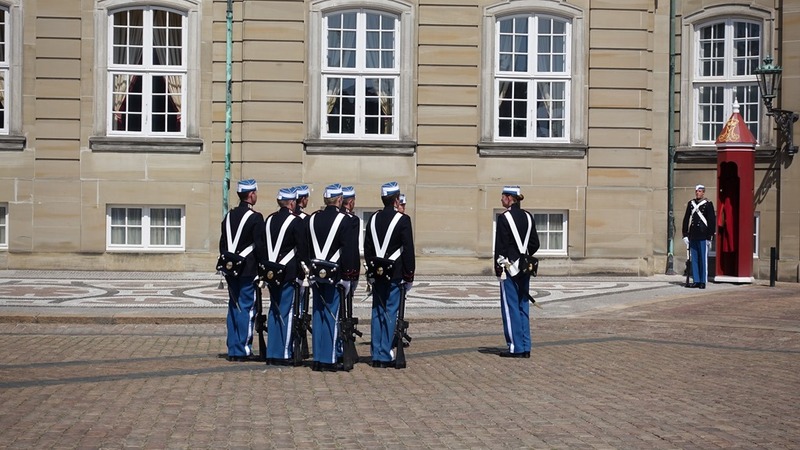 My intention is to see the changing of the guards at Amalienborg at 12 noon. By the time I walk to the station, wait for the metro and get off at the appropriate stop, there isn’t much time left. 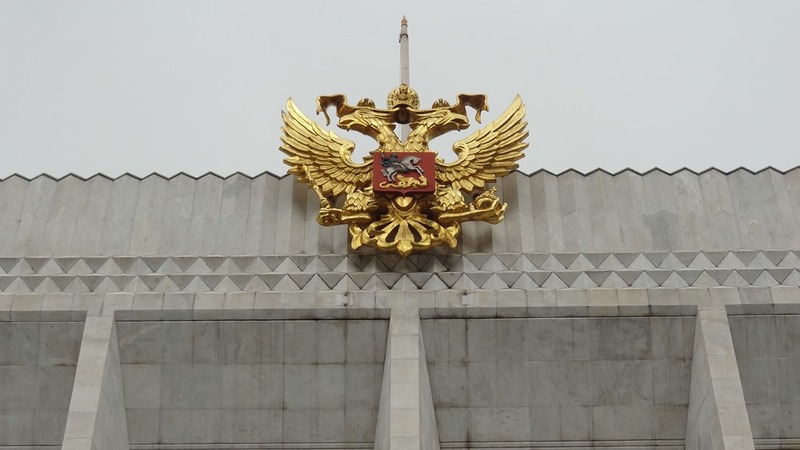 Instead of trying to figure out the bus, I decide to just walk – or rather run – to the palace. It’s a mistake, the bus would have been quicker. Still, I arrive at the square in front of the palace just before noon. There is quite a crowd but the square is big and I get a ringside place. The changing of guards is a long process, I need not have run at all. 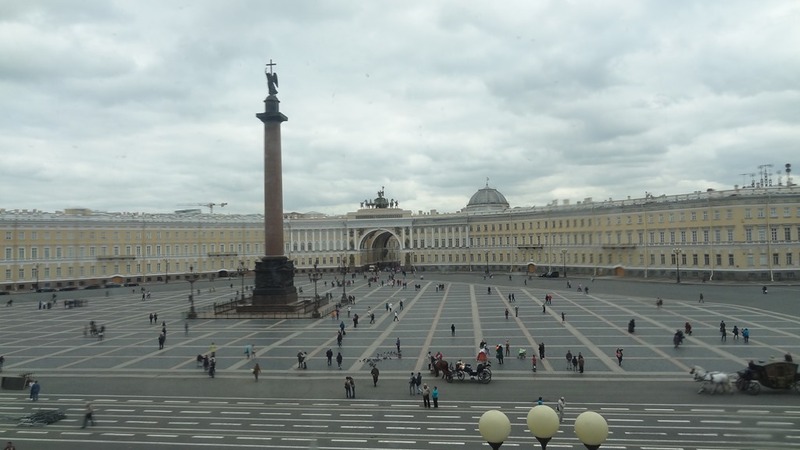 It is an impressive square. 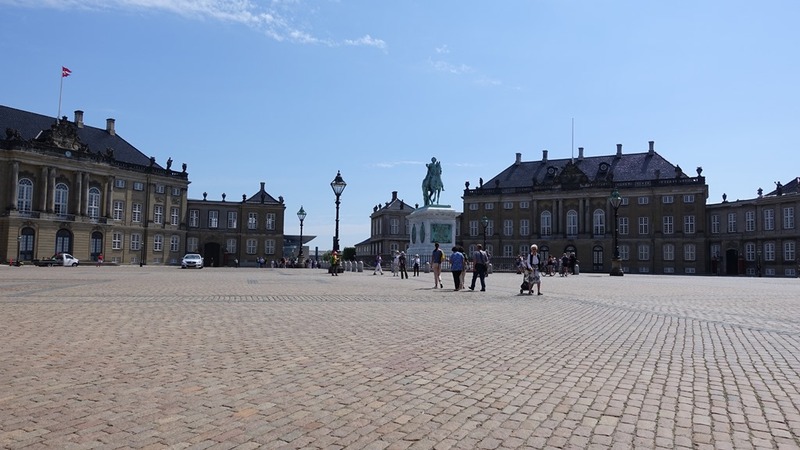 There are four palaces arranged around a central statue of King Frederik V from 1771. One of the four palaces is open as a museum about the royal family. 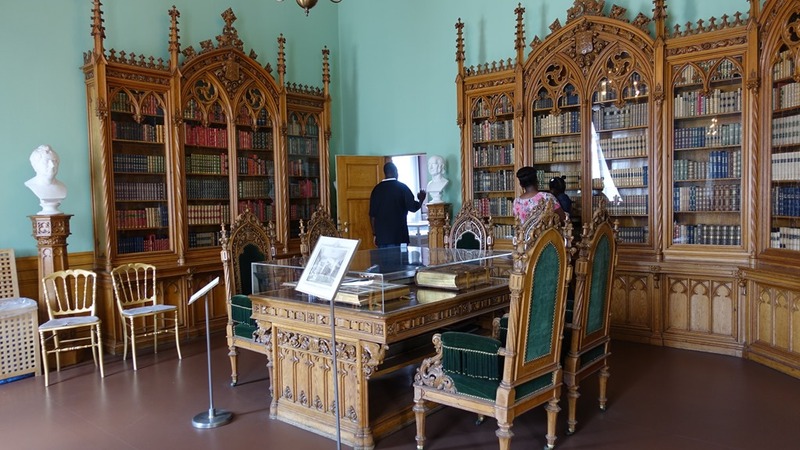 There are some well preserved rooms on display, such as Christian Xth study above. However I don’t find this museum very interesting; perhaps it is just a matter of too many palaces in too short a time! I spend about 30 mins here. 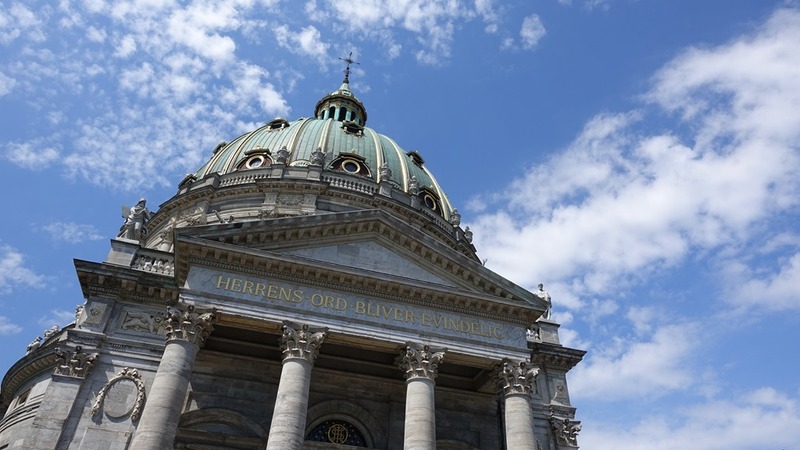 I walk across to the Marble Church which is close by. The Dome is very impressive! I spend only a few minutes here. 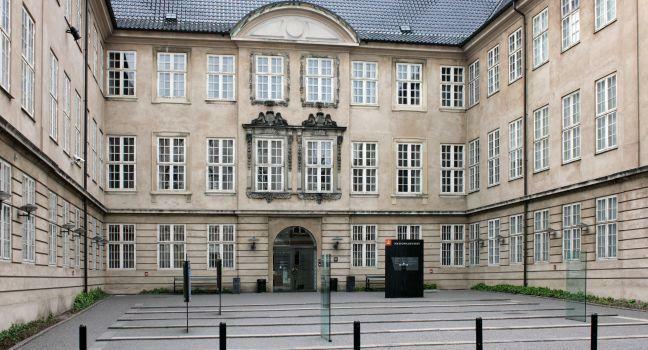 My next port of call is the Hirschsprung Collection, an art museum. As there doesn’t seem to be any convenient bus, I decide to walk it. I realise on the way that I am hungry..it is such an inconvenience, this hunger! Such a waste of time when I could be doing something else! I can’t spot any likely café on the way so I stop at a supermarket and pick up a Danish pastry and a yoghurt drink. I settle down under a tree in the King’s garden to enjoy a little rest and my picnic lunch. I am just at the right time to enjoy gardens as the flowers are all blooming! I am rather hot by the time I reach the Hirschsprung collection. I am wondering if this would be worth the effort. I am blown away by what they have, what a treasure! They have a free mp3 audio tour which is very good. I learn a lot about some excellent Scandinavian artists. I want their catalogue but it is rather heavy and won’t fit in my hand baggage. They tell me I can buy it online..note to myself, do this soon! 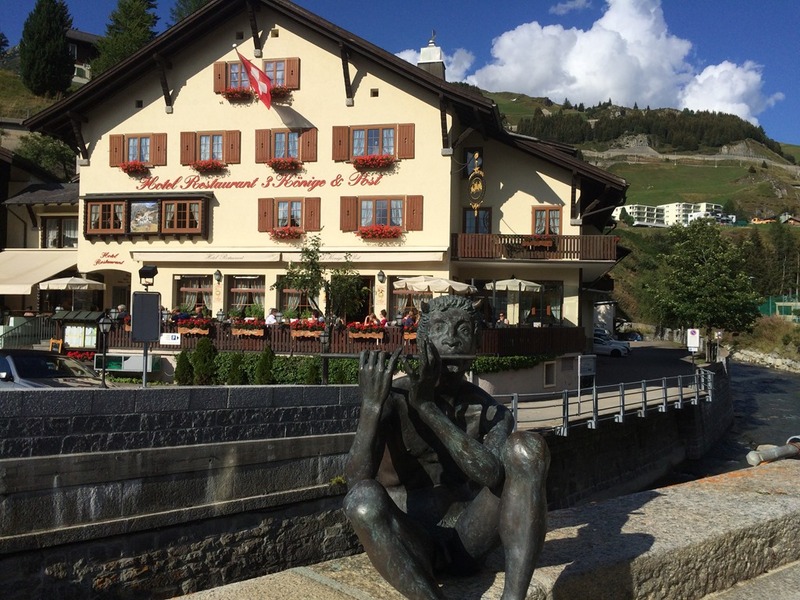 I head to the Town Hall square to take some pics. A nice square, very busy. Then I walk through a pedestrian area towards the Canal. 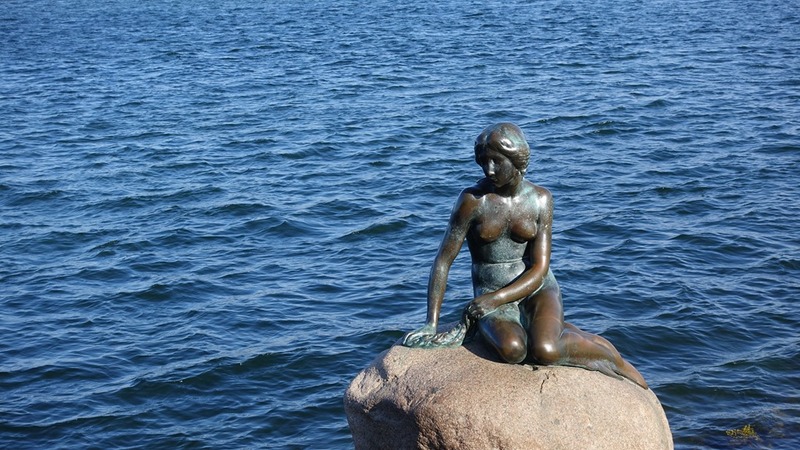 My intention is to catch the Harbour Bus Number 902 (included in the Copenhagen card) which has a stop close to the Little Mermaid. The boat ride is pleasant. The statue is about a 10 min walk from the stop. There is a good crowd there. I am not sure why there is such a song and dance about it, but it is the statue to take a picture of in Copenhagen and so I too join in. I then walk through the Citadel and the pretty park around it and head to the bus stop. I am done. I go back to Wagamama where I am assured of a tasty dinner before going back to the apartment. Tomorrow at noon I fly back home. This has been a great little holiday, I am content. I confess, I was very nervous about visiting Russia. Memories of Soviet era stories lingered in my mind, leaving a sense of unease. Latter stories about the political situation or the Mafia didn’t help either. Russia has had some bad press, hasn’t it! Yet, I wanted to see the art galleries in Russia so very much! So when my friend suggested doing a trip together, I raised Russia as an option. She reacted with enthusiasm but like me, was a bit wary. So, instead of setting off by ourselves, we decided to go with a package tour. 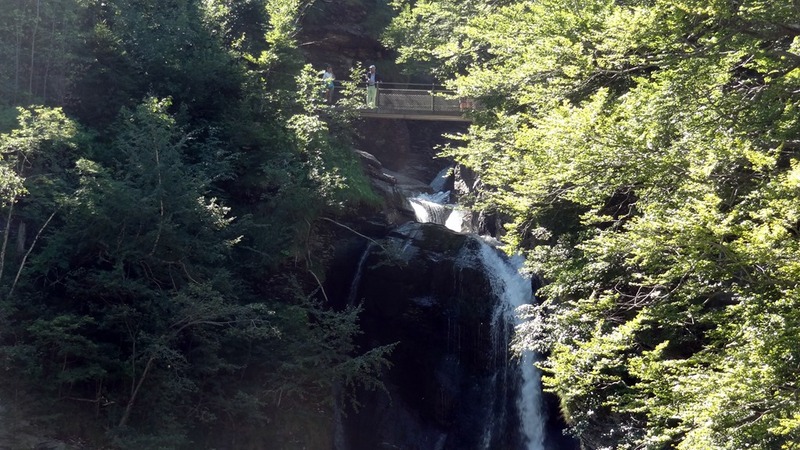 The last time I went on one was 30 years ago, so I had my hesitation about this too…but it seemed the safer option. After doing a fair bit of research, we ended up with Cox and Kings package which included 3 days in Moscow and 4 in St Petersburg. 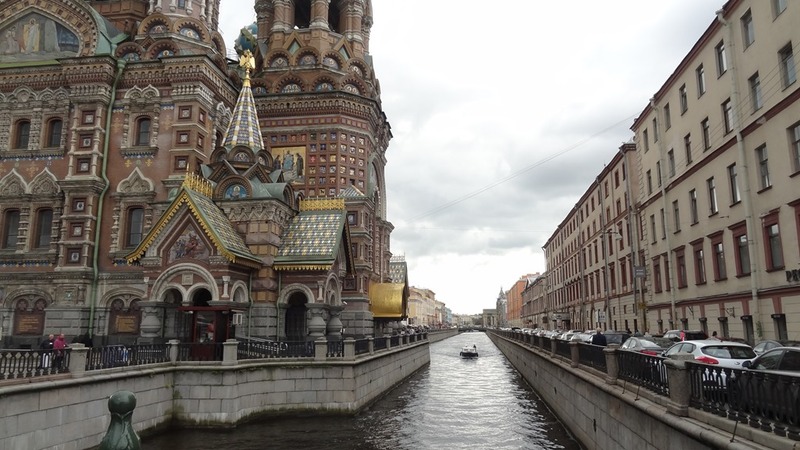 We joined the tour directly in Moscow and extended the stay by one day in St Petersburg. We flew into Moscow and out of St Petersburg. I considered taking the train to get to our hotel in Moscow but did not fancy dragging my suitcase up and down the Metro stairs. I found that Lingo Taxi had a good reputation and booked transfers via the internet. This worked perfectly; I was sent the driver name and car number the day before I travelled and we were met by an English speaking driver at the airport. In retrospect, this was a good decision because we did not find escalators in the Metro stations we used. 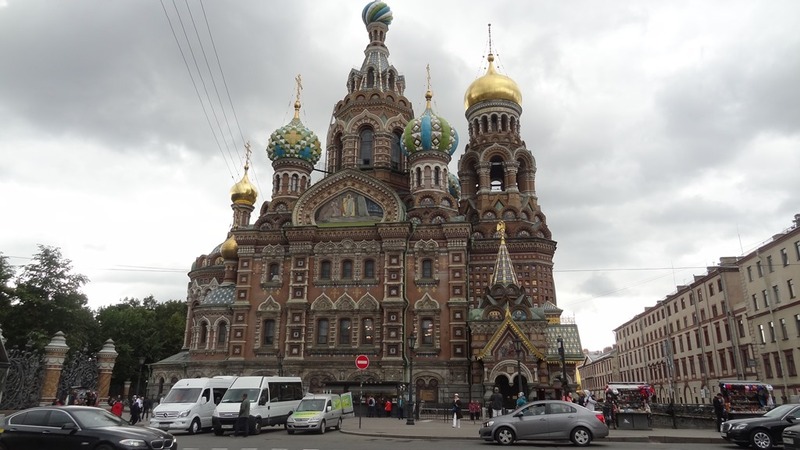 Our pick up at St Petersburg went without a hitch as well. I am happy to recommend the services of Lingo Taxi. We arrived late afternoon; it was past 6 pm when we settled into our Hotel National. 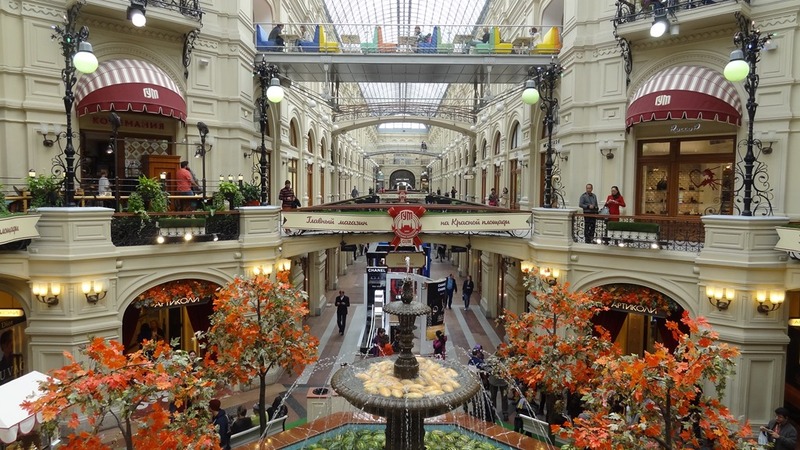 It is right across from Manezhnaya Square, just a minute away from the Red Square. The hotel is old fashioned but very nice. Breakfast was excellent. The location was just perfect, couldn’t be better! This was the view from our breakfast table! There is a well-reputed Italian restaurant in the hotel with equally good views. 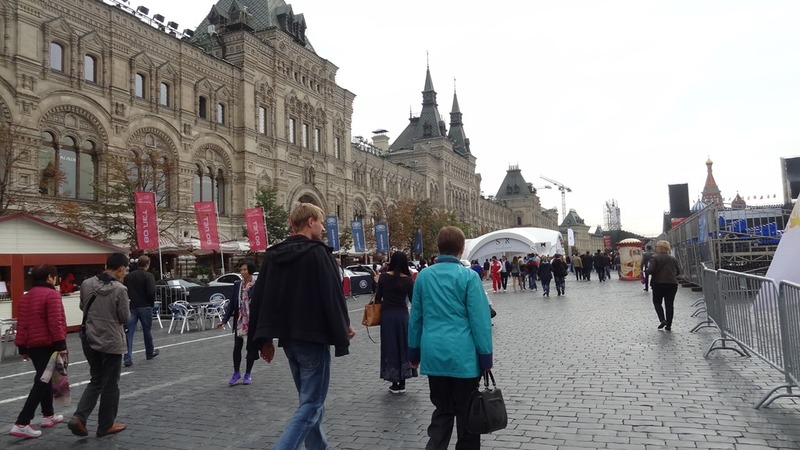 After settling in the hotel, we went to explore the squares just across from our hotel, both just outside Red Square. 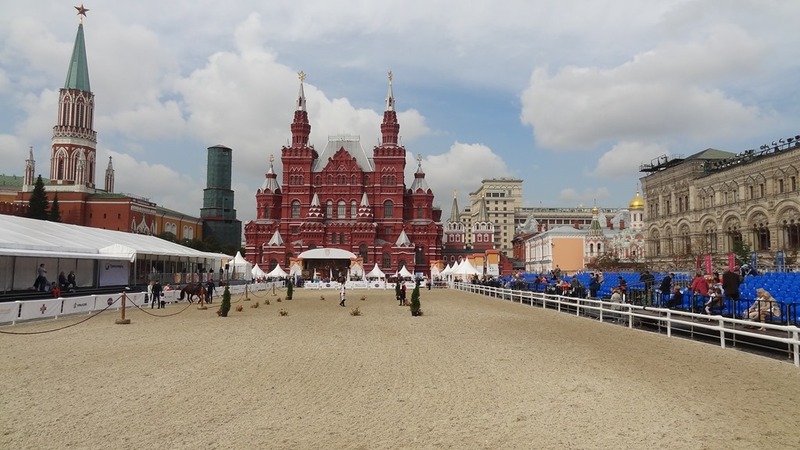 The Red Square was closed for Moscow’s 868th birthday celebrations. 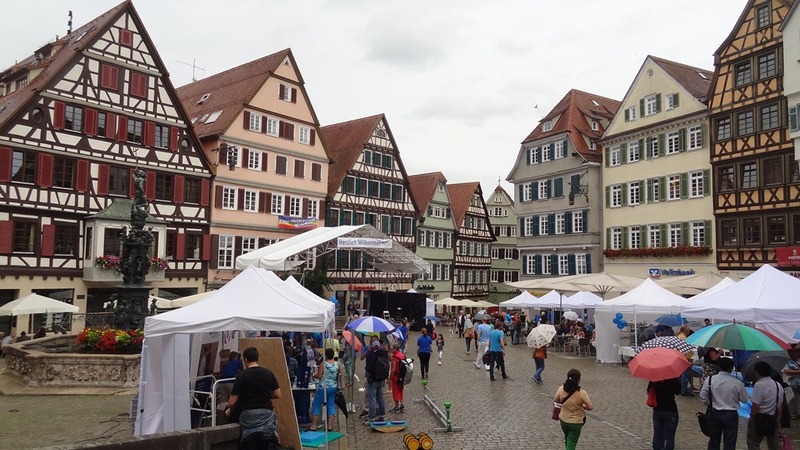 There was much activity in these squares with stalls selling local arts and crafts. A lot of police presence as well. I had downloaded the Yandex Translation App (free) before this holiday. The great advantage is that it works offline, with no roaming charges. It even speaks aloud!! I promptly tested my app on unsuspecting stall holders and even with the police; I got a lot of giggles and laughs, but it worked fine! I highly recommend this app if you travel in Russia as English is not spoken commonly. 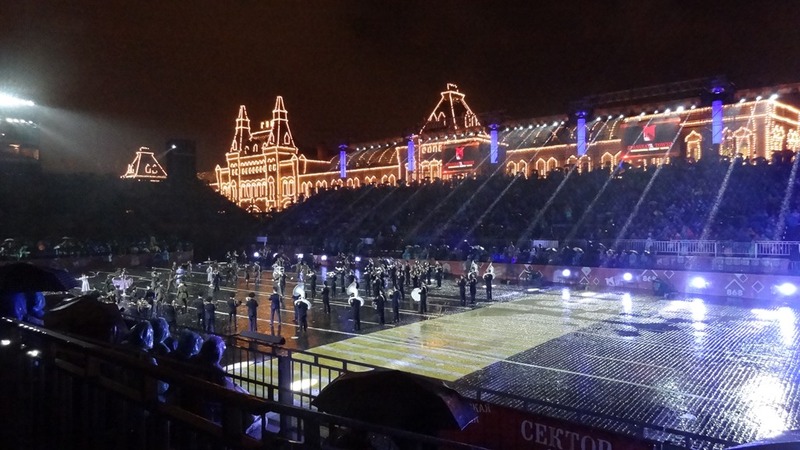 We saw that tickets were available for a Military Tattoo in the Red Square for the next night. I successfully used this translator to buy the tickets on the date we wanted! A city tour was included in the package but it was a total wash out. 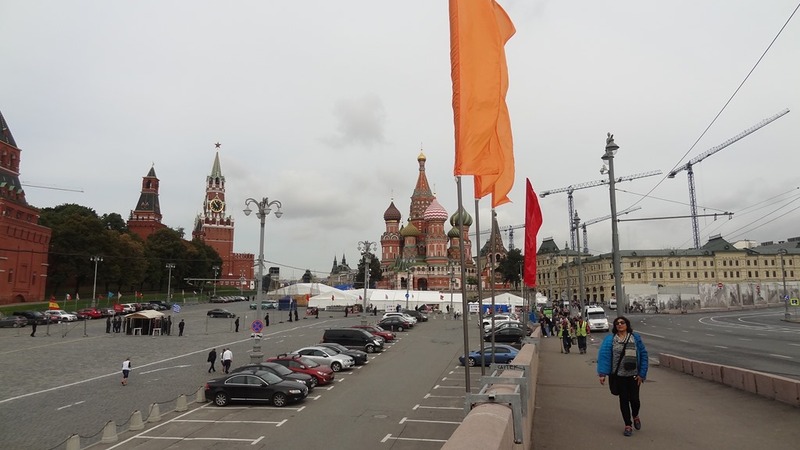 Thanks to the Moscow city celebrations, the Red Square was closed and traffic disrupted. 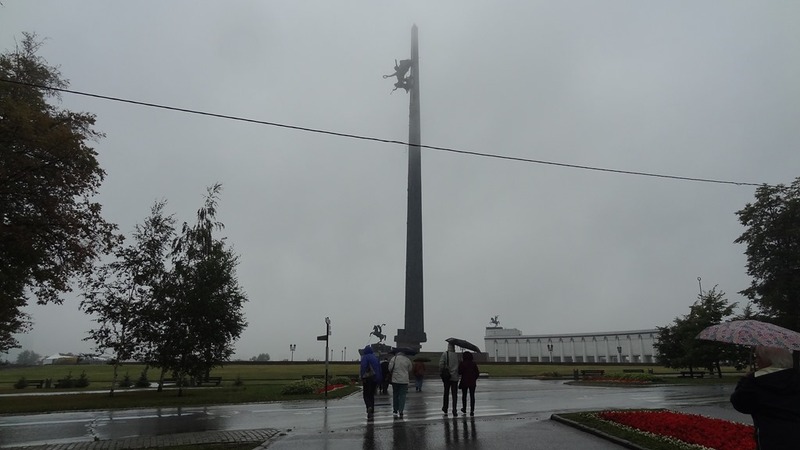 We were taken to some less important sights, such as the Poklonnaya Gora or Bow-down Hill and the cemetery. All this was also a wash out because of the rain. A great disappointment. The only good part of this morning was a visit to the Cathedral above. This is an impressive structure and quite beautiful inside (no pictures allowed). 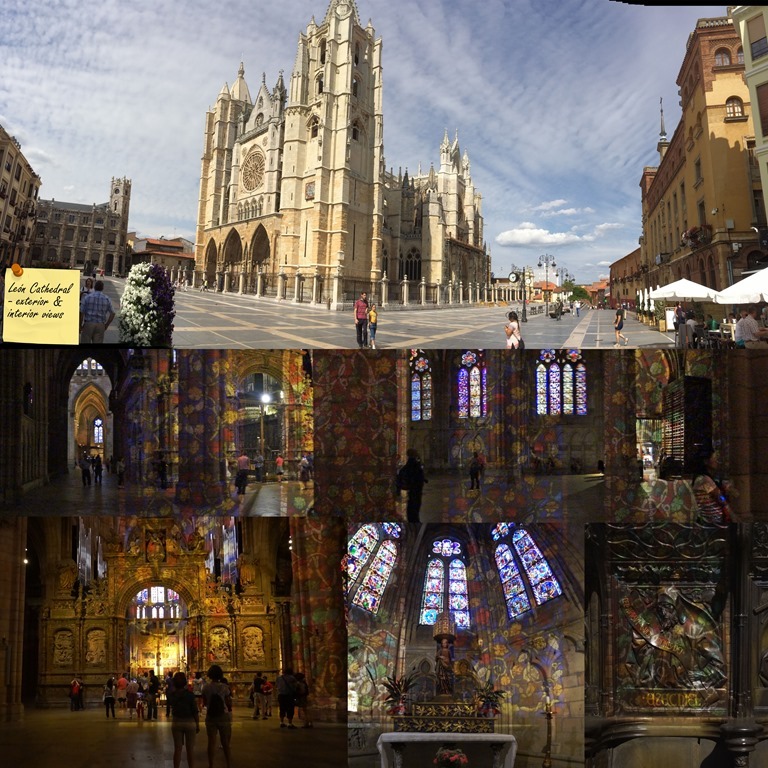 I was intrigued by how different it was from the many Cathedrals and churches I have seen in Europe. 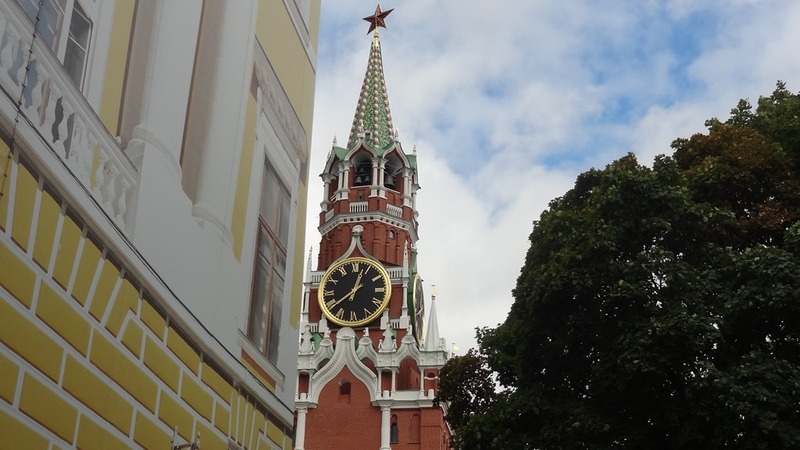 The original had been destroyed by Stalin in 1931; this church was built within an incredible 5 years (1995-2000) . It is an exact replica of the demolished Cathedral. There is a metro station very close by. 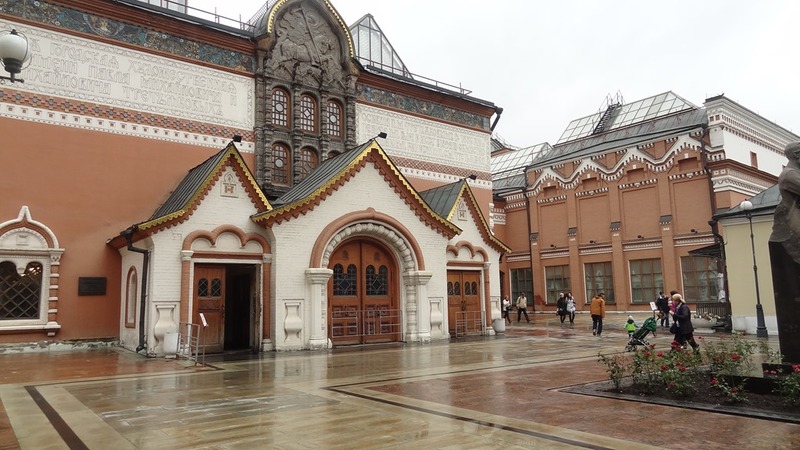 That afternoon, we made our own way to the Tretyakov Art gallery. The Metro was quite easy to manage on our own; the Yandex Metro app that I had downloaded was very useful. The other app. that I use extensively in all my travels is City Maps2Go. I download the map of the places we are visit before leaving home and mark all the places of interest, hotels etc. I use this to navigate when I am out and about. As it works offline using only the GPS in your smartphone for positioning, there are no roaming charges. An invaluable app! At the gallery I took the audio guide which was quite good. It took almost three hours to make our way through the gallery. 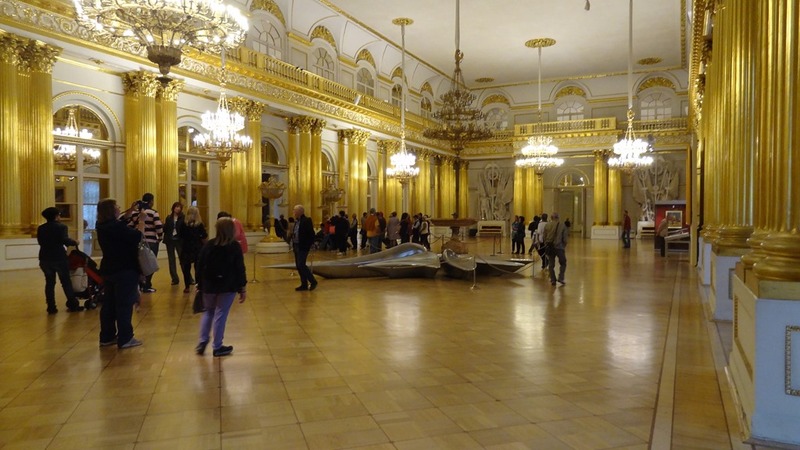 I found the visit a great learning experience as I was not familiar with Russian artists. Some wonderful pieces of work here..loved it! Today was a free day in our itinerary. As we set off to explore, our way was blocked in all directions by barricades and stern policemen. It was so frustrating! We must have walked 30 mins to reach the Bolshoi theatre which is just a 5 min walk from Hotel National! The theatre looks very stately and impressive. I had tried to get tickets for a show online but it was shown as ‘sold out’. However, our guide procured tickets for some of the others in the group in the ‘black market’ with a grand mark-up! Quite a racket, to be sure! 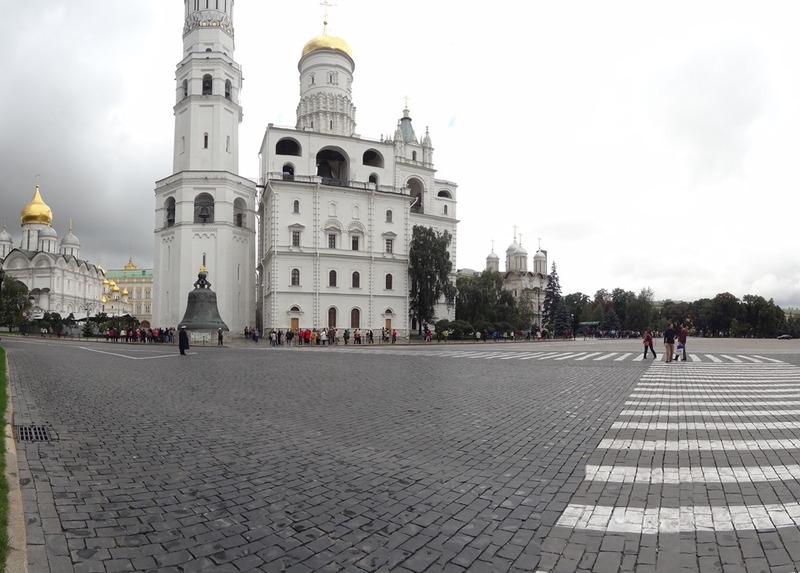 Just getting to the Red Square was an adventure. We walked around in circles and tried many avenues until they finally opened the barricades at 11:30 am. Crowds just poured in! The square was taken up by the stalls for an equestrian performance and another for the Military Tattoo. So we didn’t really see the square in its glory. The red building above is the history museum which we did not have the time to visit. 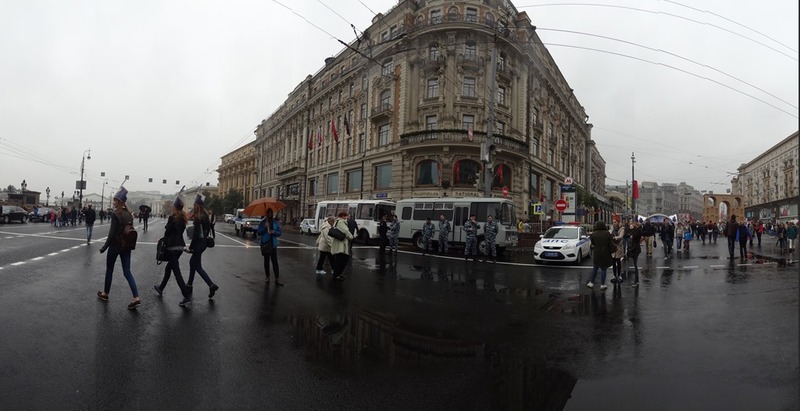 Along one side of the Red Square is the Gum Department store. What a marvellous old building! We had lunch in a cafe inside; it was the worst sandwich I’ve ever eaten! This iconic Cathedral is so unusual and arresting! The exterior is very flamboyant and quite charming. 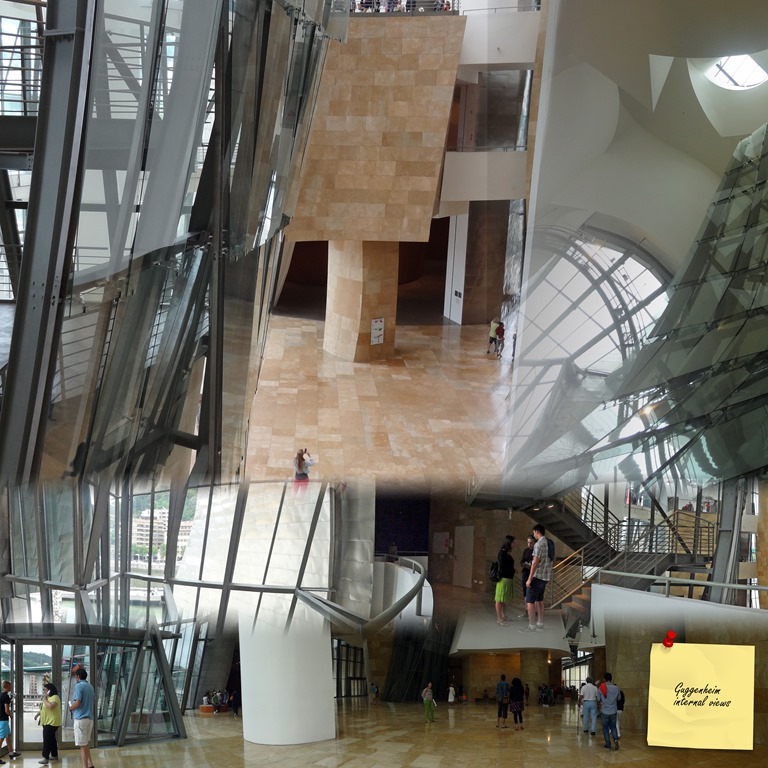 After walking around and taking pictures from all possible angles, we went for a (paid) visit inside. It is essentially a museum. Some of the icon screens were very interesting to look at but otherwise I was rather disappointed with the interior. 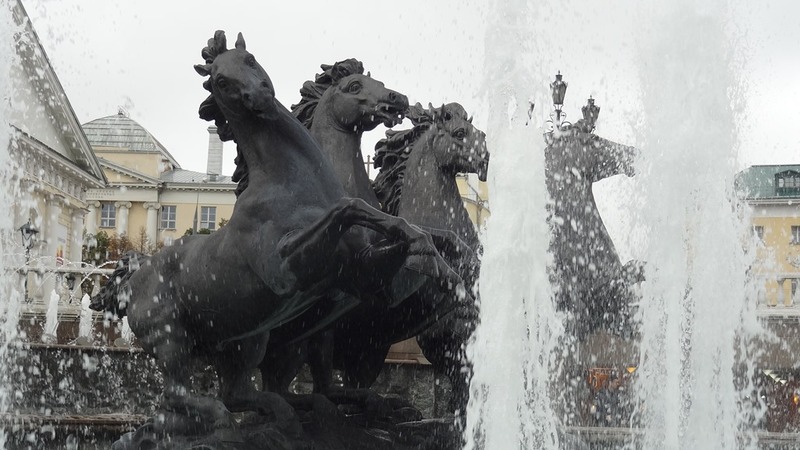 After having heard much about the Metro Stations in Moscow, I had considered finding a guide to take us around. But then I like to do things on my own, so I did some research to find a good route to take. We visited (in order) Ploschad Revolutsii with some great sculptures, Arbatskaya with its beautiful ornamentation and chandeliers, Kievskaya with its amazing mosaics, Mayakovskaya with its stunning marble floor and strong columns, Novoslobodskaya with its wonderful stained glass artwork and finally to Komsomolskaya with its Baroque ceiling, marble columns and chandeliers. 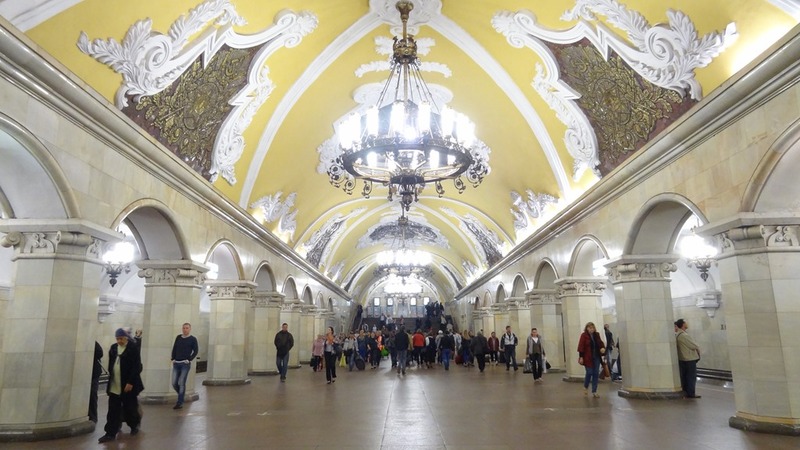 For the price of a Metro Ticket (50 Roubles), we spent a fun couple of hours visiting some of the most impressive stations. Warning : Lots of steps to climb up and down! After dinner and a bit of rest, we set off excitedly to see the Military Tattoo, the tickets for which we had bought on the first day. The setting was quite extraordinarily impressive and so was the show! It was raining buckets but we were determined to sit it out. Unfortunately, my raincoat was not sufficient for the deluge; my jeans got soaked and water seeped up all the way to my waist. I was so wet, cold and miserable that I finally gave in and abandoned the show. The Muscovites are a hardy lot; except for some families with children who left, the stands were all full! 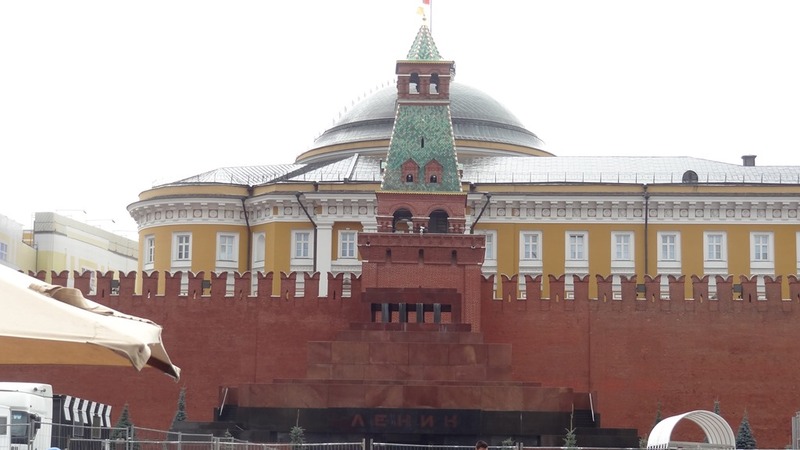 This morning, we had an organised tour of the Kremlin which was very interesting. 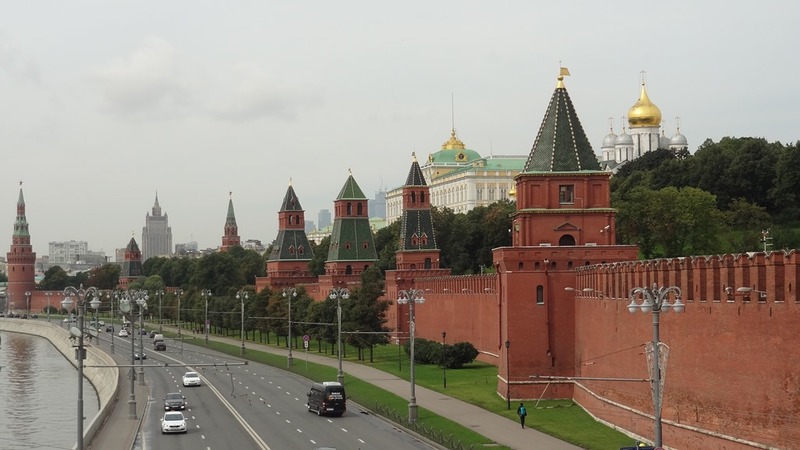 The Kremlin is a solid presence in the city; we had been seeing its walls every time we went out. This fountain was the first thing I noticed after we entered. What a marvellous sculpture! What an impressive square! 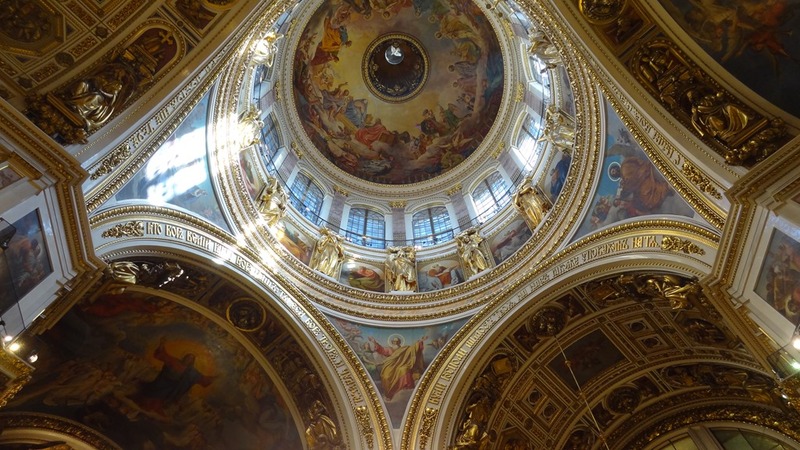 The Golden domes seem to surround you in all sides! 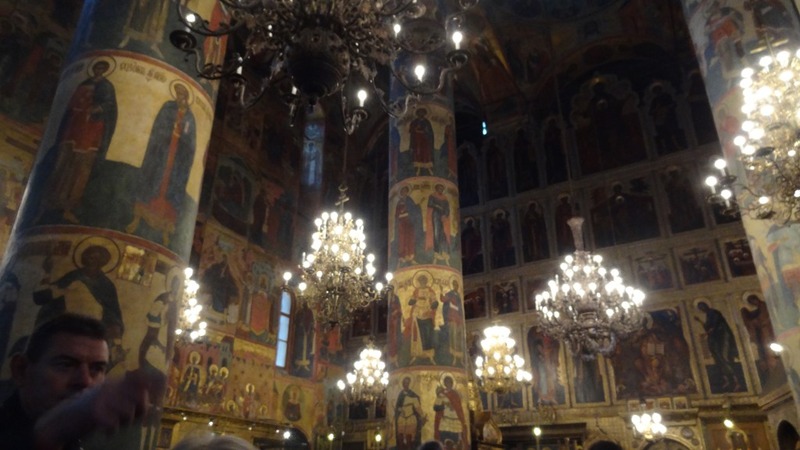 We went inside only the Assumption Cathedral. The disadvantage of being in a tour is that you cannot quite wander at will so I did not get a peep inside the other Cathedrals. Photos were not allowed inside; this rather poor shot was taken before I realised it. 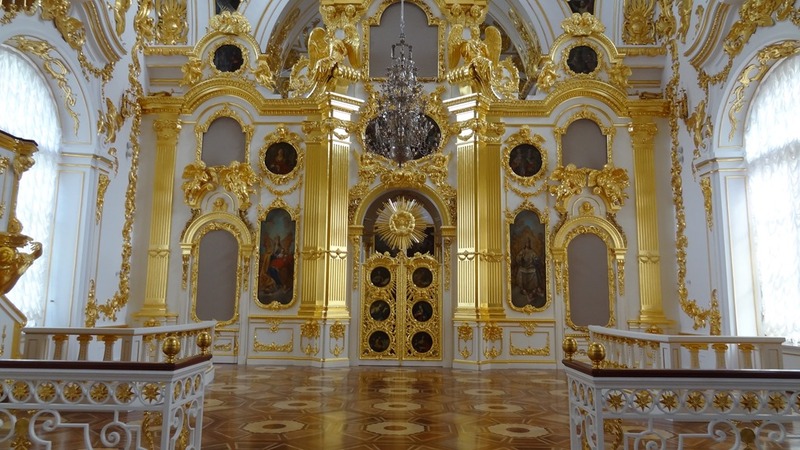 We also went inside the Armoury to see the simply jaw-dropping wealth of the Tsars. I’ve never seen anything quite like it…I was left quite speechless! Add this to your bucket list, its incredible. This large square behind the Cathedrals is quite interesting. 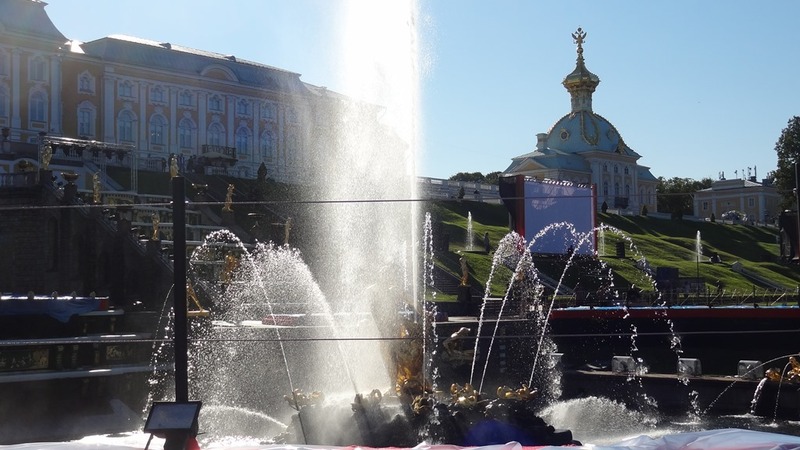 The Tsar’s Bell and the Tsar’s Cannon are both here. 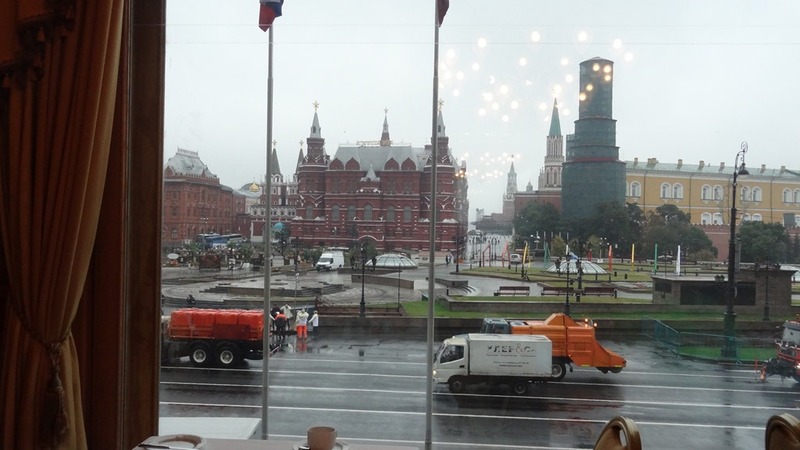 As is Putin’s office which is in the small yellow building in the distance above. 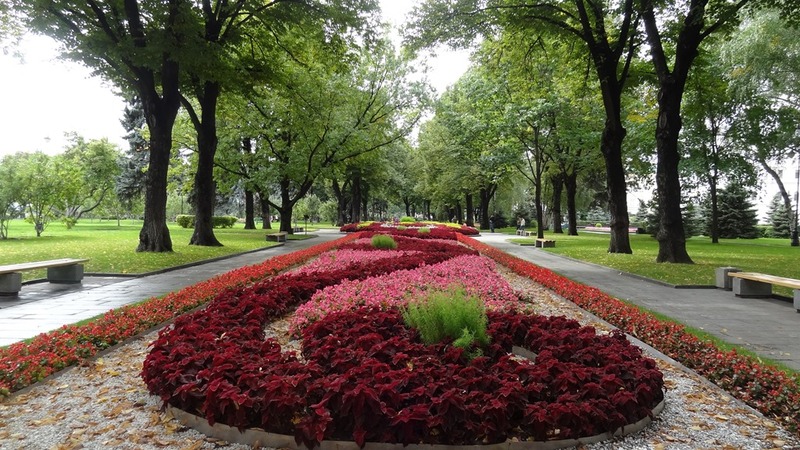 The formally laid out Kremlin gardens were beautiful with flower beds in bloom. 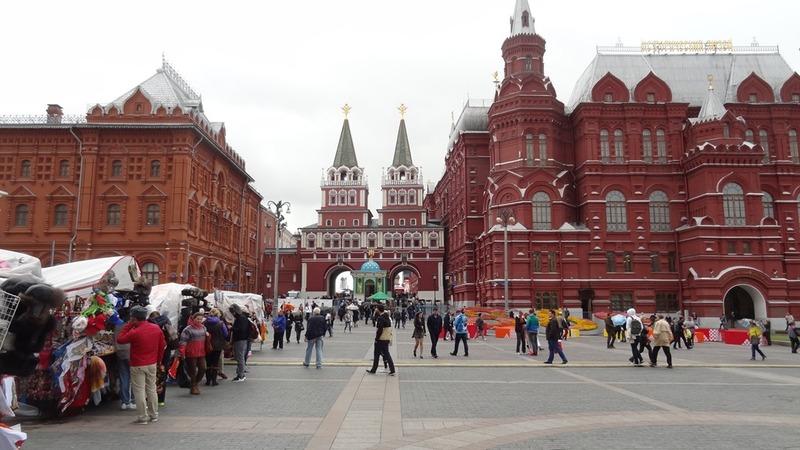 We exited by the Spasskaya Tower into the Red Square. 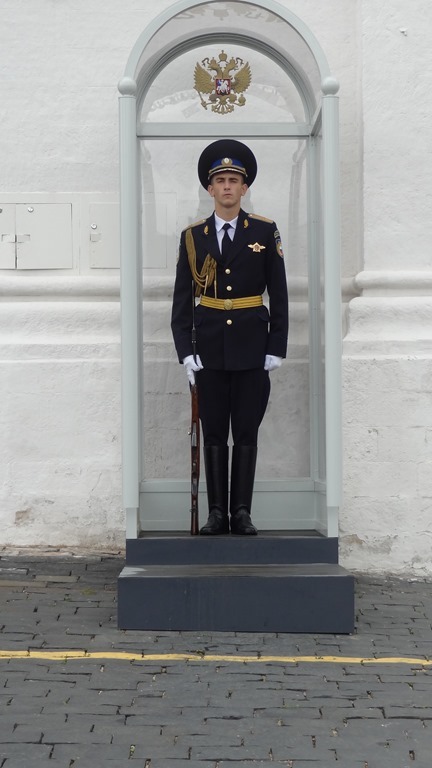 I couldn’t resist taking pictures of the young guards who stood stiffly beside the gates! 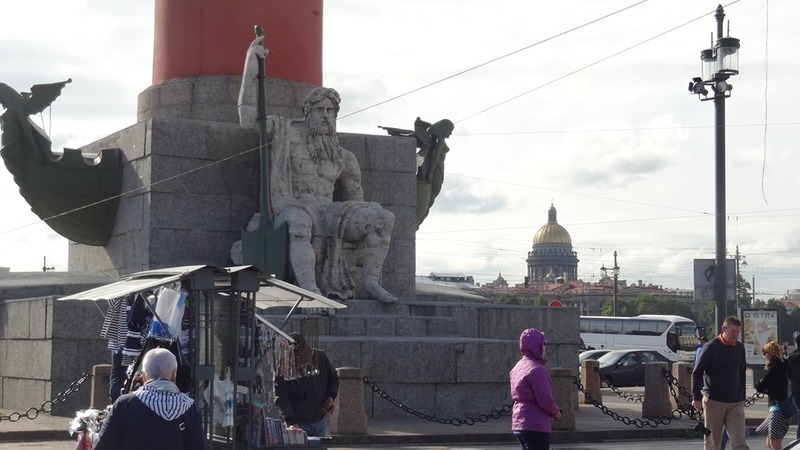 That afternoon, we were bundled into a bus and taken to the train station to catch a fast train to St Petersburg. Until now I had not seen anything that I didn’t feel confident of doing by myself. But this, I would have found quite difficult. There is security to enter the platform. The train didn’t come until later but the porters knew where to stand for our carriage. The train was clean and comfortable but the food on board didn’t appeal. I wish I had carried a small picnic meal for myself..
We were met at the station and taken to our hotel. A converted palace, it has a rich and interesting history. There were plenty of public areas but unfortunately not much natural light inside. Our room was great, we faced the canal above. They provided excellent breakfast. Above all, the location is simply perfect! Even if you don’t stay here, choosing a nearby hotel will be a good idea. We had a very nice organised ‘City Tour’ this morning. 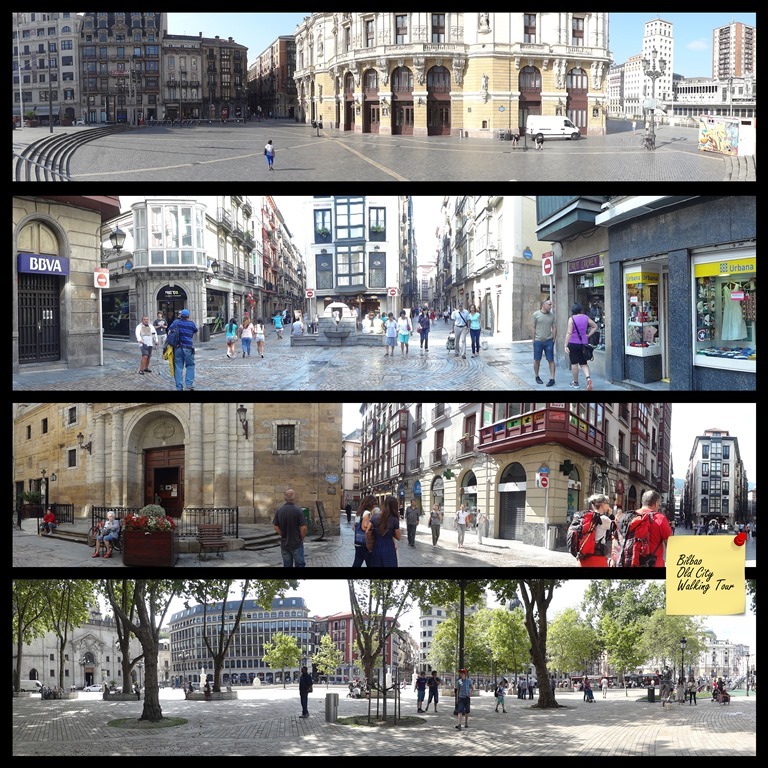 After seeing some of the important squares of the city, we headed to the Port area for a little stop. 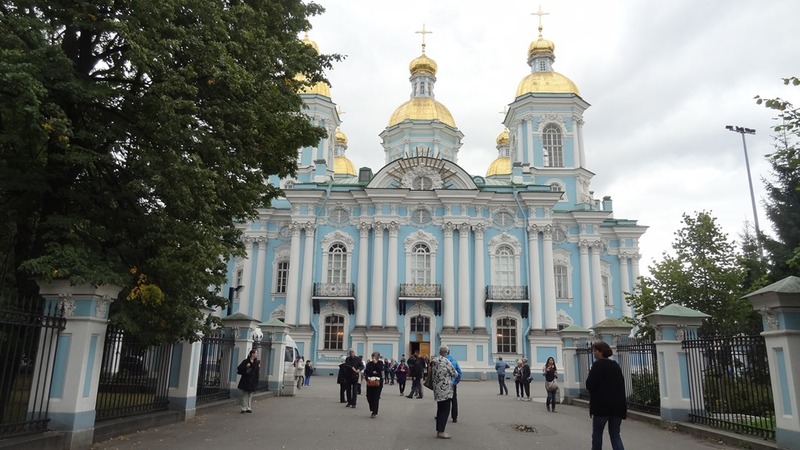 Then we headed to the Peter and Paul fortress where the main attraction is the Cathedral. 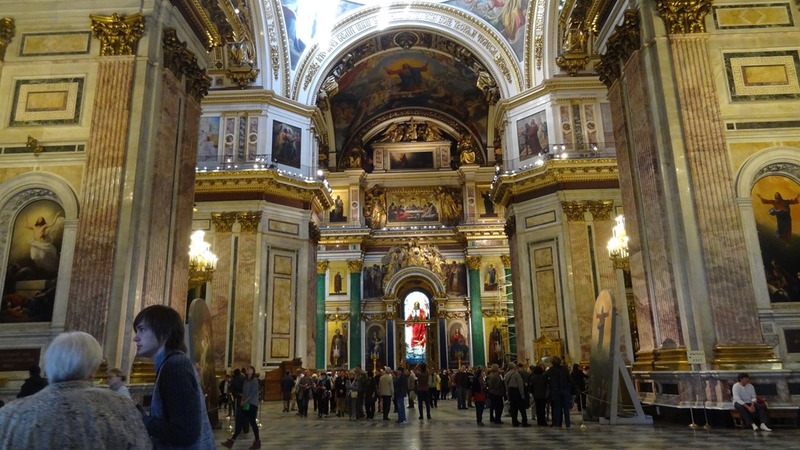 The interior of the Peter and Paul Cathedral is quite beautiful.A number of Tsars and Tsarinas are buried here. Our next stop was the iconic, exuberant church above. It was made to commemorate a Tsar killed by a terrorist (?) but it is nowhere near as sombre as the name suggests. Instead, it looks just joyous and flamboyant! I couldn’t help smiling when I saw it! The soaring lines, the myriad colours and the light streaming from the windows add to the joyous effect. Our last stop on today’s tour was at the Cathedral above. My mind was still reeling with the ‘blood cathedral’ ; on a sensory overload, I did not pay good attention to this Cathedral but I remember it being beautiful as well. 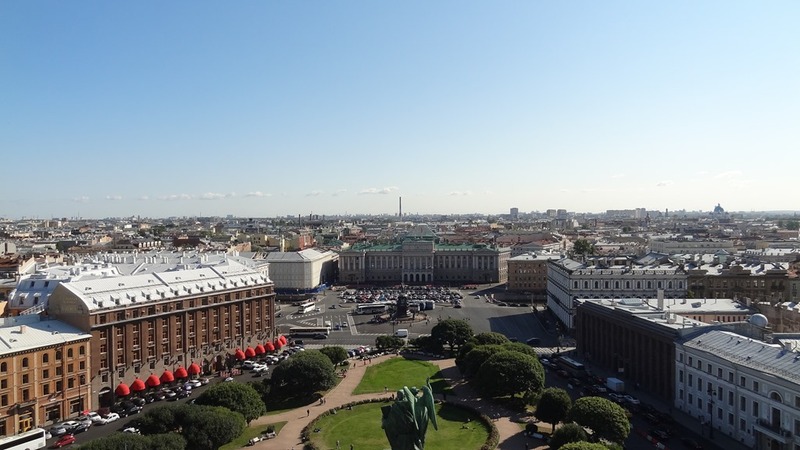 After some rest, we set off that evening to explore Nevsky Prospect, the busy and vibrant main arterial street of St Petersburg. 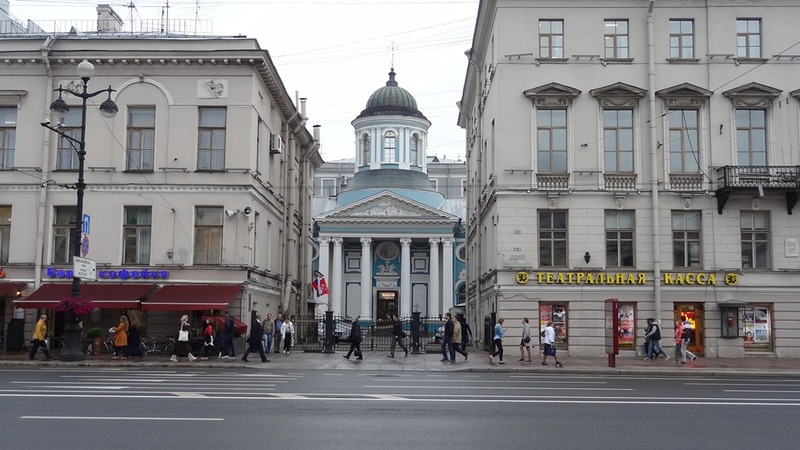 We visited the Armenian Church, the Catholic Church and even made a quick foray into the Great Gostiny Dvor Departmental Store. 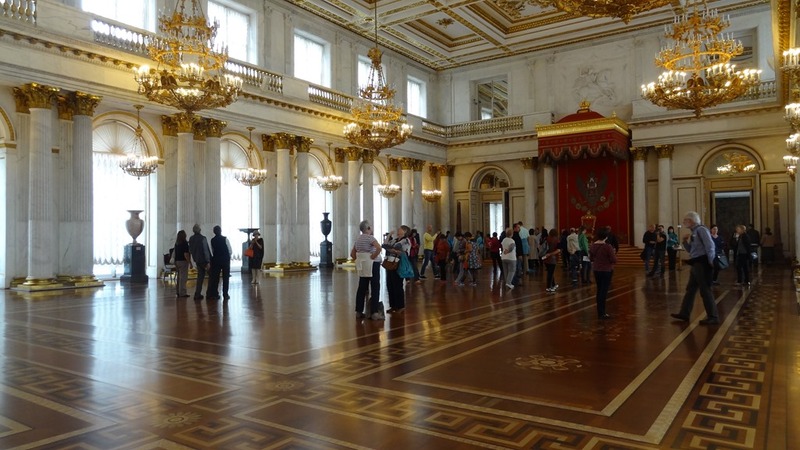 This was the day I was looking forward to from the very start..the day we get to visit the Winter Palace and the Hermitage. My very first sight of this beautiful square stunned me! I came back over the next couple of days and took many pictures in different light conditions. What can I say about the magnificence of this palace? The decor is over the top- gold and incredibly beautiful stones, gilding and wood, plaster work and glass…it was all quite overwhelming! The painting collection in the Hermitage (both buildings) is quite amazing. And then the richness of the objets d’art! As an art lover, I was in heaven! Our guide did an excellent tour of the Palace and the classical art. Most of the group went on an optional cruise but I chose to stay behind and drool over my favourites. 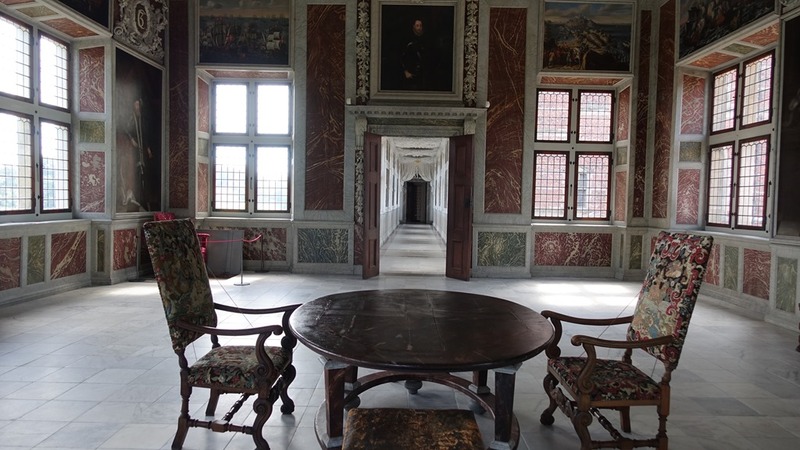 There were also a number of rooms that the tour did not cover; I was determined not to miss a single room.. I was lucky that the impressionist gallery (separate ticket) was open till late. It is just across on the other side of the square. The collection is quite superb; don’t miss this! By the end of the day, I had spent 9 hrs. inside the museums; except for a 30 min lunch break, I had been on my feet all the time. I limped my way back to the hotel in a happy daze! I also came away with a heavy gallery book and a lovely necklace in Malachite to remind me of this amazing day! 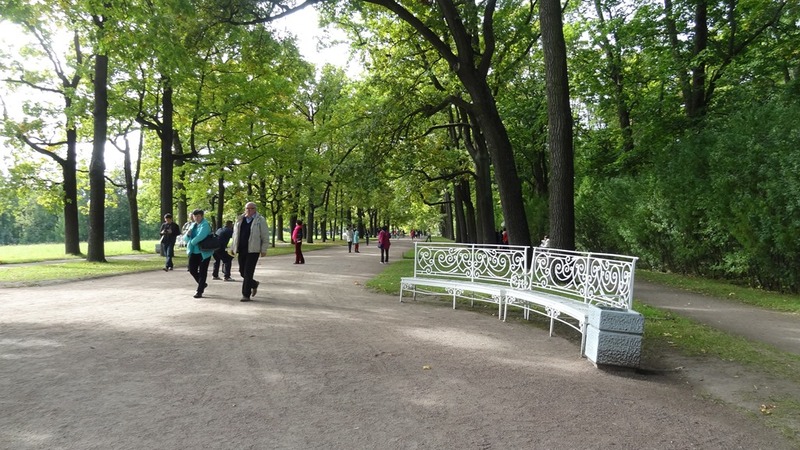 Today there was a whole day tour organized to visit Catherine’s Palace and Peterhof. It took us about an hour to get Pushkin (35 km). 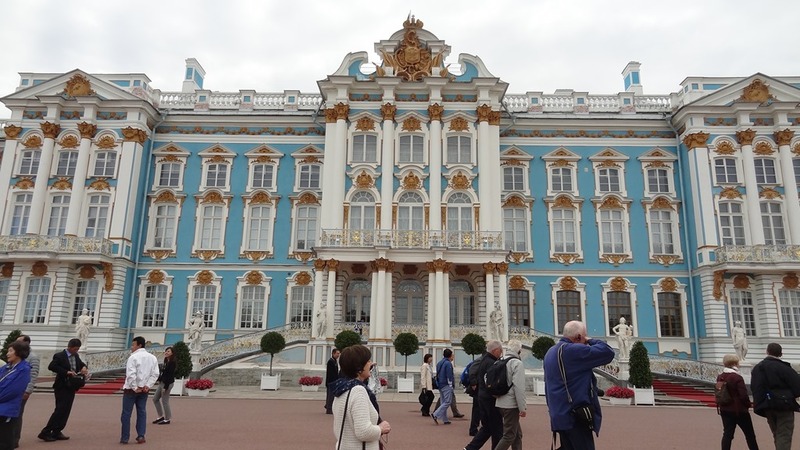 Catherine’s Palace was built in the 1700’s. 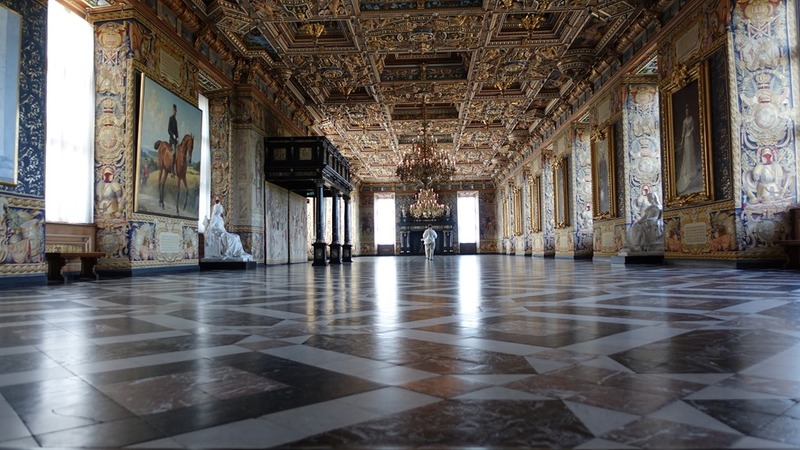 It was commissioned by Catherine I as a summer palace; subsequently Elizabeth of Russia completely reconstructed it. 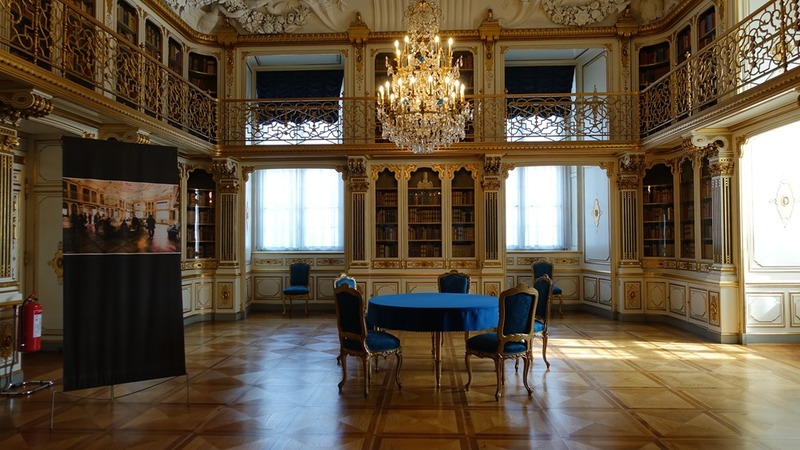 Catherine II had parts of it redecorated. Damaged heavily during German occupation, restoration work continues to this day. This was the richest palace I’ve ever seen! Quite amazing! The glitter and gold overtakes everything but if we put that aside, there was much else to admire. 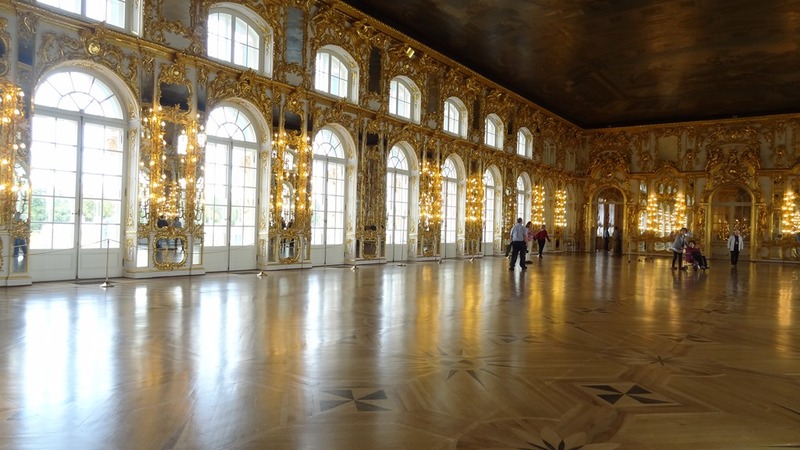 The famous Amber Room was quite astounding! Photos were not permitted in that room, check out it’s history in this article. 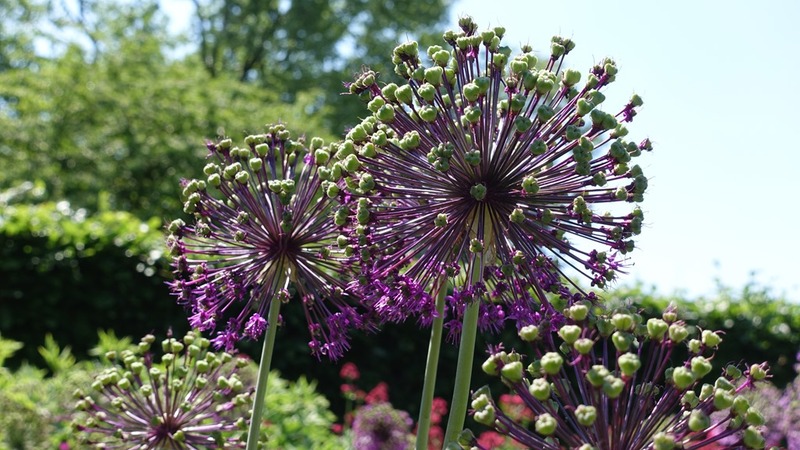 After seeing the riches of man-made objects, it was sheer pleasure to see the beauty of nature in the extensive gardens. 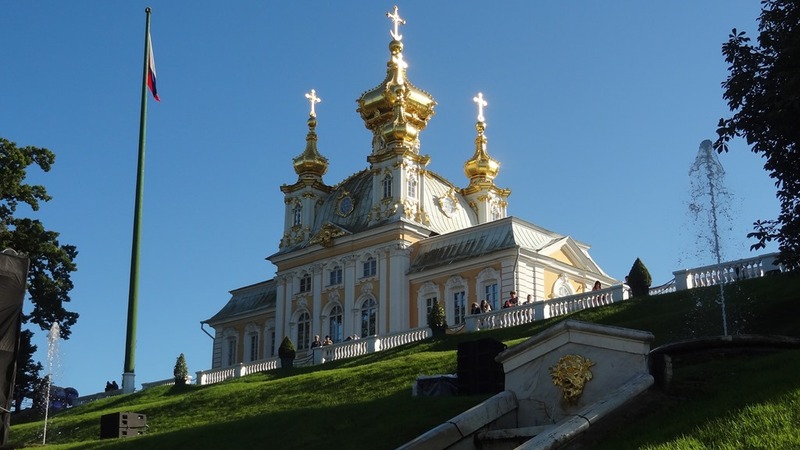 Known as the Russian Versailles due to the beautifully laid out gardens, Peterhof is about an hour’s drive (50 km) from St Petersburg. 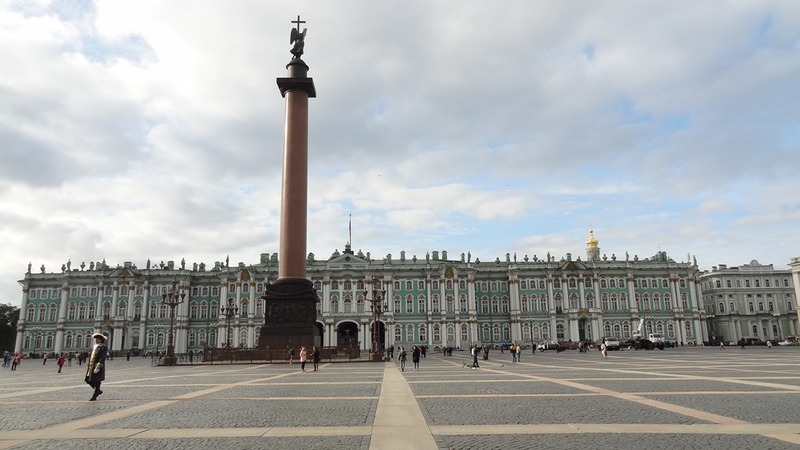 Built in the 1700’s by Peter the Great and then by Elizabeth of Russia, it was looted and destroyed during German occupation. The restoration work started immediately after the war and still continues. It is small compared to the other palaces we saw but still full of gilt and grandeur. The gardens and the fountains are especially beautiful. 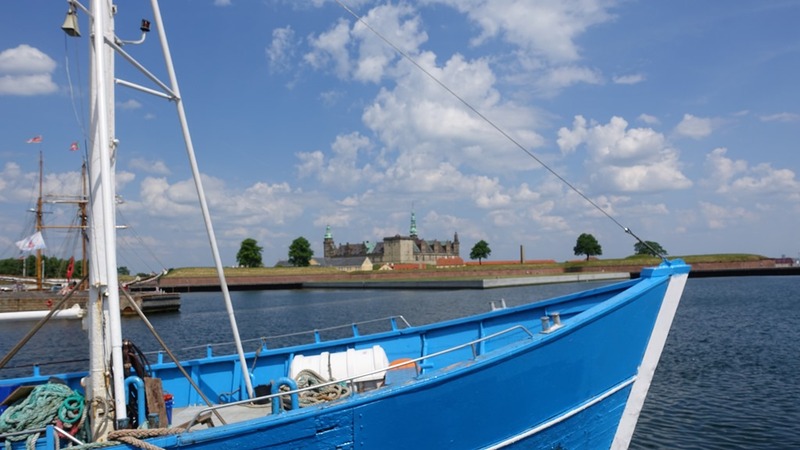 I was pleased to get my first glimpse of the Baltic sea from here! It took about 45 minutes to get back to town from here. The tour of the two palaces took almost the whole day. 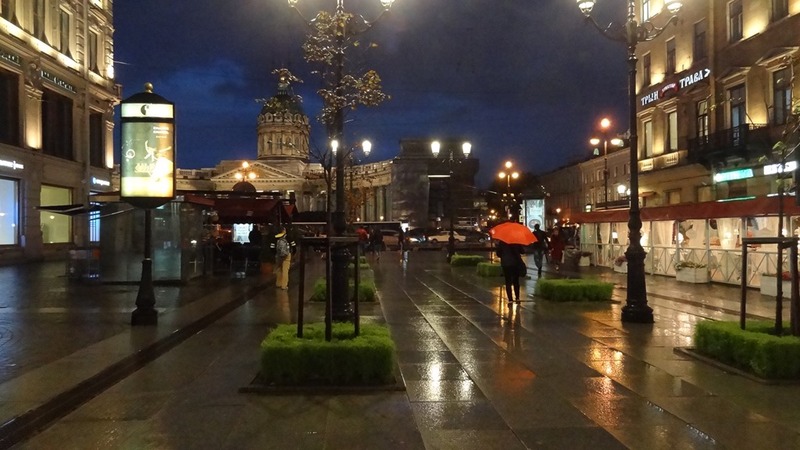 After resting a while, we went out to see the Kazan Cathedral before having dinner. 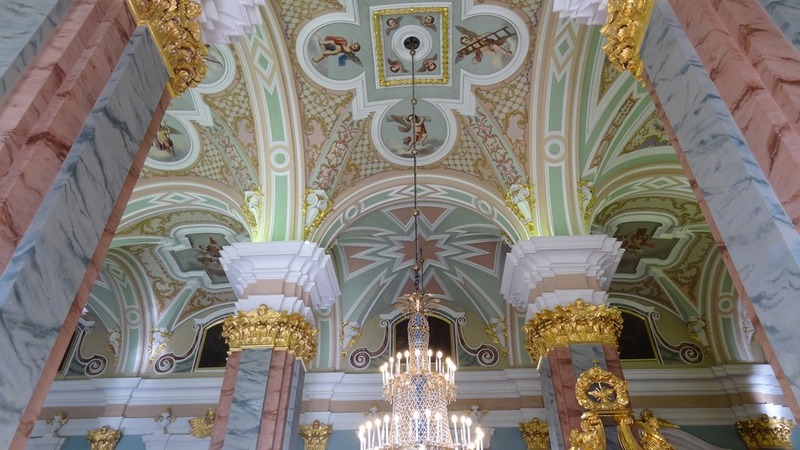 Another place of beauty; no dearth of them in St Petersburg. No photos were allowed inside. I had added this extra day at the end of our trip to cover a couple extra museums or monuments. 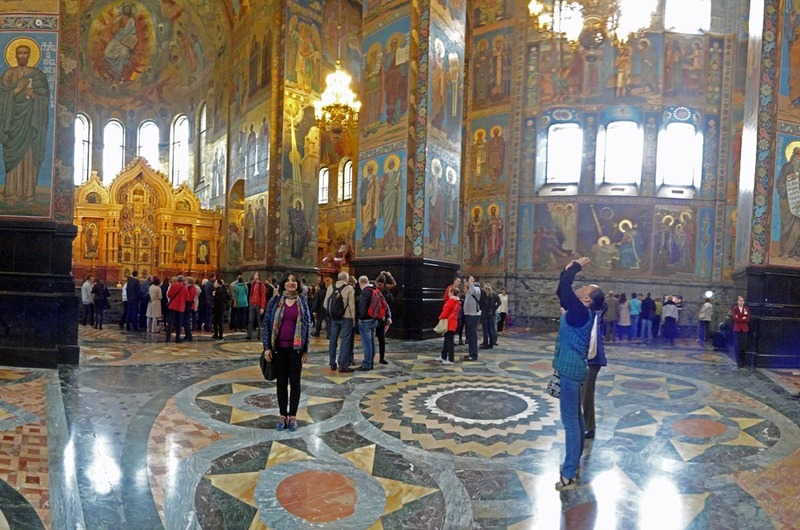 I had in fact wanted to see the Alexander Nevsky Monastery but my friend was not so enthusiastic. Instead, we took our guide book’s recommendation to see the exterior of the Summer Palace and gardens. 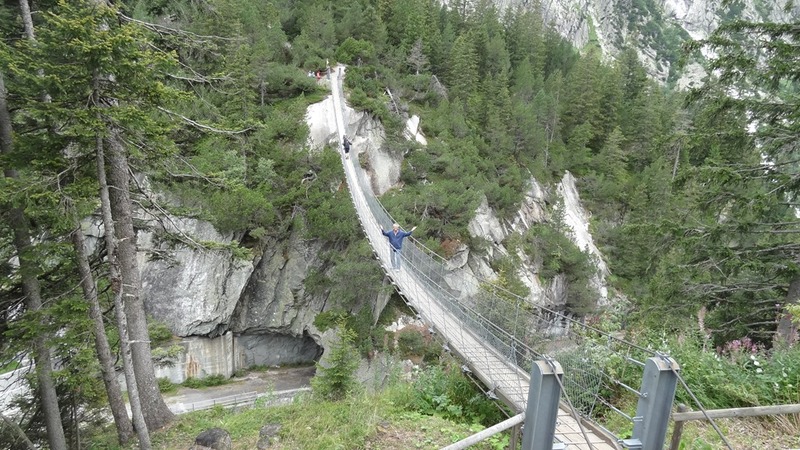 It was a much longer walk than I expected and in the end, not a very interesting experience. I regret not having made it to the monastery. 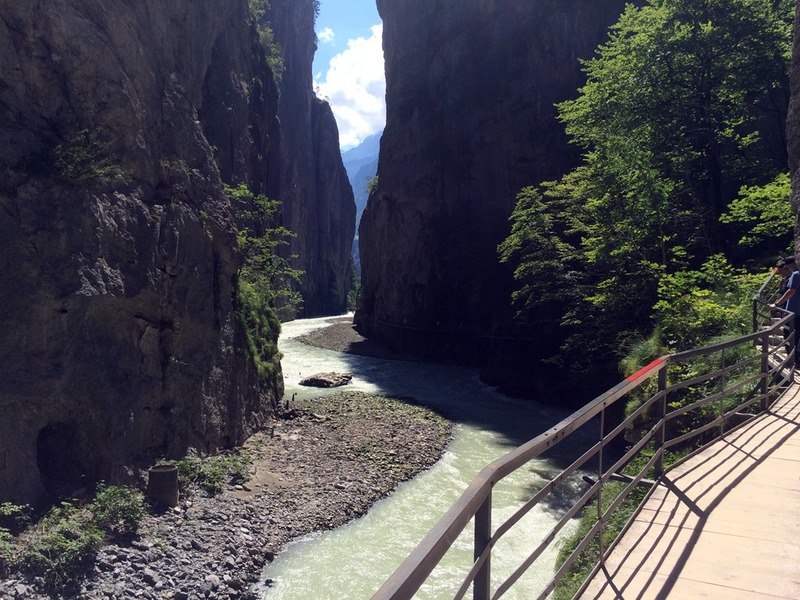 We then walked back along the river to St Isaacs which was simply wonderful. 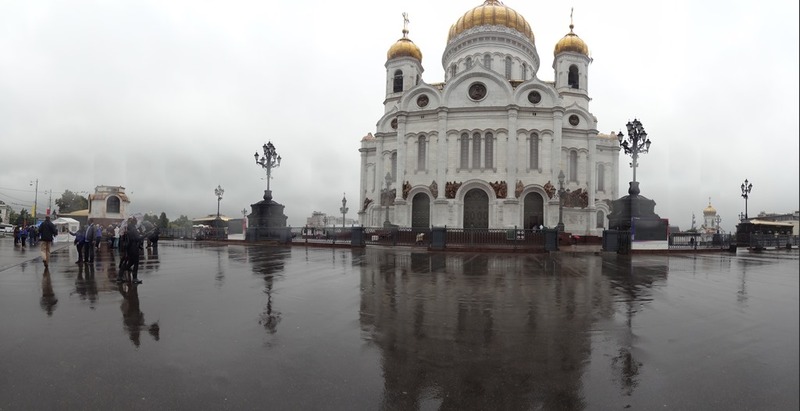 I thought I had seen the best of Cathedrals in Russia already when we made our way to this one. I was wrong! The fourth biggest is the world, it is quite an amazing Cathedral. It is very beautifully proportioned and decorated with some stunning artwork. I was especially impressed by the mosaics. They were so detailed! And the relief work on the huge doors was simply outstanding! 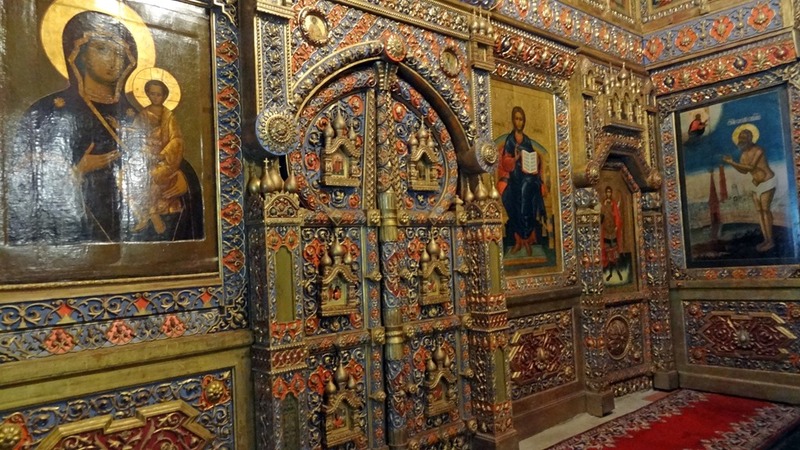 Reminded me of the doors of the Baptistery in Florence…they were equally remarkable! We walked up to the colonnaded walkway on the roof. It’s a climb but not too hard. The excellent views are worth the effort. 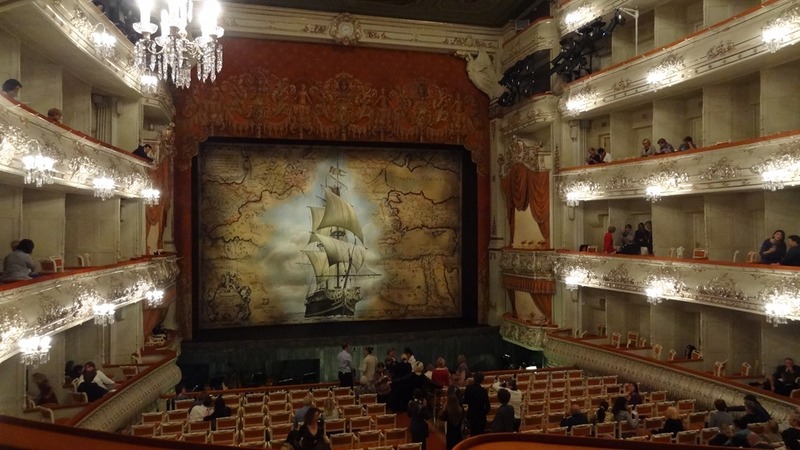 We managed to get some time to look at the shops before returning to the hotel to get ready for the ballet performance (Le Corsair) at the Mikhailovsky theatre. I had bought the tickets at a very reasonable price at this site. It is all in Russian; I used the browser’s translate features to navigate through it. I was even able to see the seats we would get, which was great! I paid using a credit card online and collected the tickets in their office on the first day. It was all very easy, there is no need to pay black market prices. The ballet itself was simply superb! I am so glad we got to see it! We enjoyed a leisurely breakfast this morning and set out to the airport with plenty of time. 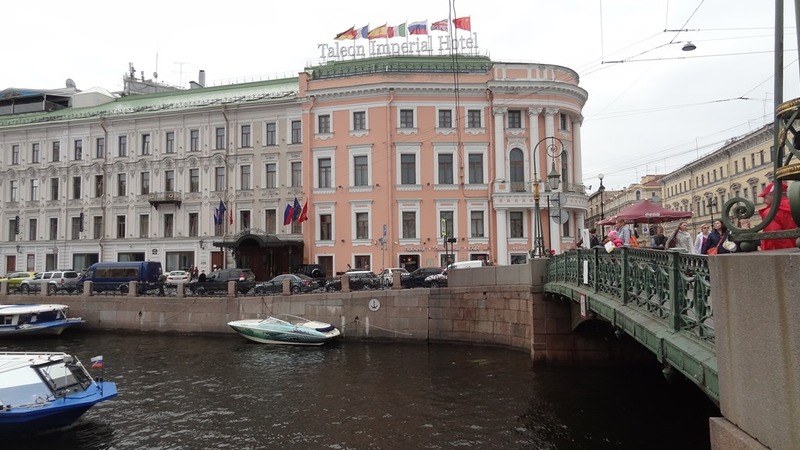 This Russian holiday had been excellent, there had been so much to see! I definitely recommend it as a destination. This journey started nearly six years ago. 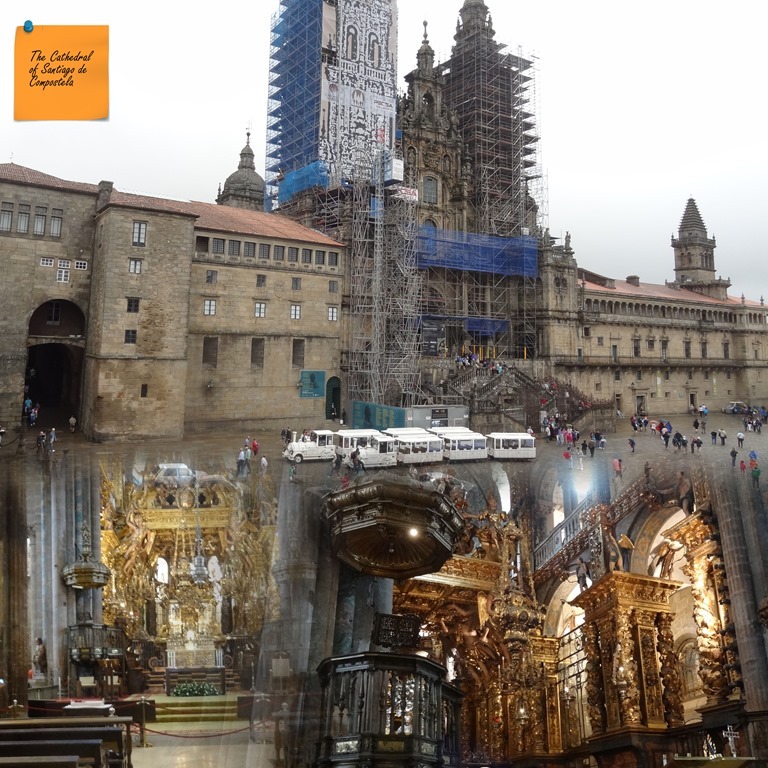 A couple of my friends from Australia suggested walking the pilgrimage route to Santiago de Compostela to celebrate a big birthday. I agreed quite enthusiastically. But before I even started training properly, I had a health issue which made it impossible for me to join in. The books I had read in preparation and the stories my friends told me after their journey had me dreaming about seeing at least some of those places one day. And so, when my husband suggested a driving tour this summer, I quite happily started planning a trip along the North of Spain. 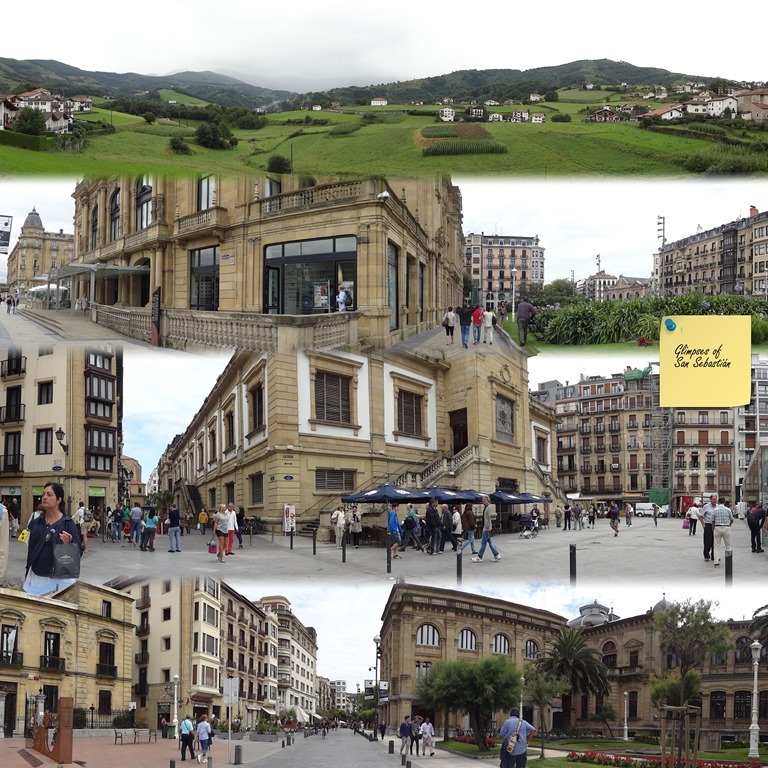 We drove from our home in Switzerland, crossing the width of France to enter Spain close to San Sebastian. We drove a total of 4300 km over sixteen days. Here is an account from my diary. We have a very good run to Perigueux where we stay tonight; we cover 650 km in about 6 hours. We are staying in a motel in the outskirts; it is very basic. 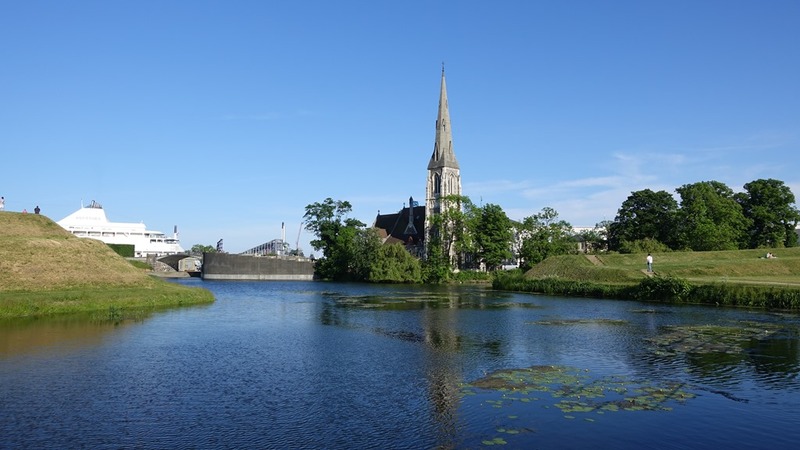 We have been to Perigueux a few years back on a longer trip to this area. It is a different kind of pleasure to revisit places one has been before, don’t you think? The weather is pleasant and I am pleased to discover nooks and crannies we missed in our previous trip. Having skipped lunch, we are ready for dinner the moment the restaurants open. We head to a vegetarian restaurant that we had noted from our last trip. My husband, a dedicated carnivore, is happy to accommodate me. Izba is a little restaurant run by a French-Russian couple. They seem like gentle, friendly souls. The food is delicious and very reasonably priced. This night our sleep comes early and deeply. The drive today has been a horror; it has taken more than 7 hours for just 450 km. The roads are crowded with holidaymakers, this is school holiday time. Many stretches of the road are under maintenance and we see a number of accidents as well. The toll way gates take forever to pass. A nightmare of a drive! Finding the Melia in Bilbao is easy and we park in their underground parking. The check-in is fast and efficient and our room quite nice. 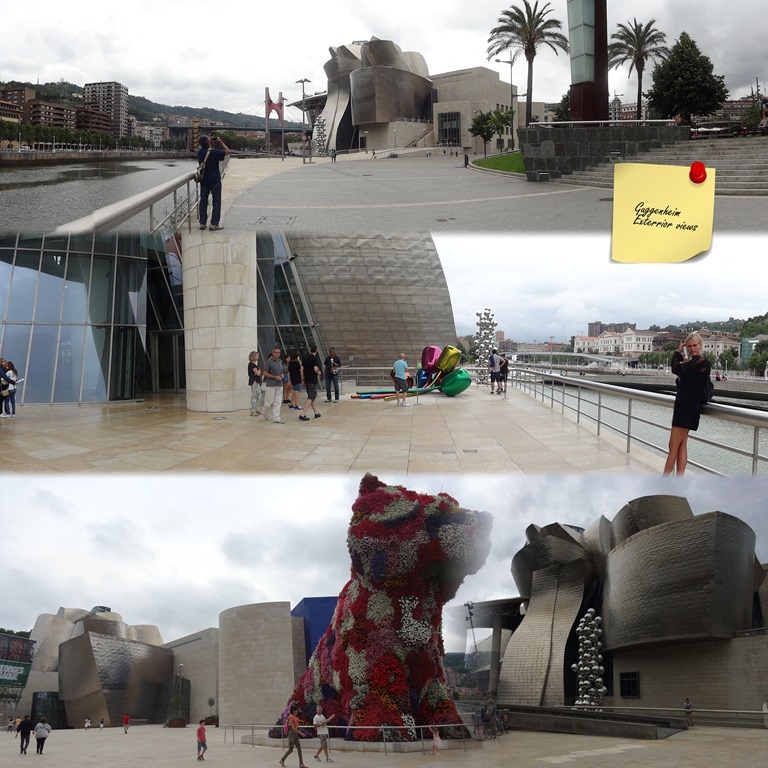 We settle in quickly and set off towards the Guggenheim which is just a 10 min very pleasant walk away. What a stunning building! It is very artistic, very interesting from every angle. 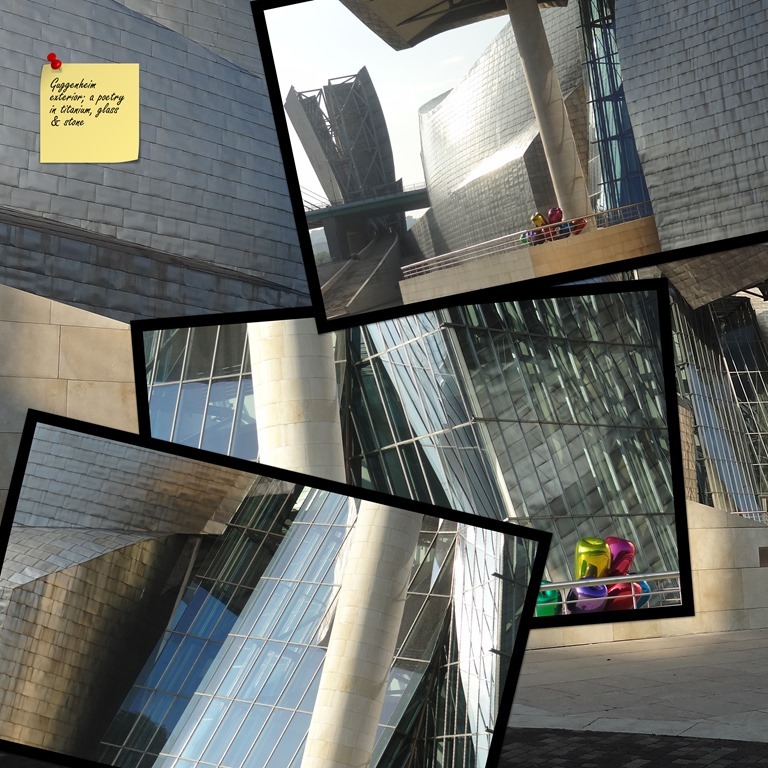 Designed by American architect Frank Gehry, the building is quite amazing. The angles and curves, the reflections of the sky and the water and the very unique surfacing of titanium panels, limestone and glass grab and keep my attention. It is a building which I will remember forever. It is convenient that the museum is open till late. The building is equally interesting from the inside. There are special exhibitions by Yoko Ono and by Georges Braque. Both my husband and I quite detest what we see of Yoko Ono’s work – if it makes us philistines, so be it! But really, condoms filled with water? How can this be considered art in the same way as, say, Rembrandt’s Night Watch or Vermeer’s milkmaid? My dear husband gets so angry with the exhibits that he refuses to even see Georges Braque whom I like well! We are still put out when we exit. After popping into the tourist office just outside and booking the old-city walking tour for tomorrow, we go looking for a restaurant. Nothing is open at 7:30 pm so we enjoy a pleasant stroll instead. We have a drink at an old-fashioned very quaint cafe-bar and then dine at Tagliatella, an Italian restaurant. For those wondering why eat Italian in Spain, Spanish cuisine is unfortunately very short on vegetarian options. After an excellent breakfast at Melia, we head to the old city. 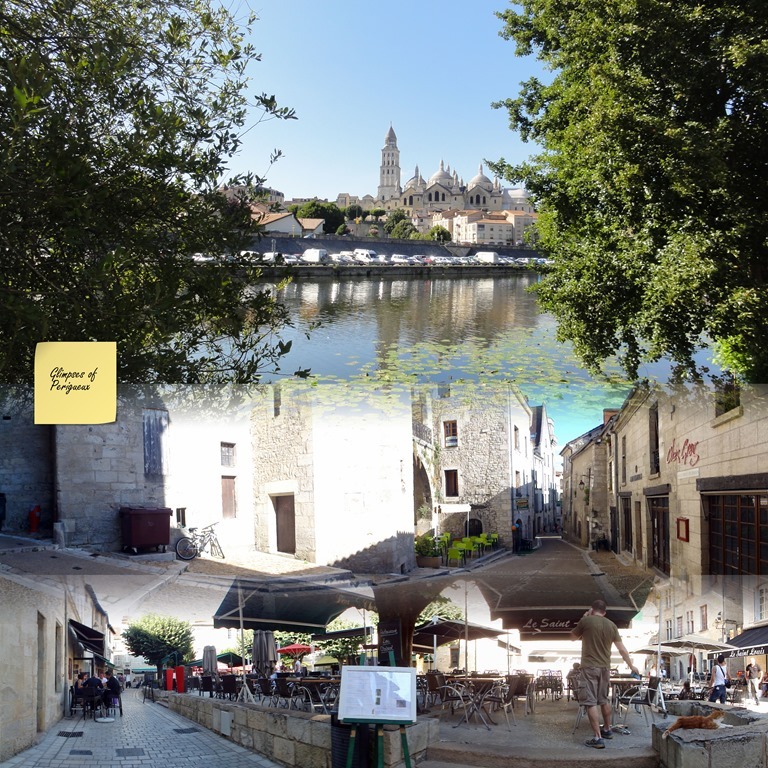 The walk along the river is very pleasant but it takes a good 30 minutes to reach the tourist office. The walking tour was advertised as being in English but it is a bilingual Spanish-English one. The guide seems knowledgeable and enthusiastic but a 5 minute spiel in Spanish is translated into just a minute’s explanation in English. I feel a bit cheated! The old town is deserted at this time of the morning and frankly, doesn’t look very interesting to me. Still, it is nice to be out and about. After the tour we sit in the park above and watch the world go by. The crowd has picked up somewhat by now. There are senior citizens in benches having a friendly natter. There are children running around. There is a small group of young folk practicing for theatre of some kind. There are young couples out for a stroll. Life streams around us. We then walk slowly back towards the Bellas Artes museum. My husband is happy to eat lunch at a small restaurant filled with locals but the heavy breakfast has been enough for me. We get a bit lost on the way and then get caught out in a sudden torrential downpour. So it is nearly 4bpm that we come to the museum. It is an excellent museum with some very lovely artworks and we spend a very happy couple of hours inside. Returning back to the restaurant, we have a little rest time checking emails. The wifi is very good in the lobby but not so good in our room. We dine at Melia’s in-house restaurant which has a couple of vegetarian choices. My husband is happy with his menu while my stir fry is a well below average. We dawdle over a very generous breakfast this morning and set off on our 158 km drive to Burgos at 10 am. I enjoy the drive on AP68 very much indeed. At the start the landscape is mountainous and slowly gives way to rolling plains and fields. Very pretty! Our hotel NH Collection Palacio de Burgos is simply gorgeous! 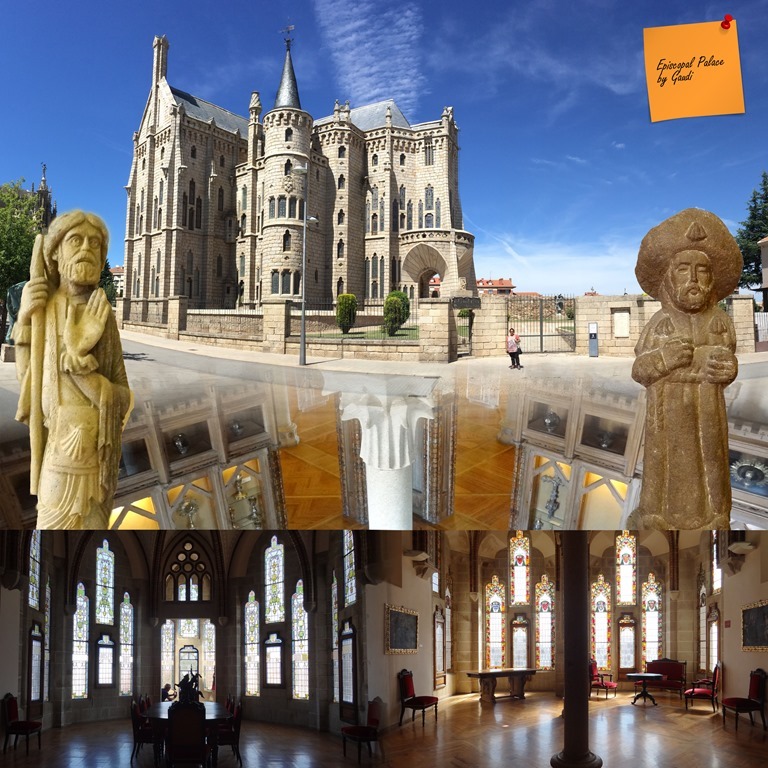 Housed in a tastefully renovated 16th century building, it even includes a wonderful Gothic cloister. Our room is luxuriously fitted and very comfortable. The exterior still looks like a church (see above). 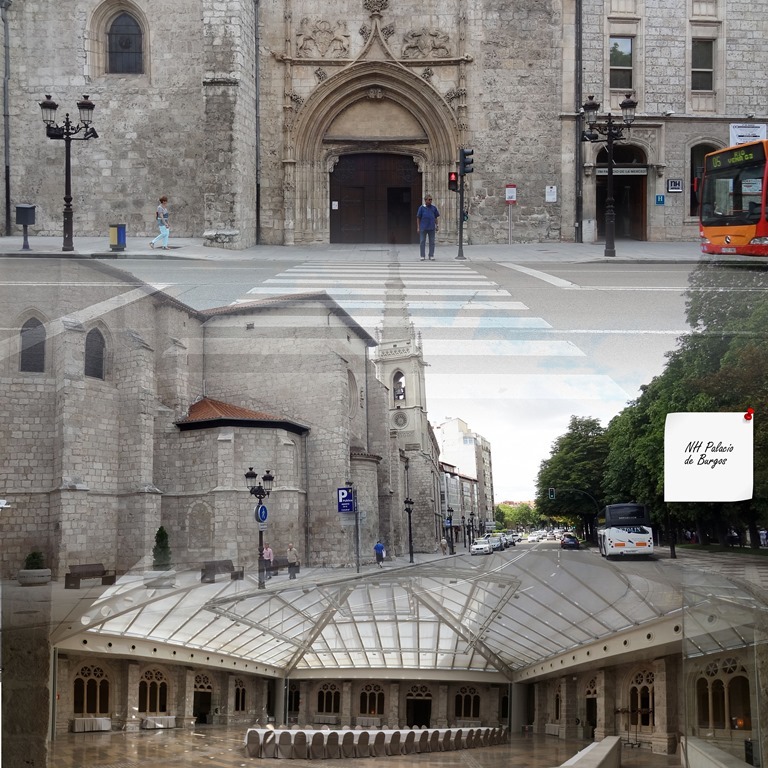 The Cathedral is just a few minutes walk from the hotel, no distance at all. Now, I am a bit of a Cathedral enthusiast; I even have my own ‘hit list’! So it is with experience that I say that this Cathedral is one of the most magnificent ones in Europe, a real treat for a Cathedral aficionado. The exterior is a soaring symphony in stone, each angle offering a new and beautiful portrait. I am overwhelmed. In awe. The interior is equally overwhelming. I walk with my head craned up, not wanting to miss the many beautiful designs made with light and stone. 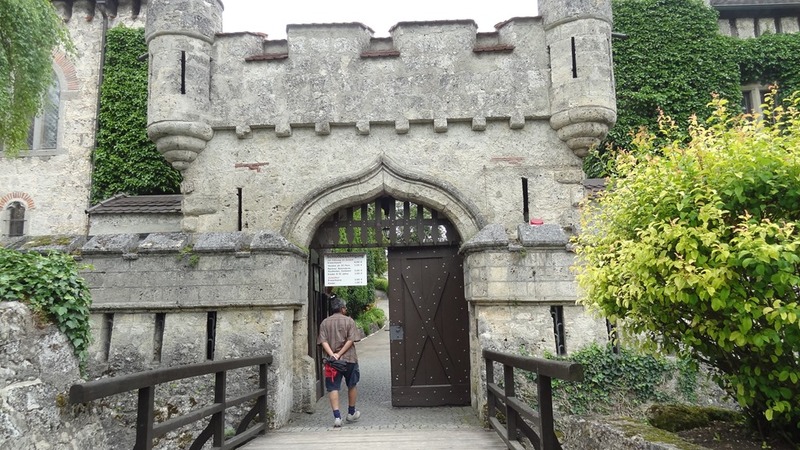 Built first between 1221 and 1260, it was added to for the next few centuries. There are so many altars, each more beautiful than the other. 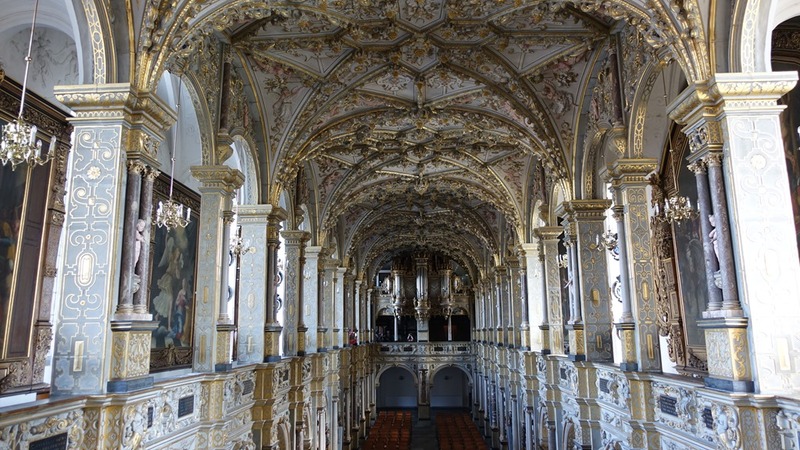 The choir (1550) is a beauty and so is the Golden Staircase (1477). But what makes my heart stop are the three central reliefs in the ambulatory sculpted by Felipe de Vigamy between 1497 and 1503. Two of them are water-damaged but they are all quite outstanding. I sit down to take a breath and know that the beauty of this cathedral will remain with me as a wonderful memory forever. We have lunch at one of the very touristy places just outside the Cathedral. To be avoided. 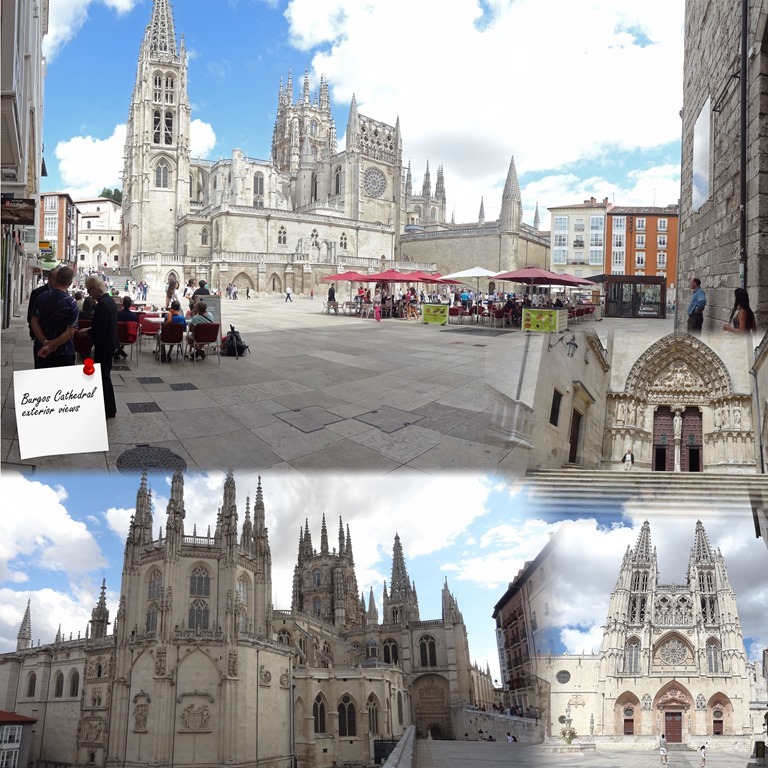 We then have a walk around Burgos, enjoying the sun. I have an after-glow from the Cathedral and cannot quite take an interest in anything else. Still, I enjoy our wander. We then head uphill to the ruined castle from where there are excellent views of the city. There is a lovely park to sit in and watch the world go by. Dinner is a problem. I had taken note of a vegetarian restaurant but sadly it is open for lunch only. We wander around looking at menus but no one offers vegetarian choices. Finally we walk out of the old city and see a Chinese restaurant called Hong Kong where they make me vegetable dish. I envy my husband’s ability to consume anything and everything – sigh! 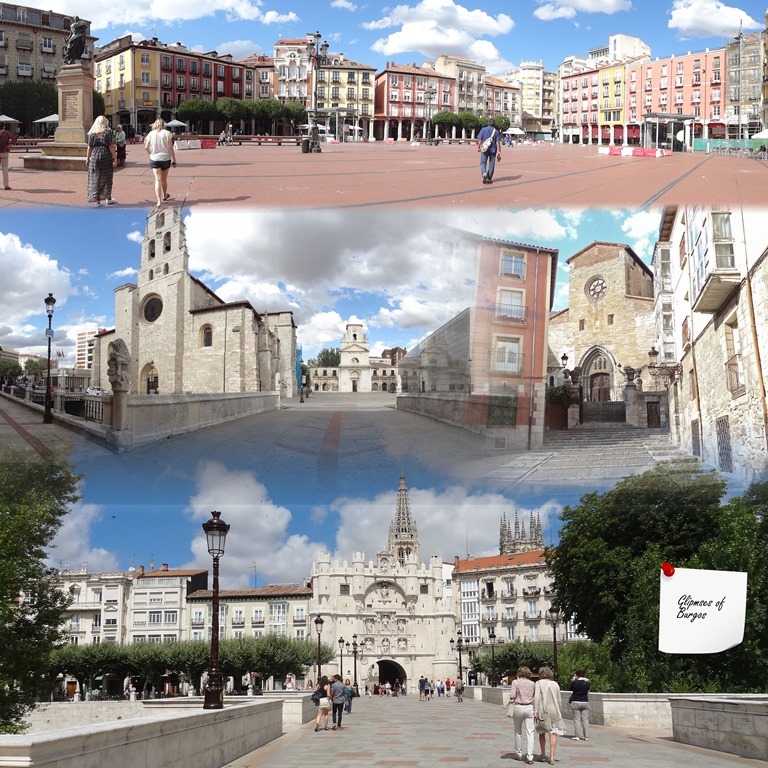 After an excellent breakfast at our hotel, we set off towards León. It is an easy drive. This is agricultural country; the fields look lush and lovely. Spain, I tell myself, is quite beautiful! We arrive at our hotel in good time. 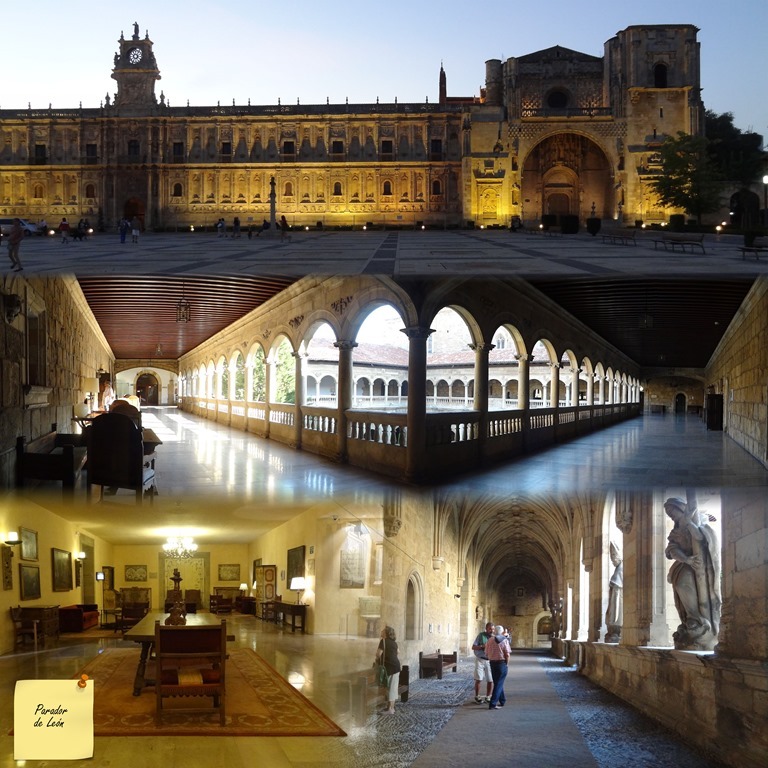 The Parador has an amazing frontage and the public areas are stunningly beautiful. It is like being in a museum! However we notice that the hotel is very much in need of a renovation. Our room is ok but not the level I expected. The plumbing is old; the veranda is quite filthy and unusuable. The back part of the hotel is quite dilapidated. Still, it is an experience, staying in such a magnificent old building. We set off to find lunch in a cafe but my husband gets called by work for a conference call. 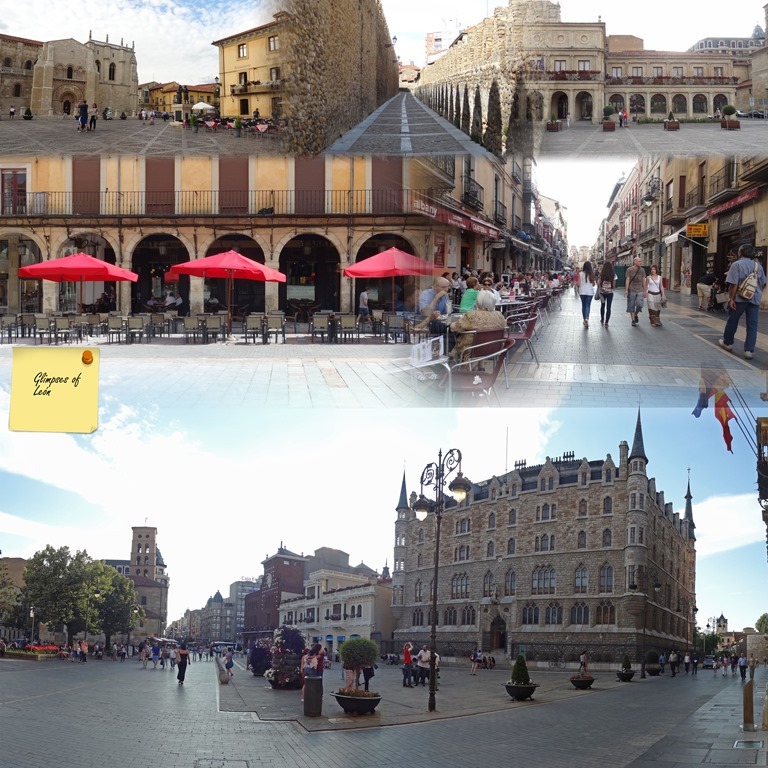 So it is back to the hotel for a couple of hours before we can set out to explore León. Our first stop is, of course, at the Cathedral. 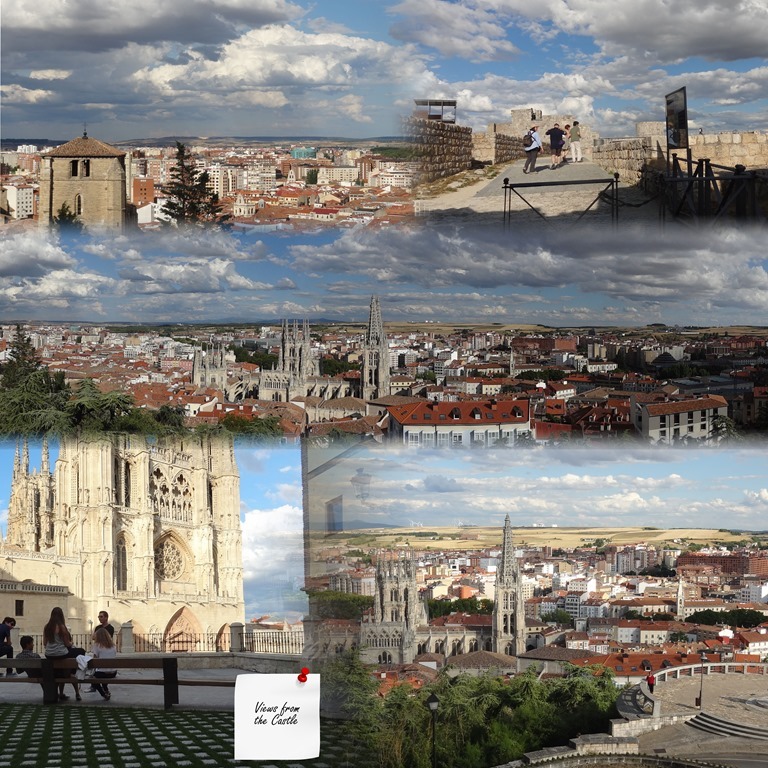 After Burgos, it seems small in comparison but of course there is much to see. The exterior is all light and air; very elegant indeed. The interior is specially interesting for stained-glass window connoisseurs. They are very beautiful and I am mesmerized by the colours (I played with Photoshop with my composite above to give you a hint of how it felt). There is an audio guide but it does drone on a bit so I just let me senses do the seeing, feeling and absorbing. 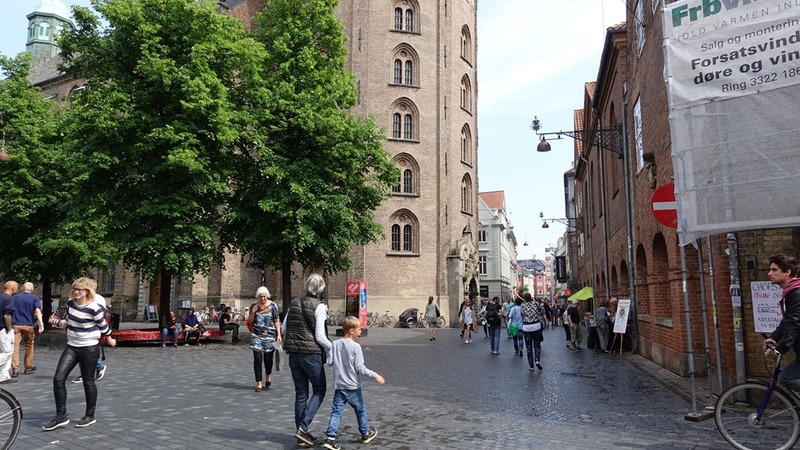 We stroll through the old town, checking out the places that the receptionist had marked on our map. We walk the old city wall, getting a bit lost on the way. We check out the Iglesia Santa Marina and then the Casa de Botines by Gaudi. We then wander on to Plaza Mayor and sit for a long time watching the activity. This seems to be a meeting point for the whole town. I am charmed by the way the older people have dressed for their evening stroll, the men with jackets and some even with hats, the women in dresses and skirts. They sit in little groups, catching up with the news and then walk around the plaza meeting others. The younger ones are casually dressed, looking like young ones from anywhere. There are couples holding hands, families trying to control runaway children, groups of young men looking ‘cool’, groups of girls giggling – ah! I love this place! It feels so very welcoming. We get up finally at dinner time, relaxed and happy to be in León. I had planned today as a ‘do nothing’ day but well, we don’t quite do that very well! We do have a leisurely morning enjoying the delicious breakfast spread at the Parador. 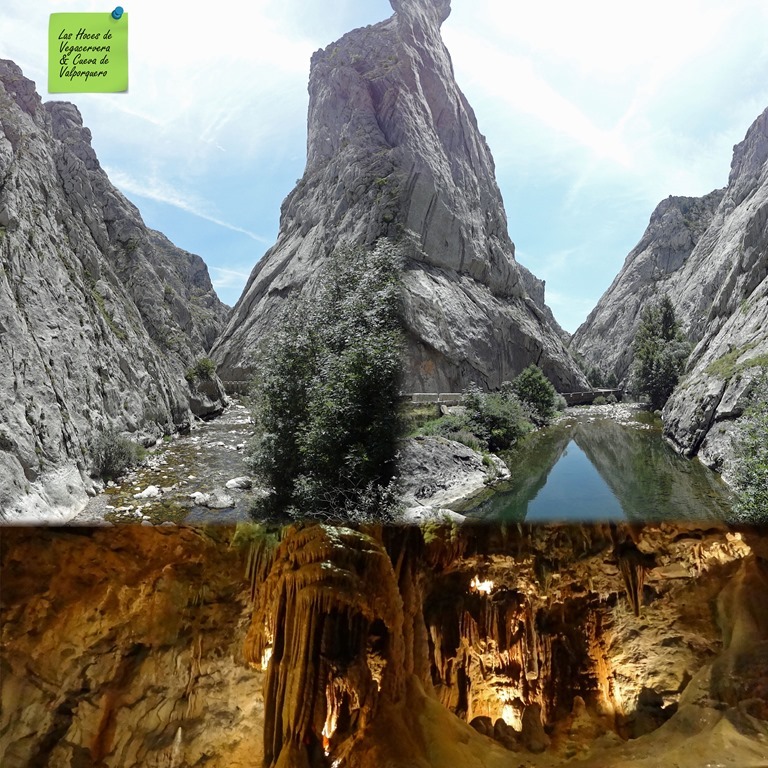 I see something in my travel book which interests me; I want to see the Cueva de Valporquero which are not that far from León. I set the name of the nearby village on the GPS and we merrily head off. After a while, I am suspicious as to why we are heading East instead of North. Well, there are two villages with the same name and I have chosen the wrong one! We have to retrace our path but we finally hit the correct road. 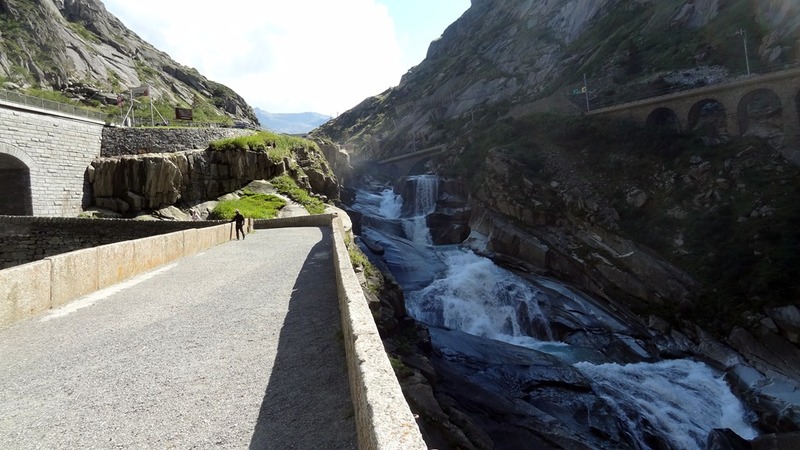 On the way we pass the gorges called Hoces de Vegacervera. 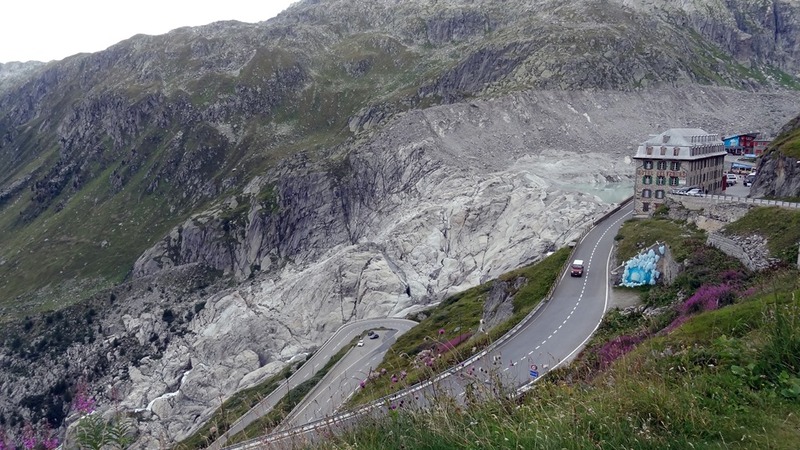 The road is very narrow and the rocks climb steeply on either side; a very other worldly landscape. 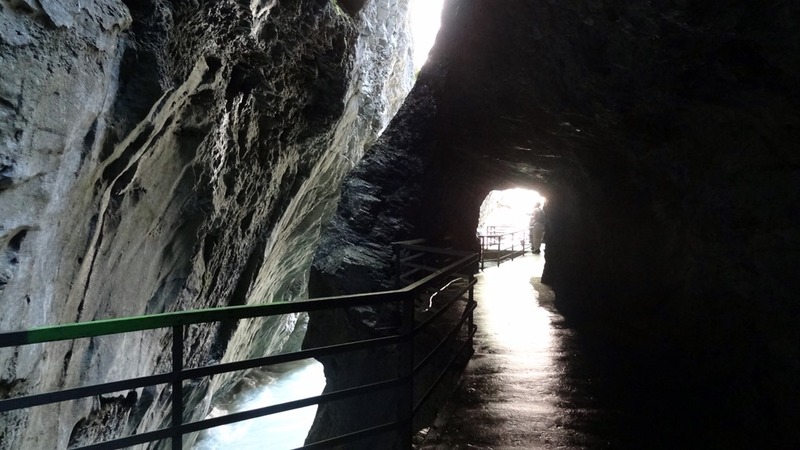 The entrance to the caves is on top of a hill and the scenery on the way is very beautiful. The caves can be visited only with guides and the tours are in Spanish. But it doesn’t matter to us; the stalactites and stalagmites are lovely and we enjoy the visit anyway. It is cold (7 C) underground but we have cleverly carried some warm clothes so we are fine. My photos don’t turn out well as I have not carried a tripod and the light is very low. 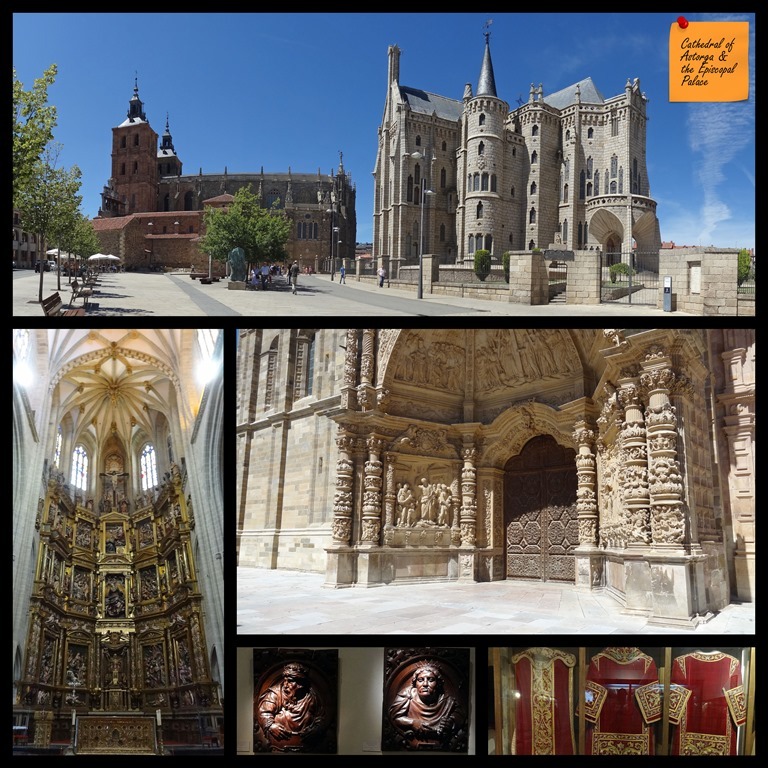 We head next to Astorga. I am surprised at parts of the landscape where the earth is as red as in Australia, makes me home sick! 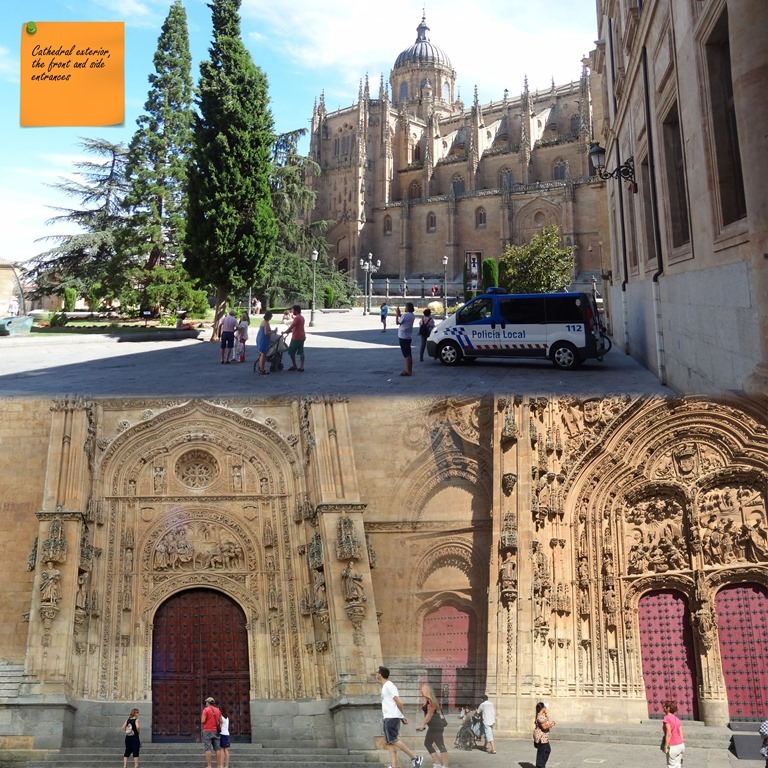 We park very near the Cathedral and walk up to the square next to it. It is a lovely square with the Cathedral on one side and the Episcopal Palace built by Gaudi on the other. The palace looks like a fairy tale castle! We head inside the Cathedral which is quite nice. The attached museum is simply excellent. I am quite surprised to find such a treasure trove; an unexpected pleasure! We then visit the Episcopal Palace, admiring the unique touch of Gaudi. It has a very small museum as well. We don’t linger too long. Back at the Parador we walk around admiring the hotel and taking many pictures of the interior. There is a beautiful cloister which we admire. There are many lovely pieces of furniture in the corridors – three legged chairs, chests, old wooden rocking chairs etc. Nicely done! We then head back to the city centre to find dinner. My husband is keen to try local fare and I encourage him to find a nice restaurant. It seems unfair that he has to compromise with restaurants all the time because of my vegetarianism. I see a nice looking place and we peep in. Nobody seems to be around. We call out and the proprietor comes to talk with us. He speaks no English and we speak no Spanish. I ask him about French; his is rusty but we manage to communicate. Yes, he can serve us dinner and yes, he can even serve me a three course vegetarian ‘menu’! We are delighted! The food is very good and the host very hospitable. He recommends the delicacies the region is famous for and my husband really enjoys his meal. I am happy to recommend Adonias to you. It is nearly 10 am by the time we set out this morning. 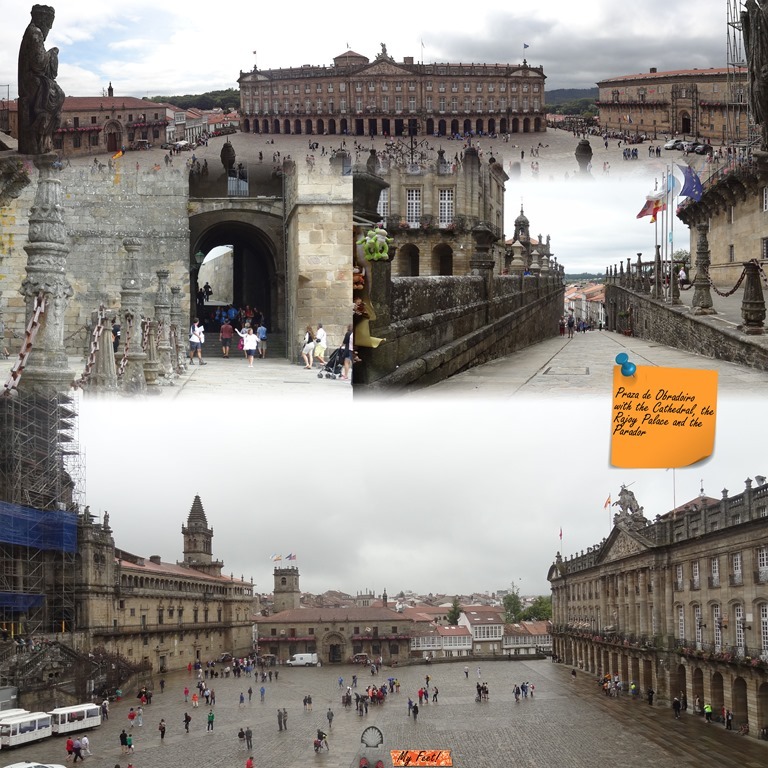 We are driving 351 km to Santiago de Compostela today. 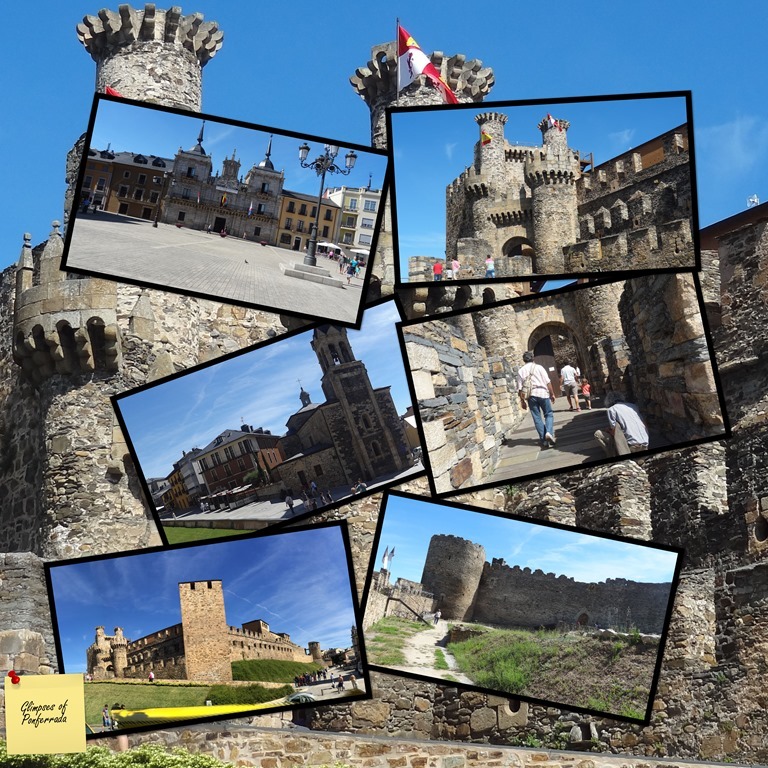 When we see the sign for Ponferrada, we decide to go and check out the castle on an impulse. It seems to be a market day; the streets are very crowded. We do not stop to see the market though which I regret later. The castle is up on the hill and today it is free entry for all. We walk around the ramparts, admiring the views. There is a museum inside which we do not visit. We reach Santiago well into the afternoon. The GPS brings us to what is definitely a pedestrian area. We drive around in circles wondering how we are to reach the Parador. 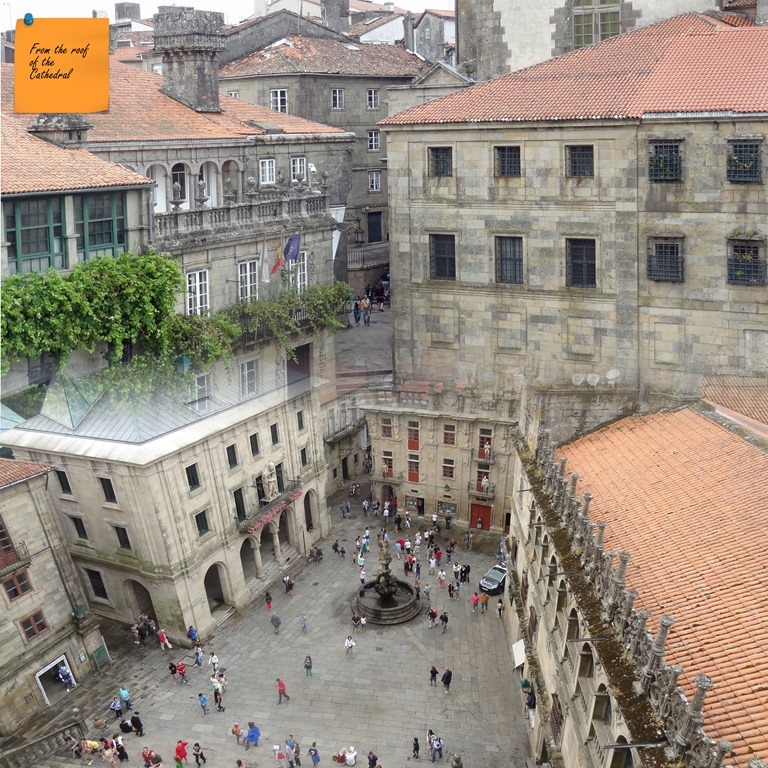 A friendly policeman points the way but we have qualms as we drive into what is the heart of of Santiago, the Obradoiro square (above). But what a superb location for a hotel! Leaving the car outside in the square, we check in and are then helped by concierge in parking the car. The Parador is simply magnificent! We are to spend quite a bit of time exploring the hotel itself. The Hostal de Los Reyes Catolicos was built as a Hospice for the pilgrims which became operational in 1509. In 1958 it was converted to a Hostal. It is quite beautifully done with lovely furnishings, beautifully fitted out rooms and splendid public areas. There are plaques everywhere describing the history of Santiago and the Hostal. You can find further information here. It is not exactly budget friendly but it is a marvellous hotel and I strongly recommend a stay for just the experience. After settling in, we set out to explore the town. The main frontage of the Cathedral is under construction. The interior is very crowded. We do a little walk around and then sit quietly taking in the atmosphere. I think about the millions and millions of pilgrims and believers who have sat as I have and see what I am seeing. I think of their journeys, the journey of the pilgrimage, the journey of their life. I think of their beliefs. I think of their pains, their sacrifices. I think of their joys, their achievements. My mind merges the then and the now. There is a sense of sanctity here and I let myself absorb that into myself. Our journey here is not quite a pilgrimage, yet today it feels like one. It is well into the evening now; our stomachs make strong demands as we had skipped lunch. Skipping lunch is bad strategy in Spain as restaurants do not open for dinner until late. We go for a walk and check out some of the ‘veg friendly’ restaurants that I have a list of. None looked very interesting and they were still closed at 7:30 pm. The last one on my list is Malak’s, a Middle-Eastern restaurant. It is happily open, the proprietor is very friendly and the food quite delicious! We at once decide to come back tomorrow evening too! After dinner we enjoy strolling around before finally going back to the hotel to relax for the rest of the evening. 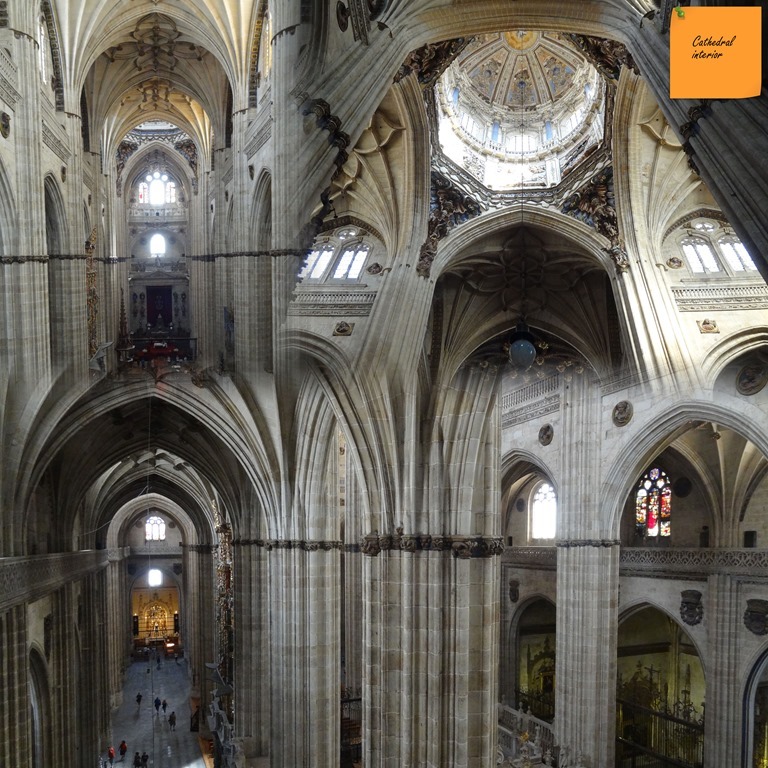 Right after breakfast, I go to book ourselves into the much lauded Cathedral Roof tour. The English one is at noon. As we are a stage of the journey when we are gently fatigued, we are happy to wait it out back in our hotel. I enjoy taking some photographs before sitting down to play with the wifi. What did we do before the world was so connected? I am such a wifi junkie!! The Cathedral roof tour is quite incredible. Not to be missed. I have been to so many cathedrals but never seen one from this angle. The guide tells us a lot about the construction which I find very interesting. I also enjoy the views of the city from the roof. It all looks quite lovely! For the rest of the day, we don’t do anything in particular. We just wander from plaza to plaza, enjoying drinks and nibbles more often than is good for us! It is very pleasant to have a day to just chill! 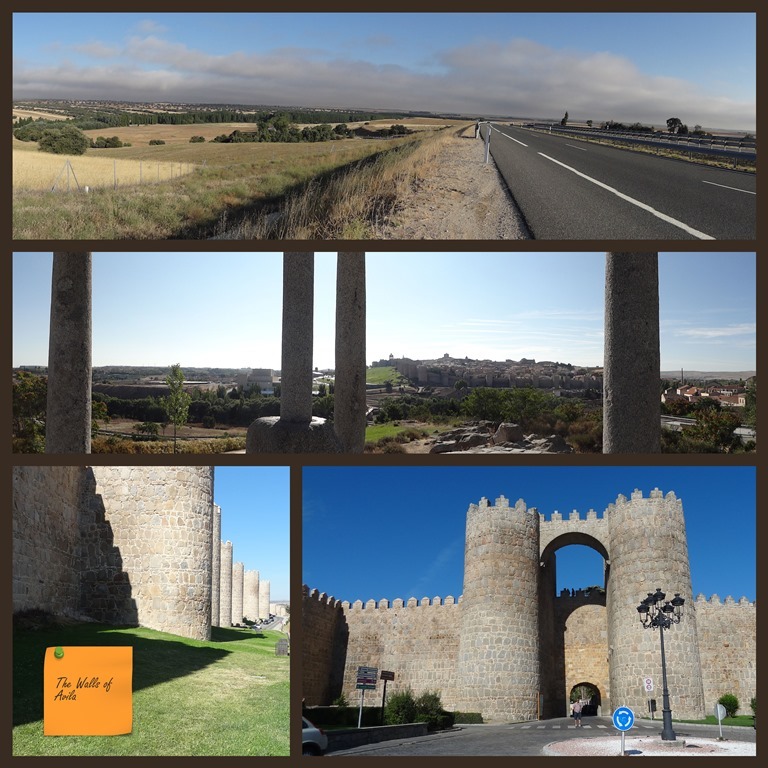 It is long drive we have to get to Salamanca, nearly 450 km. We make good time despite a gentle brush with the police…but we won’t speak of that! The landscape is beautiful and our drive very pleasant. We reach our hotel Eurostars Las Claras in good time. The underground parking using a car-lift is an adventure in itself! The hotel is modern and quite nice; the reception staff are the most helpful we have come across on our holiday. As always we first head towards the Cathedral. I am captivated at the very first sight! It is so impressive! In fact it is two Cathedrals in one; the old one was thankfully not demolished before the new one was built. This is the first time I have seen such an arrangement. The main entrance is quite spectacular. The interior is equally awe inspiring. We pick up an audio tour which is very informative. The old Cathedral is especially interesting. But in the new one we come to one chapel after another until I cannot absorb any more information! 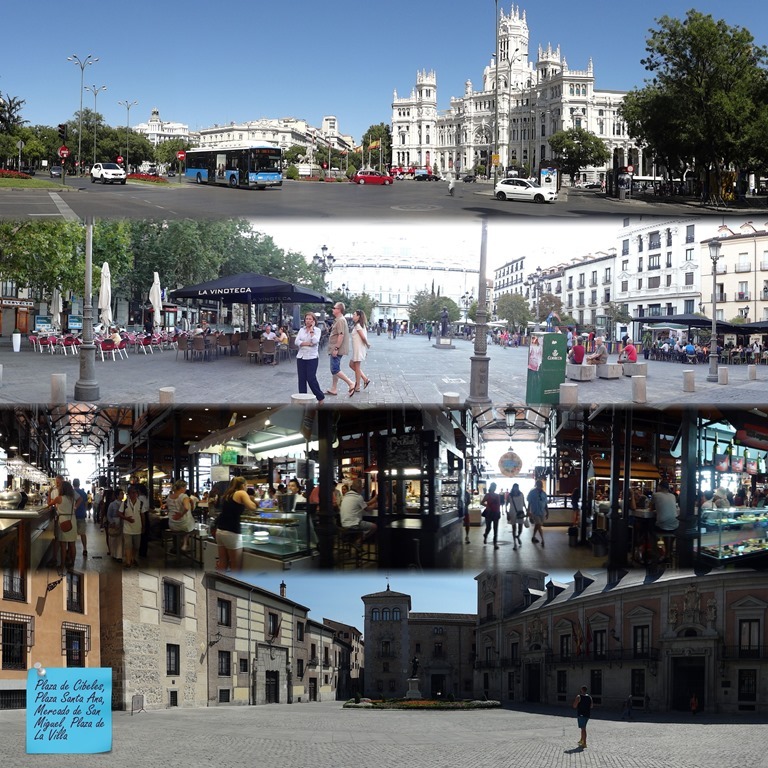 We then wander to the Roman bridge and then back to one beautiful little square after another, ending up at Plaza Mayor. Finally we settle to dine at a Tapas bar recommended by the hotel. The choice for vegetarians in minimal but the service is friendly and the food tasty. We enjoy a nice meal, wander back to Plaza Mayor to see the lights and evening crowds before heading back to the hotel. 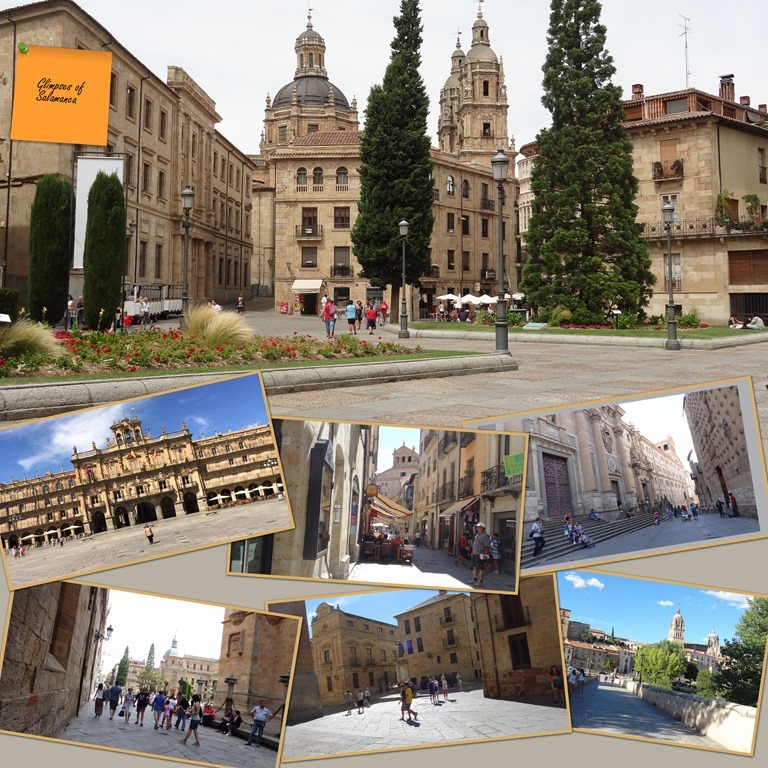 I do like Salamanca, it is sol elegant looking! Its a lovely warm day today and we enjoy our easy stroll to the university. The entrance is stunning and there is a little puzzle to entertain us. We have to find a little frog in the facade for good luck. With my abysmal eyesight, I am quite hopeless at it, A fellow tourist points it out to us; it is a frog on a skull. I have hidden a blown-up version in my picture above; see if you can find it! The oldest one in Spain, it has a lovely old library which is very much worth seeing. An audio tour tells us details but it does ramble on a bit. There is a wedding in progress at the chapel and I happily join the gawkers! Now that I have a taste for Cathedral roofs, I want to climb this one too. There are 300 steps with a few places to halt in between. This is another climb well worth the effort. 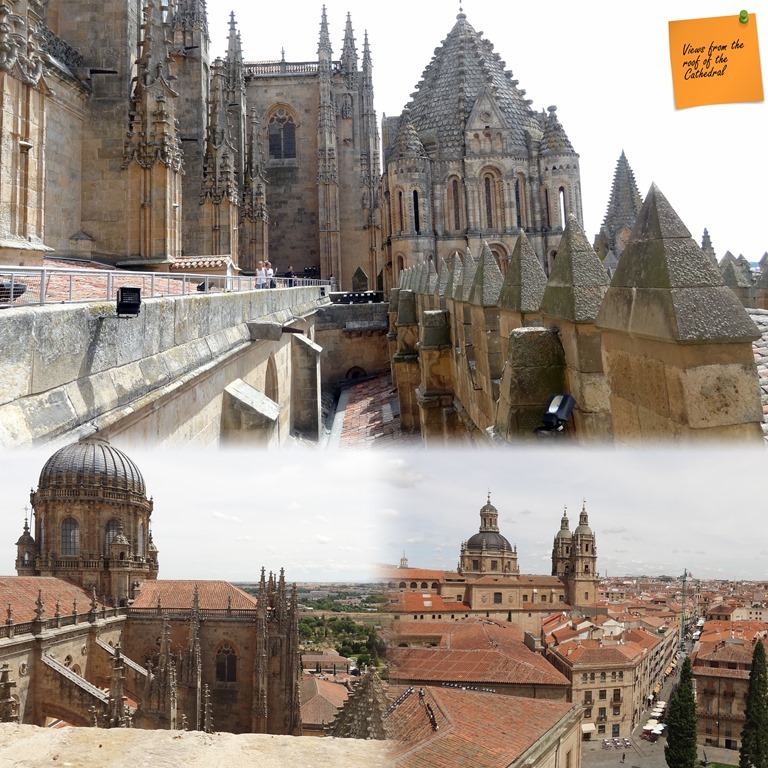 One gets an outside view of the world, a close up of towers and structures, an internal view from high up of both the old and new Cathedrals and a chance to experience the bells ringing at close quarters! How happy I feel surrounded by these old stones, I think, how they weave their tales and magic in me! Definitely recommended. It is nearly 3 pm. We find a vegetarian cafe which is empty except for us. It seems to be run by some very young people. The food is reasonably good; I hope they get more customers and make a success of it. I am tired today so we head back to the hotel for an afternoon nap. The last on my wish list is San Esteban but unfortunately it is closed today. 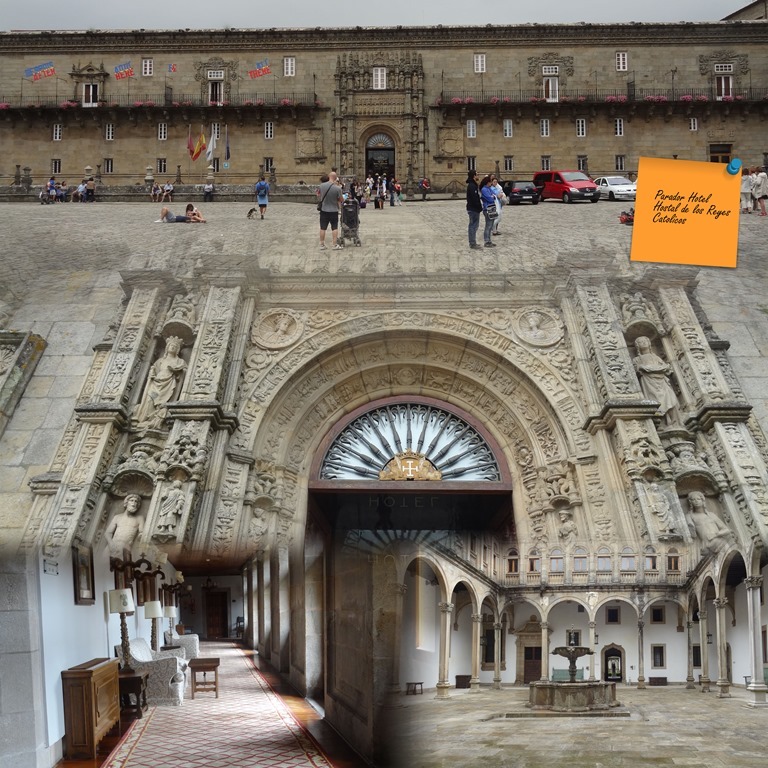 Instead we visit the Convento Los Duenos which is nearby. It is a nice tranquil place to spend a few minutes thinking of times past. 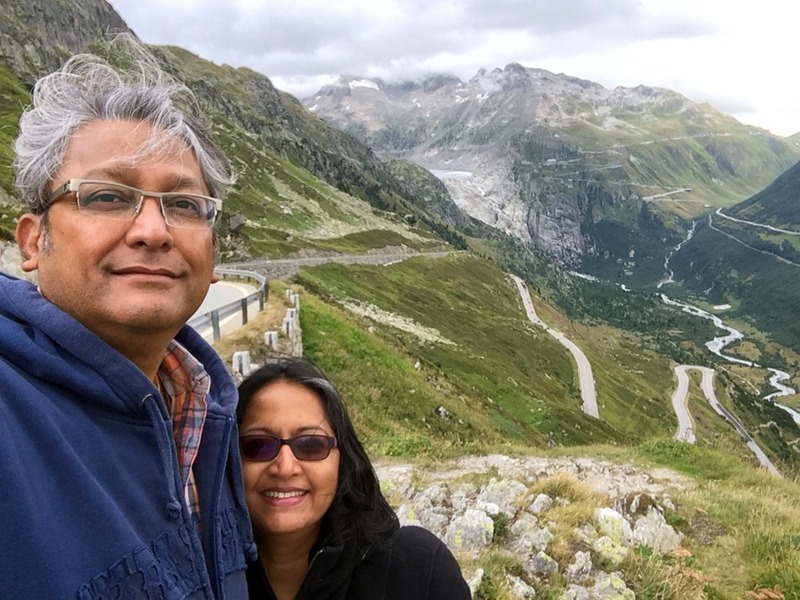 After that we are happy to wander around clicking pictures, eating ice cream and finally having a nice pizza for dinner. Today we turn back westwards again; the holiday has reached a logical mid-point. 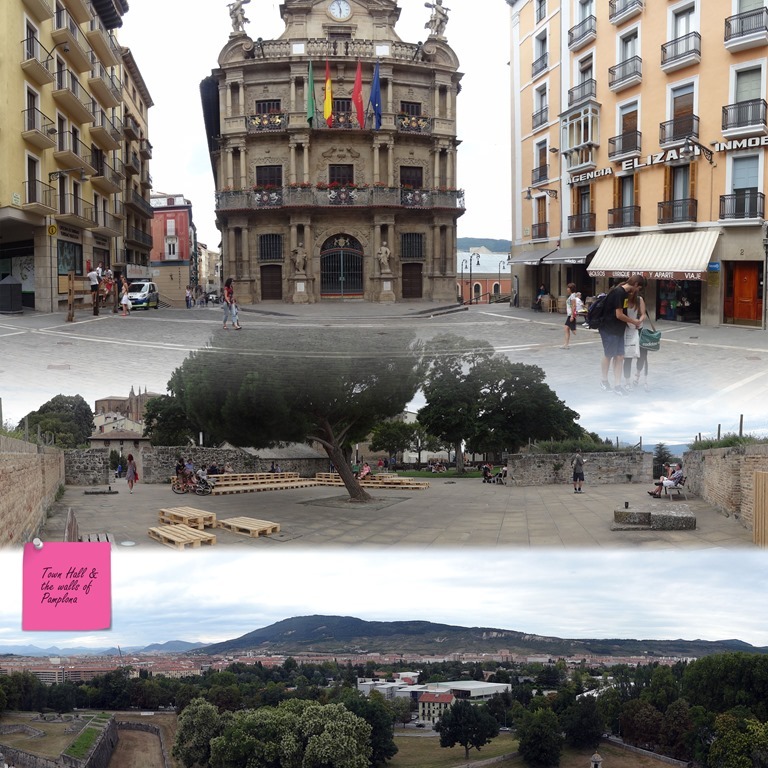 Our first stop today is Avila where we see the imposing medieval walls (11th-14th centuries). It is meant to be a very brief stop as we have a long drive ahead of us. But it takes longer than we expect as we get hit by a motorbike from behind. The damage is minor, but the conversation with no common language and the filling out of the ‘green form’ is daunting. Though it is nothing major, we are both a bit shaken. We walk along the wall and pop into the city to see the Cathedral. Sadly it will not open for another hour. We decide to skip it and continue on our journey. 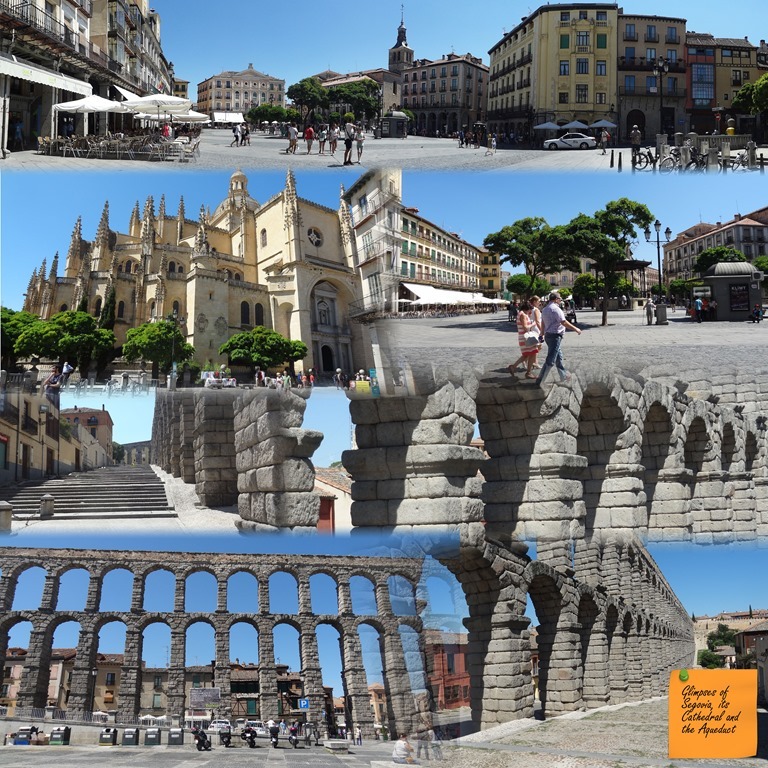 Our next stop is at Segovia where we want to see the Roman aqueduct. It is indeed a wonderful sight! I am much in admiration of Roman engineering. We then have a quick visit to the Cathedral. It is very beautiful but they do not allow photography. 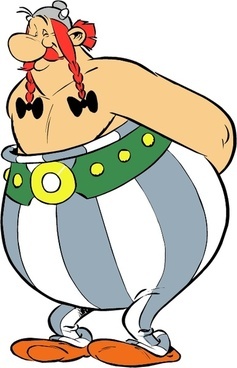 When younger, I had a wonderful graphical memory; now, without photos I can hardly remember anything. Sad. The roof vaulting is quite exquisite. We reach Madrid with no further drama. We are staying at Mercure Plaza de Espagna. It is an old-fashioned hotel in need of some renovation. But I like old-fashioned things so it pleases me well enough. We get some good advice at the reception and set out to enjoy Madrid. 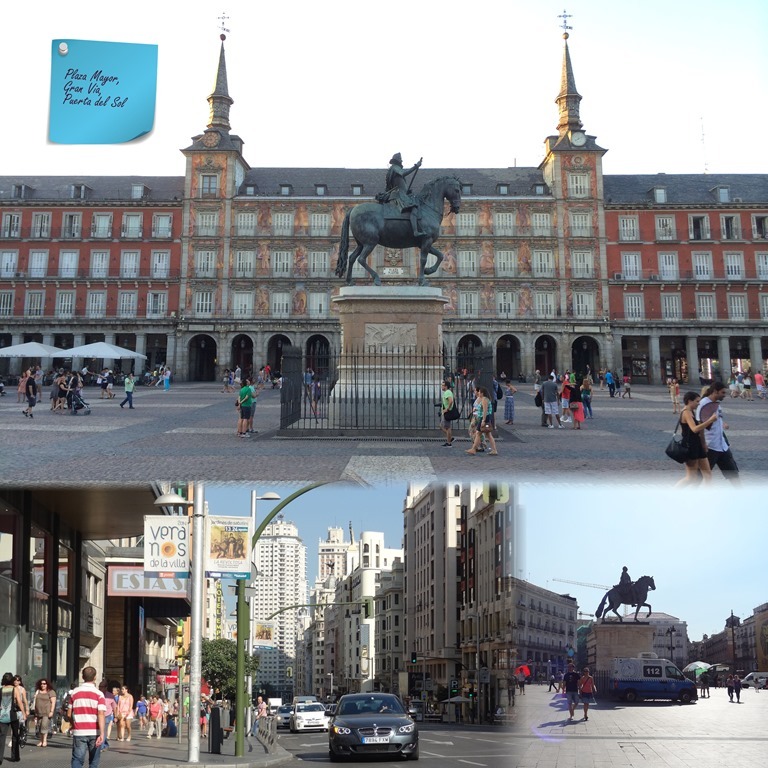 I have been to Madrid before for a longer stay and liked it very much. This trip is for my husband as he hasn’t been before. He wants to have a quick look at the masterpieces in Prado so we head there for the free entry in the evenings. The queue is long and we get about an hour inside. I take a map and walk him military style to the most important works. It helps that I had spent about 8 hours here in my previous trip! But he is not art-mad like I am so he is quite content with his hour long tour. After a week without Indian food, we both are longing for something spicy. There are a surprisingly large number in Madrid. We walk from Prado towards the city centre and stop at this Bangladeshi run restaurant called Indian Spice. The food is very good but it is very expensive in my opinion. We eat a bit too heavily and decide to walk back to the hotel This is a mistake as it is just too far. I have been struggling with my plantar fasciitis the entire trip; I am in serious pain by the time we reach our hotel. Madrid is big, it is a mistake to underestimate the distances based on a map. A good night’s rest and a good breakfast gives me the courage to test my foot again. We walk along Grand Via to Sol and I check out some of the shops. We then take the metro to the Thyssen-Bornemisza museum. 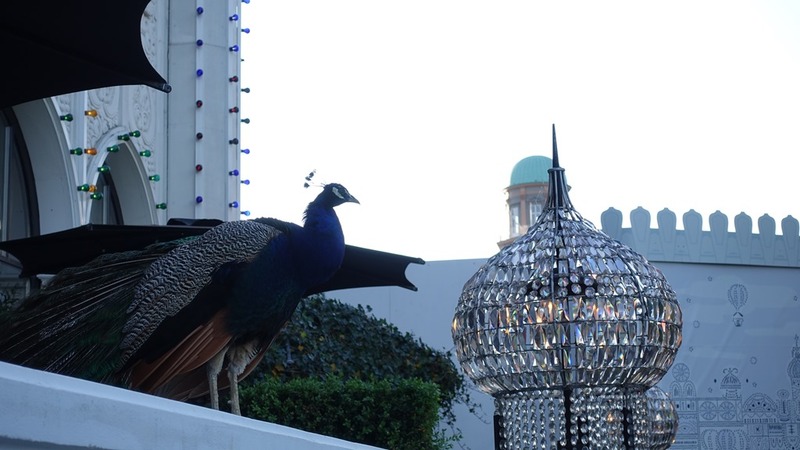 It has free entry every Monday between 12:00 and 16:00 sponsored by MasterCard. What a great idea! I don’t know if it is for tax reasons or it comes out their marketing budget, but I wish other organizations follow suit to make art available to everybody for free. This is my favourite museum in Madrid. 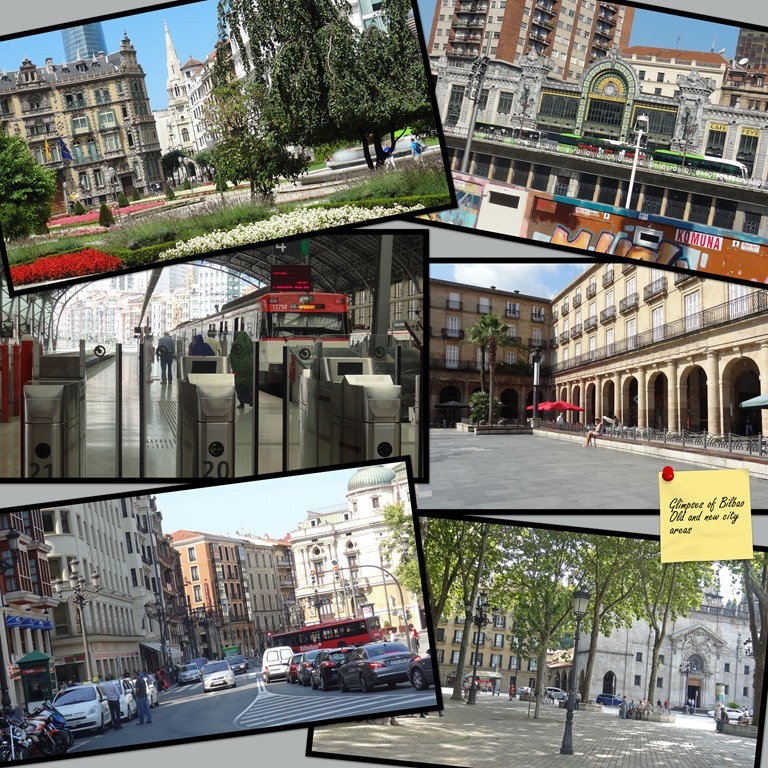 We spend a couple of hours and then set out to explore the city. My husband is not keen on visiting anything in particular or doing a tour so we just amuse ourselves seeing this and that. It is a nice relaxed day. I like Madrid very much indeed. It is 11 am when we set out today; we are infected with ‘Spanish’ time as we call it! We drive with minimal stops to Pamplona. The drive is quite pleasant. I see many windmills on the way. 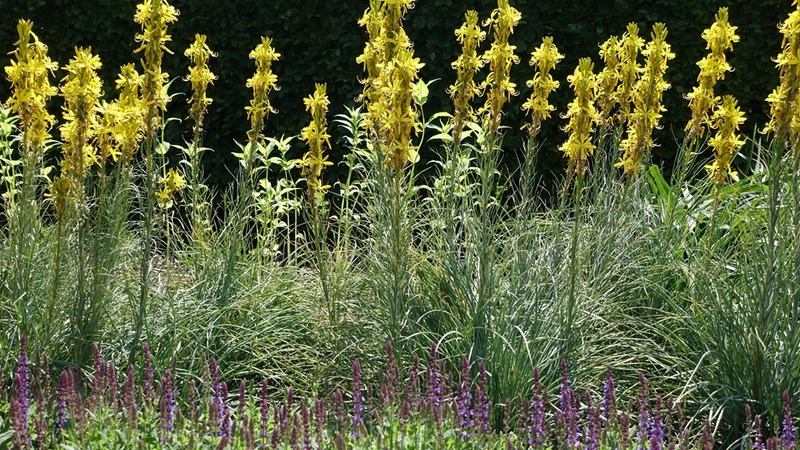 They are of the modern kind but they still remind me of Don Quixote. 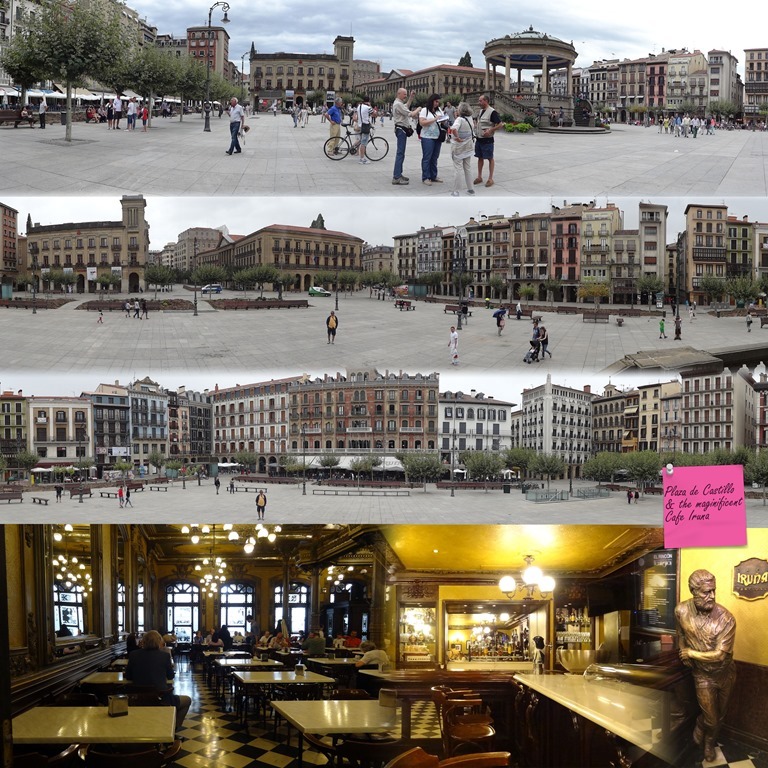 Our hotel in Pamplona, Maissonave, is right at the heart of town. Our GPS leads us to a pedestrian area and we can’t figure out how to get around it. I leave my husband in the car while I briskly walk up to the hotel and get directions. It is a bit complicated but we finally park our car and settle in. The hotel is very nice and the room is comfortable. We have afternoon tea at the hotel and then set out to explore the town. The tourist office says that an English walking tour will run if there are enough takers. There aren’t. So we get a map and take ourselves for a walk along the route of the bull run. The old town is quite tiny, it takes us very little time to do this. Then we go for a quiet stroll on the old city walls. 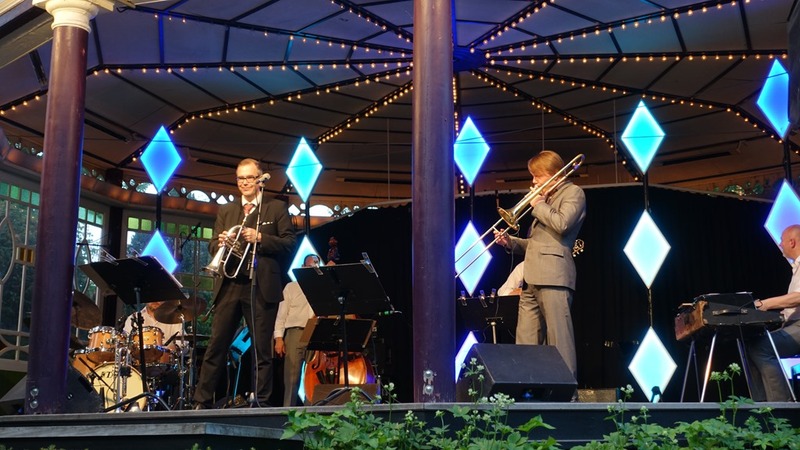 After a light dinner of sandwiches at a cafe, we head out to the castle for the jazz concert that the tourist office had told us of. But we are a bit late for it and all the seats and benches are taken. 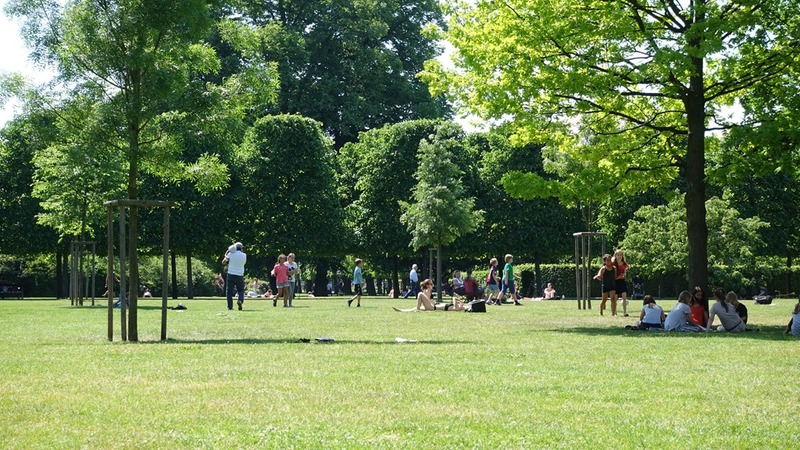 As we sit a bit far away listening to whatever snatches of music comes our way, I think of how pleasant life can be with just a park, some sun and some music. We wake early and look around for a place to have breakfast. It is 10:30, most places still seem closed. There is an abandoned air in the morning like many Spanish towns we have seen. Luckily the famous Cafe Iruña, said to be the favourite hangout of Hemingway, is open. What a lovely old place! I just adore it! 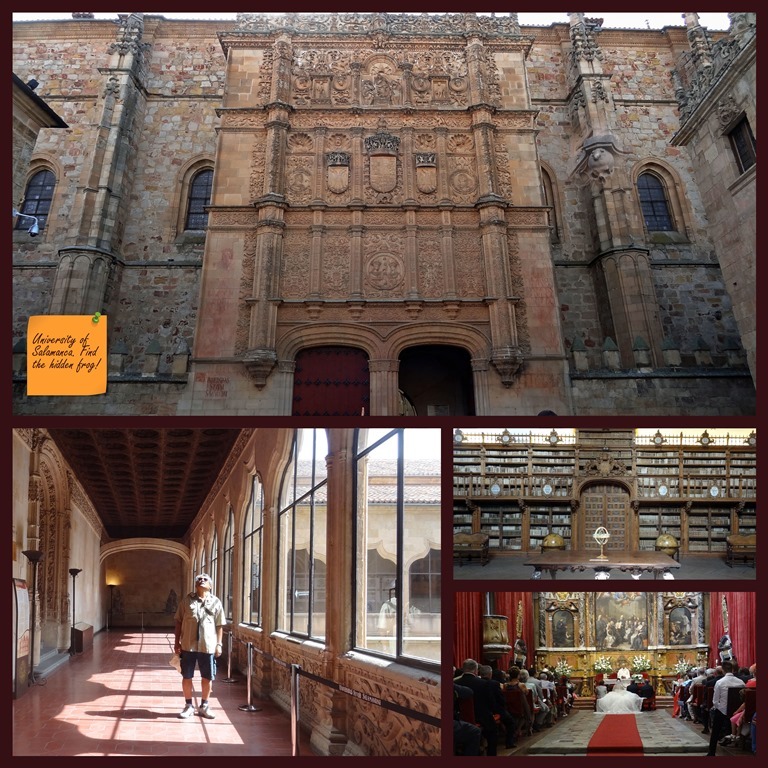 We then visit the Cathedral and the excellent archaeological museum attached. The explanatory boards are unfortunately only in Spanish. After that we stroll around town but it is very small, and we are in holiday fatigue. I am thrilled to find an excellent vegetarian restaurant called Sarasate; the food is delicious and it is very busy. I get a cider and my husband some wine. After a while a local Spanish family seated at the next table come up to us. The parents speaks no English, the twenty something daughter acts as the spokesperson. They give us half a bottle of wine which they say is much nicer than the one my husband is having and show me the right way to drink cider. It is lovely isn’t it when locals extend a friendly hand to us visitors? I felt very warmed by their gesture. After lunch we decide to just laze at the hotel for the rest of the day. We dine at the in-house restaurant where I get only a salad but my husband finds his meal very satisfying. We head out from the hotel at about 9 am, thinking to visit the ‘5 villages’ which are on our route back. We reach the first one by 10 am. 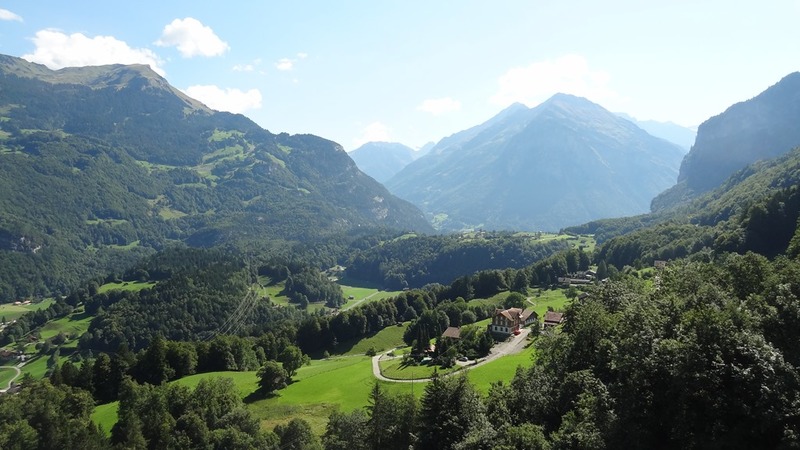 It is picturesque but we are used to picturesque mountain villages as we live in Switzerland. The village is lifeless; no one seems to be around. And there is no cafe for breakfast. We head to the next one which has the same abandoned air. 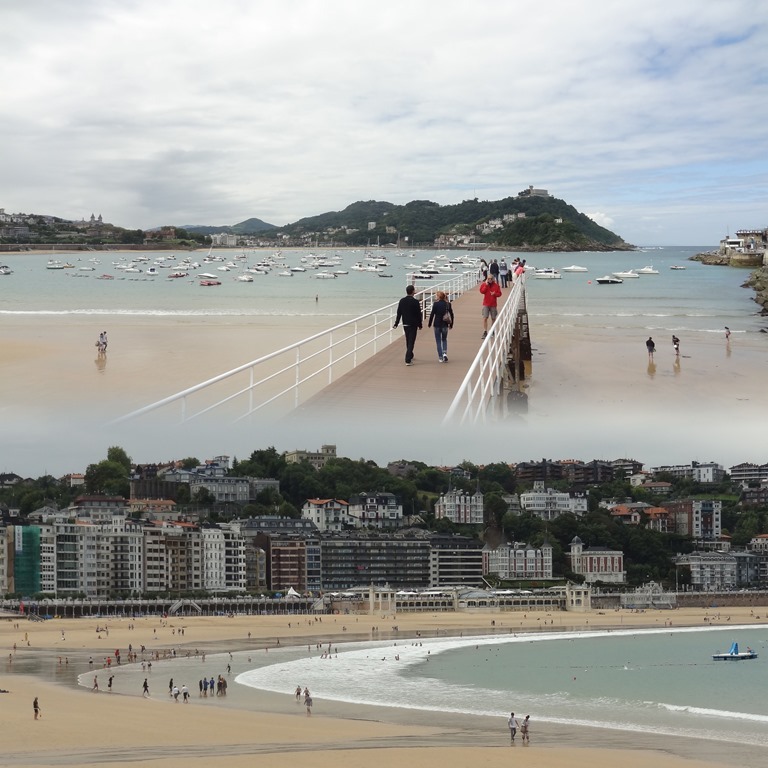 We give up on the villages and head to San Sebastian instead, which turns out to be a very good decision. It is a lovely sea side city, very charming indeed. It is busy with locals at the market, holiday makers and tourists, from the very young to the old. We have a nice breakfast at a cafe and stroll around, enjoying the ambience. And then there is the ocean! Sun, sand and an easy atmosphere; beautiful, isn’t it? We head out at 2 pm reaching our Ibis hotel at Brève at a good time for dinner. It is very conveniently placed close to the freeway, There is an in-house restaurant which manages to make a vegetarian meal for me and the room is adequate. All that is left is a long drive home. I happily relive our holiday while drifting in and out of a doze, the beautiful French countryside streaming outside the window. I am content. I stare in dismay at the weather outlook for the weekend. 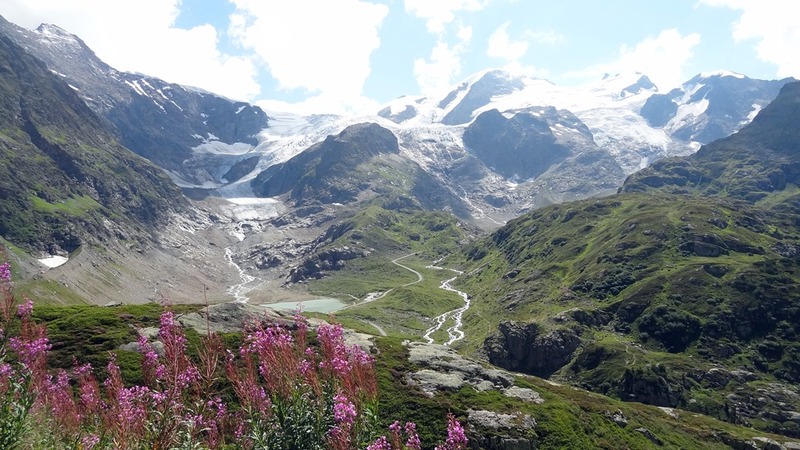 I had been hoping to go away to the mountains but a lot of Switzerland is predicted to be under a deluge. “Shall we just have a movie and popcorn weekend then?” I ask myself. That doesn’t tempt me at all! 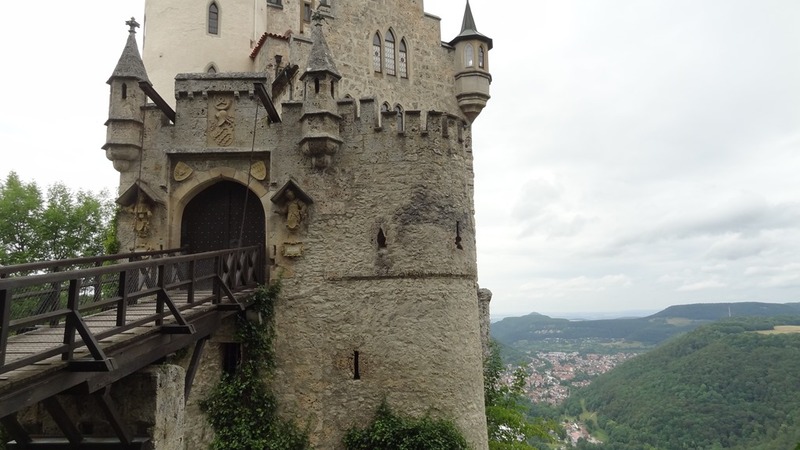 Recalling my interest in a list of must-see castles of Germany, I search for the ones closest to the Swiss border. I make up my mind quickly, call my husband to come home early, book hotels and pack my overnight bag. I even make sandwiches for dinner as there will not be time to dine. I am ready and waiting at the door by the time my husband comes home. We drive 4 hrs that evening and settle comfortably into our hotel which is in a small town on our route. 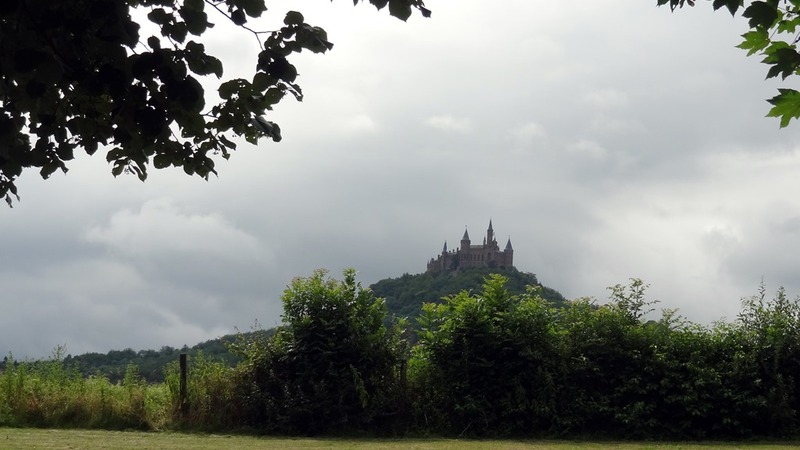 Out first castle, Hohenzollern, is about 70 kms from our hotel. Our drive there is truly picturesque. We pass by the Swabian Jura (Schwäbische Alb), a green, forested area with rolling hills and beautiful pastures. We breeze through small farming communities with their quaint farmhouses and steep roofs. It is very charming and I tell myself that we should come back and explore the natural aspects of this area another time. But this trip is about castles and we arrive at ours very soon. The first sight of the castle on a hill is very impressive. A zoomed-in picture for a better view of the castle. At the bottom of the hill we get tickets for the English tour at 11:30. There are only limited tours in English; I had looked up the time online to be sure. It starts raining just about then so instead of walking up the hill as we planned, we take the bus. We are well ahead of time. 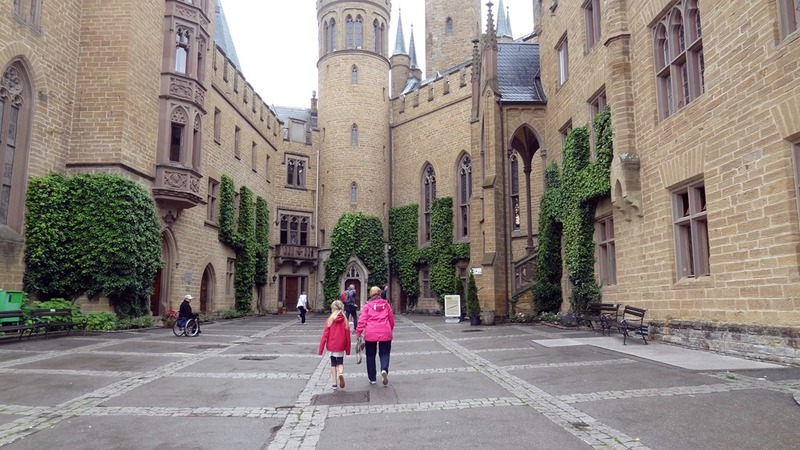 We hang around the courtyard, checking out the Catholic and Protestant chapels while we wait. 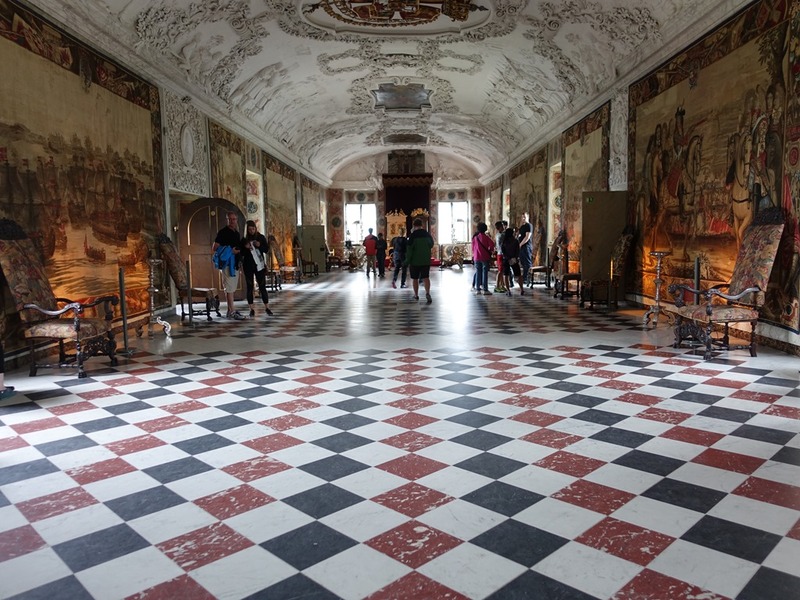 The interior of the castle can be viewed only as part of a guided visit. We wait by the ramparts, enjoying the magnificent views of the countryside. Photography is not permitted within the castle; you can check out the pictures at the castle website. It is a well-maintained and furnished castle. The family tree at the entrance hall is fascinating; our guide is excellent. I am happy to have come here. It is past lunch time by the time we get back to the car and we are hungry. We set off towards Tübingen for lunch. This is a busy little town this Saturday. We quickly find a nice pizzeria and have a very nice lunch. The old town is very attractive and beautifully preserved. We have time for only a quick stroll; it deserves more than that. But I have one more castle to visit this afternoon and that takes precedence. 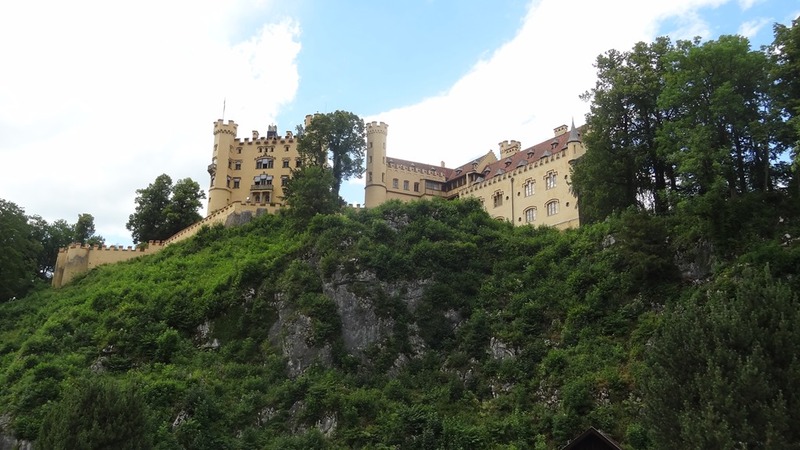 The Lichtenstein castle is a tiny little one on the top of another hill. We park quite close to the entrance. 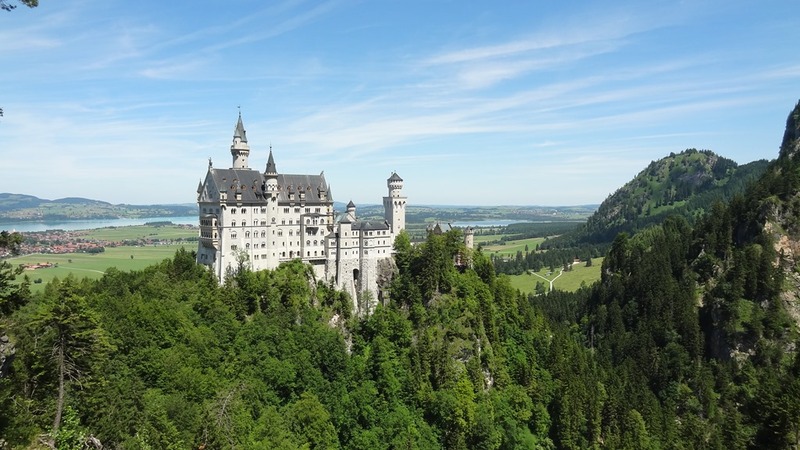 There are no English tours but one can visit the castle with a German tour and use the provided pamphlet for a translation. The castle enjoys an enviable location! Very fairy-tale like, isn’t it? There is small garden area where we wait for our tour. The views are quite outstanding. It is well worth a visit just for the views. 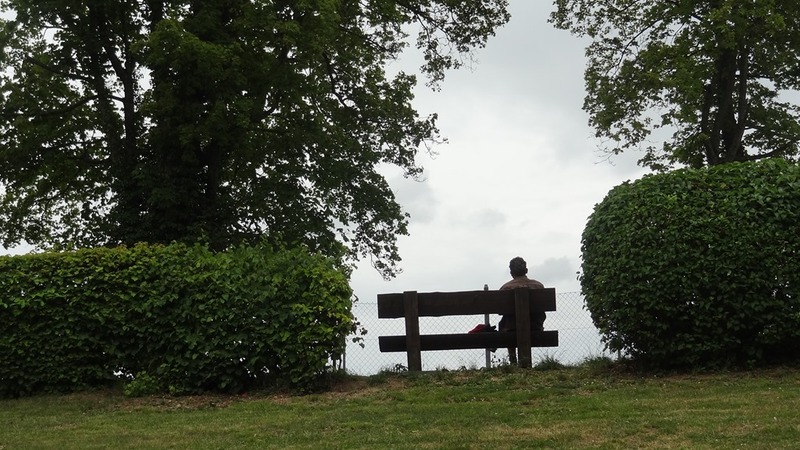 My husband and I sit for a while on the bench above, taking it all in. No photography is allowed inside however you can find some good photos in their site. It is a very small castle yet interesting enough. It is a pity that there are no English tours; it is not half as much fun reading things off a pamphlet. We have a 200 km drive to our hotel tonight at Füssen. We pass through some stunning scenery and I keep asking my husband to stop so that I can take some pictures. We finally reach the hotel at 7:30pm. It is spotless and quiet. We have dinner at the local restaurant opposite our hotel and call it an an early night. 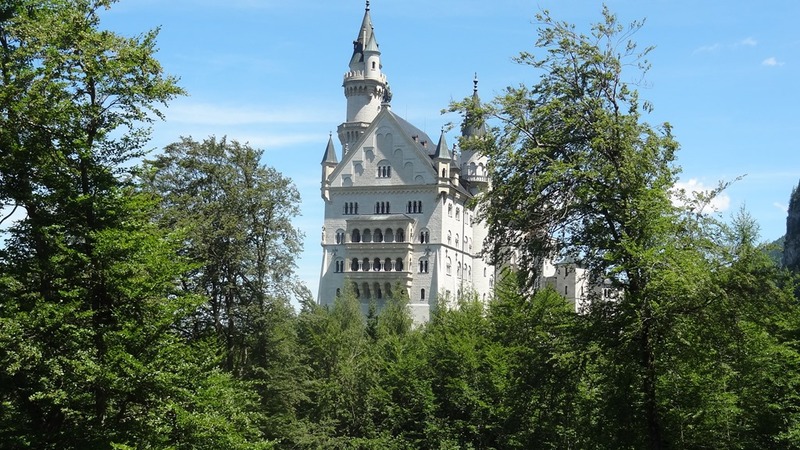 We don’t hurry this morning; it is past 10 by the time we check out and head out I had booked online for the two castles that we plan to visit, Hohenschwangau and Neuschwanstein. Both of these can only be visited as part of a tour. The tour-times they gave me online were for the 12:55 & 16:55. Given that we have to drive back 450 kms tonight, I am anxious to see if we can get the times changed to earlier ones. The queue at the ticket counter is very long; there are at least 150 people there. Thankfully there is a separate line for reserved tickets and I am second in line. This alone is worth the extra euros I paid for the reservation! The young lady at the counter manages to find earlier times for our tours so I am very happy. There are stairs to climb up the hill, or you can take a longer gradually rising road. The stairs take us about 10 mins. I click pictures while we wait for our tour to start. Again, there were no photos allowed inside the castle. This castle is not very big, more like a large manor house. The tour takes about 30 mins and is quite good. There is some info about both the castles at their site. The walk back is very pleasant, with lovely views of the lake below. I regret not having the time to explore the area a bit more. I would have loved a walk by the lake. Just look at its colour – a brilliant sapphire! 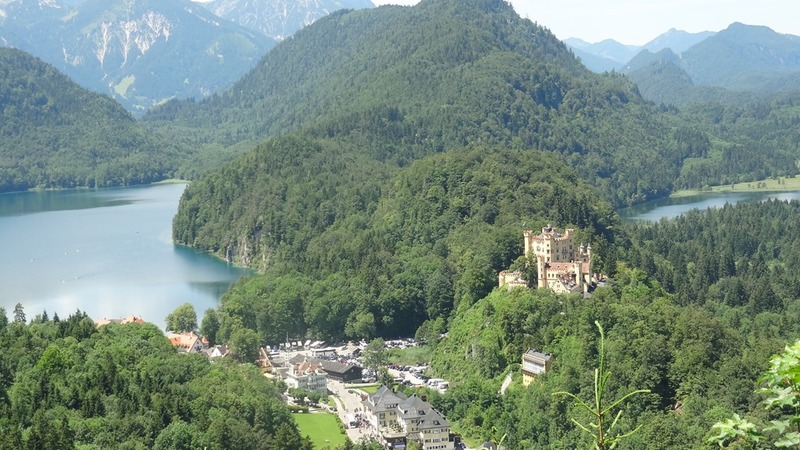 One can walk up to the Neuschwanstein castle, take a horse-carriage or take a bus to the Marienbrücke (above). 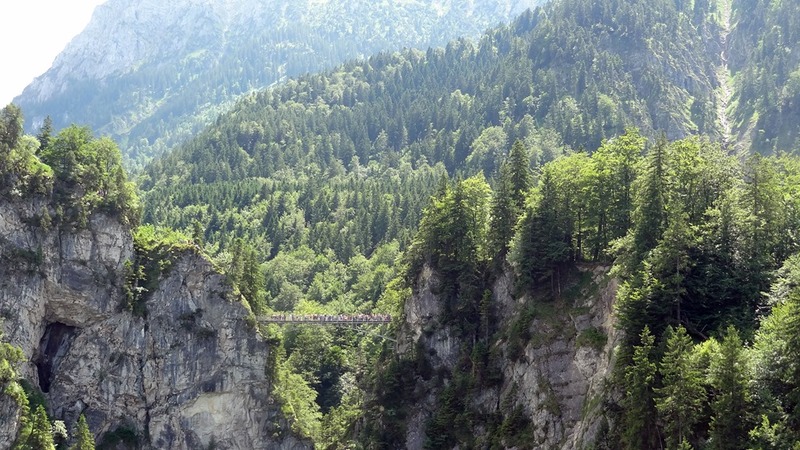 This bridge is suspended precariously over a deep gorge and has a magnificent view of the castle. A great place for photography. View of the castle from Marienbrücke. It is a pleasant 10 min walk downhill from the bridge to the castle with lovely views all the way. At the entry of the castle there seem to be hundreds of tourists. There are tours every 5 mins and we queue up when our tour number is announced on the board. The interior is extravagantly done, extremely theatrical. Quite over the top, but in a nice way. The tour however is very short; we hardly have time to pause and look as the next lot of people are at our heels. Many rooms are just skipped as there is not enough time. Again, as there is no photography allowed inside, I cannot show you any pictures. I buy myself a souvenir book to remind myself of the interior. We walk down the hill towards our car; it is a very easy and pleasant walk. On the way there is a restaurant and we stop for lunch. The service is terrible and the food mediocre. Its nearly 4pm by the time we get to our car and head back home. The drive is long and tedious, but we are both happy to have had a nice weekend away. It is Easter soon and my husband will have four days off from work. I would like to take advantage of it but am reluctant to plan anything complicated. We have just returned from a long trip to India which had required much organising and so I am quite put off at the thought of any grand plans. I look at Google maps and my eyes fall on Bologna. 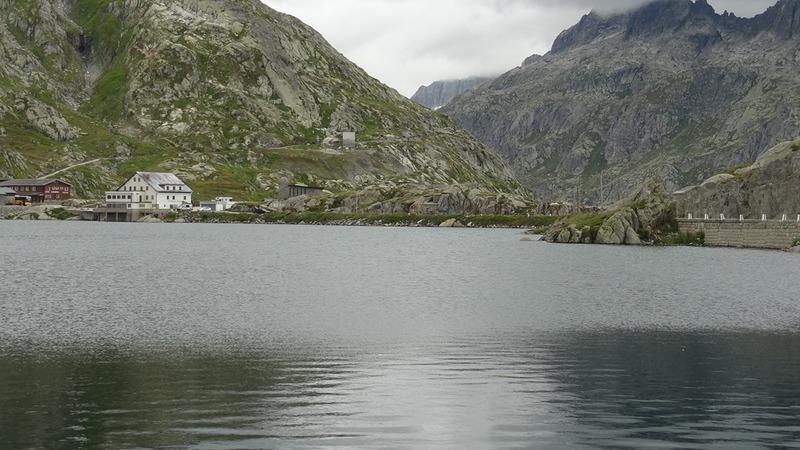 Our friends had mentioned it as a charming place to visit; the decision is easily made. We are up at 5 am, intending to leave by 6. As always we dither over something or the other and do not leave until 6:30. 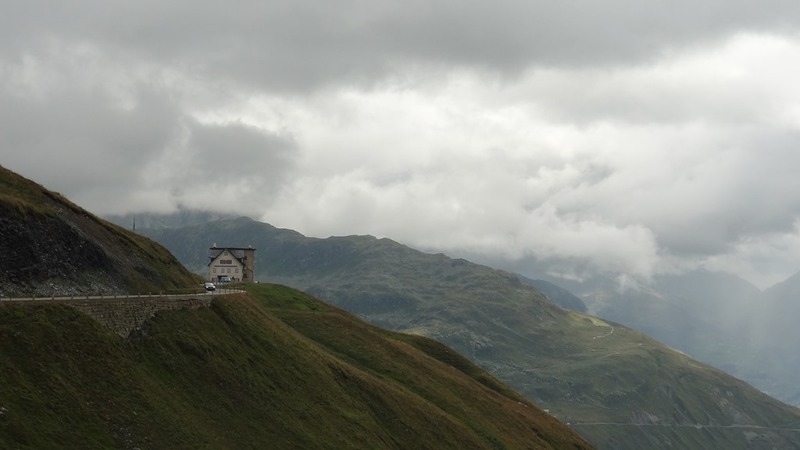 Still, the roads are quiet and we make good time to the Saint Bernard tunnel. There is still evidence of snow at this altitude though it is not cold. 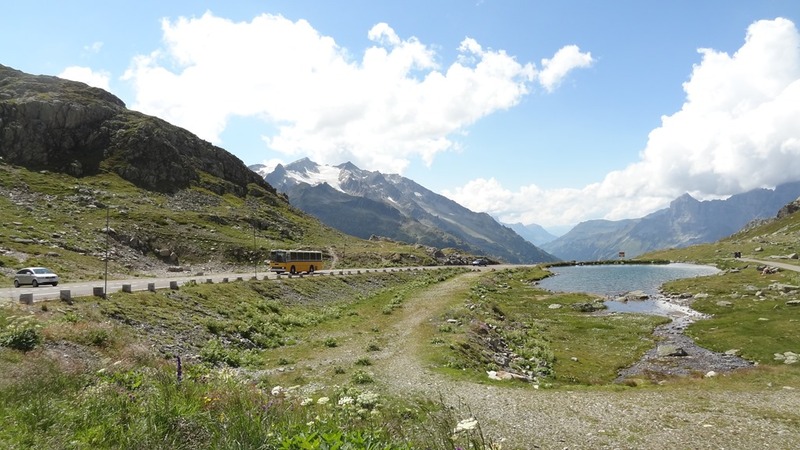 The roads in Italy get busier. 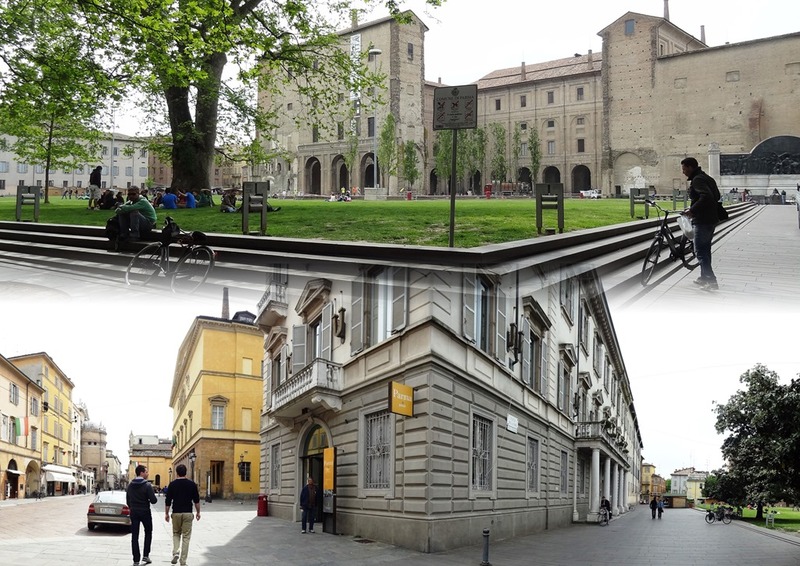 We stop for pizza lunch at Piacenza and reach Parma in the early afternoon. As planned, I want a quick look-see before getting to Bologna. I am not in the mood for any major tourism; I just want to check out the place and get a feel for it. Busy looking around us, we miss the ‘pedestrians and authorised vehicles only’ sign and venture happily into the city centre. But I get a feeling…’This looks like a pedestrian area’ I tell my husband ‘Lets get out quickly’. My husband is not sure about my ‘feelings’ but I am right after all! We feel lucky for not having been fined! After parking, we admire the nice Piazza della Pilotta, peer into the tourist office and have a hot drink before having a wander. There are plenty of young people in the piazza. Students? I wonder. Is there some educational institution close by? Our stroll takes us to large and impressive Garibaldi square. My tourist book tells me that this is where the Romans had a forum. It’s a busy square with the town hall, the Governer’s Palace and a nice statue of Mr.Garibaldi (General/Politician) to watch over it all. Next halt, the cathedral. The 12th century Romanesque Cathedral looks quite plain from outside. But when I step in, I am rendered breathless by the beauty of the frescos! The vivid colours! It’s a joyful looking cathedral, I like it very much indeed. The Cupola by Corregio is famous. We cannot come to Parma and not take a picture of its ham, can we? 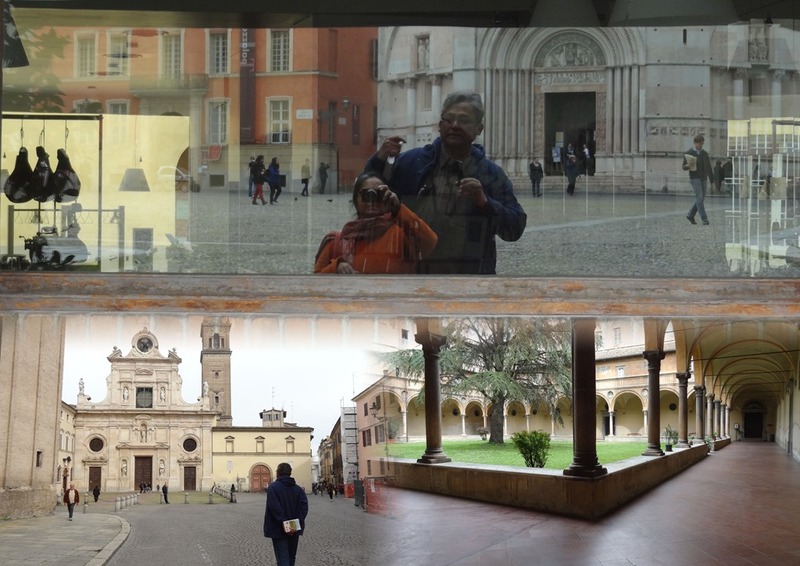 I am pleased with my photo with our reflections alongside the ham..it places us squarely in Parma! 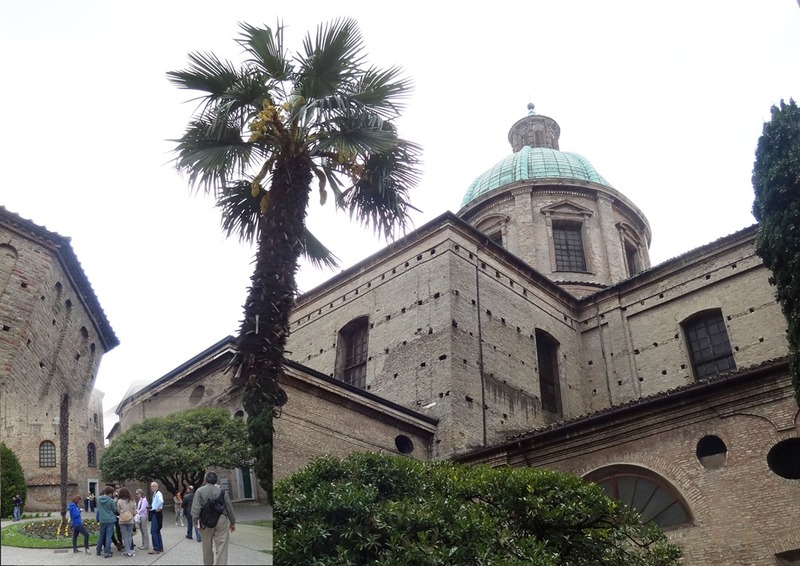 Our last stop is the San Giovanni church which features another cupola by Corregio. To the left of it is a 16th century monastery with its tranquil cloisters. We get back to the car and set off towards Bologna, about an hour from Parma. Out hotel is in a quiet neighbourhood outside the city walls, about 15 min walk from the centre. We are quite happy with it, That night we have dinner at Osteria Broccaindosso, a short walk from the hotel. With a limited menu, it serves delicious Bolognese food and the host was very hospitable. Recommended. 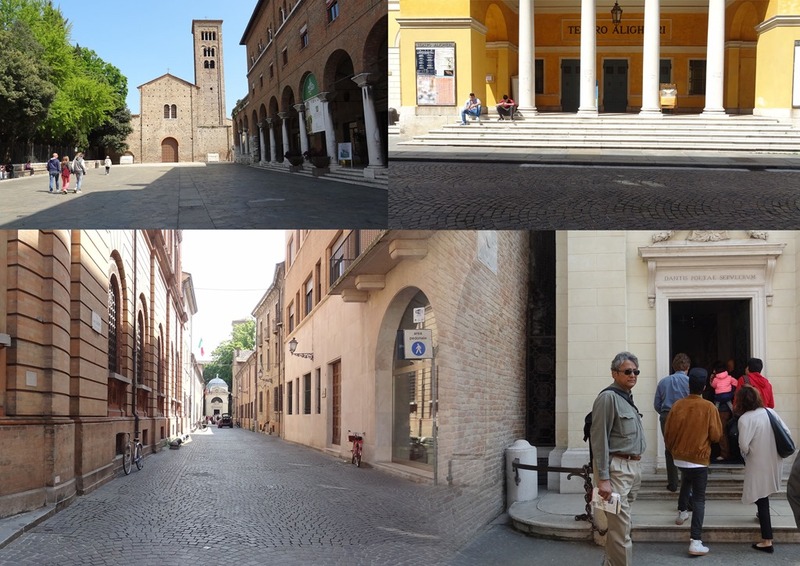 We are lucky to have a local Italian friend who has offered to show us around his town. My pictures below are from our walk with him, a latter walk by ourselves the same day and a walk on 21st morning before we head back. 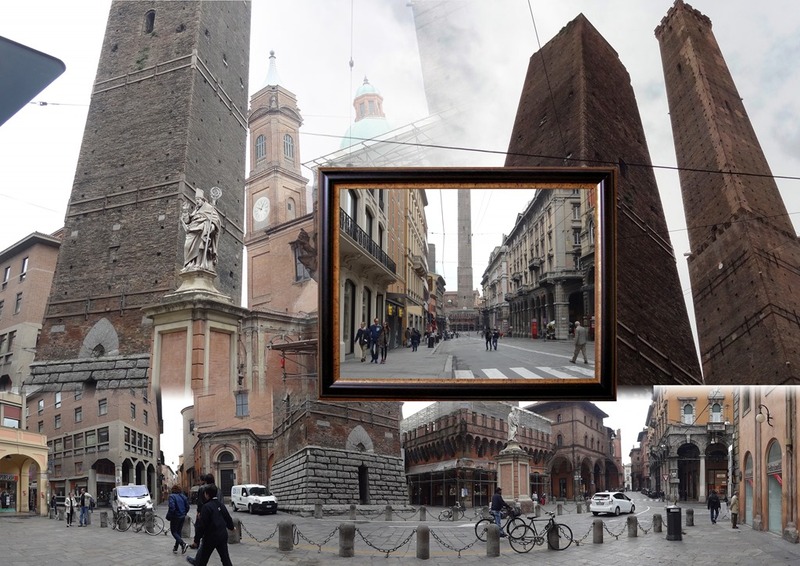 One cannot visit Bologna without noticing the Due Torri, a symbol of the city. One of them leans drunkenly, while the other stands tall and strong. The city is said to have more that 180 towers in the 12th and 13th centuries. I wonder how it looked! Seems there was some one-upmanship in tower building; height equated with power and wealth, I would imagine. Less than 20 survive today, the tallest being Asinelli Tower (97m) in the photo above. 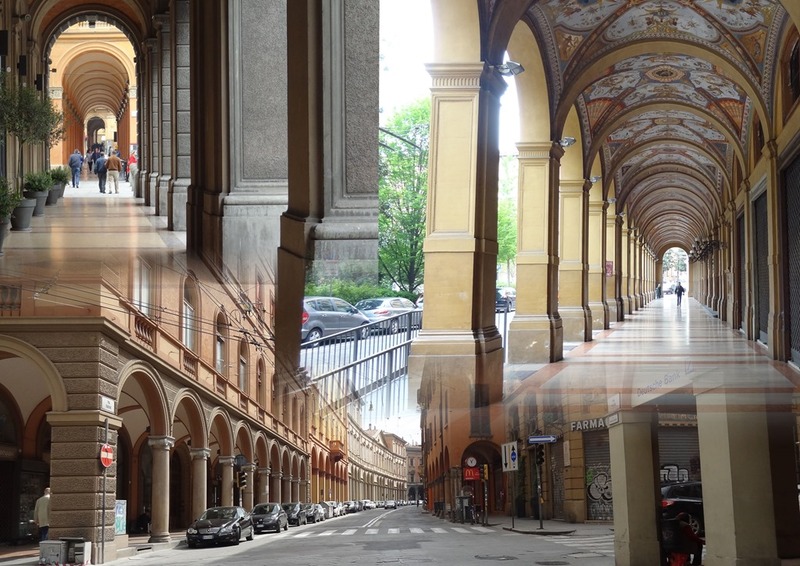 Bologna is famous for its miles and miles (wiki says 38 kms in the city centre) of covered porticos. Our friend tells us that on a rainy day one can walk from one end of town to another without getting wet at all! These porticos are very charming, some quite plain, others highly decorated. These give the city a very unique look. 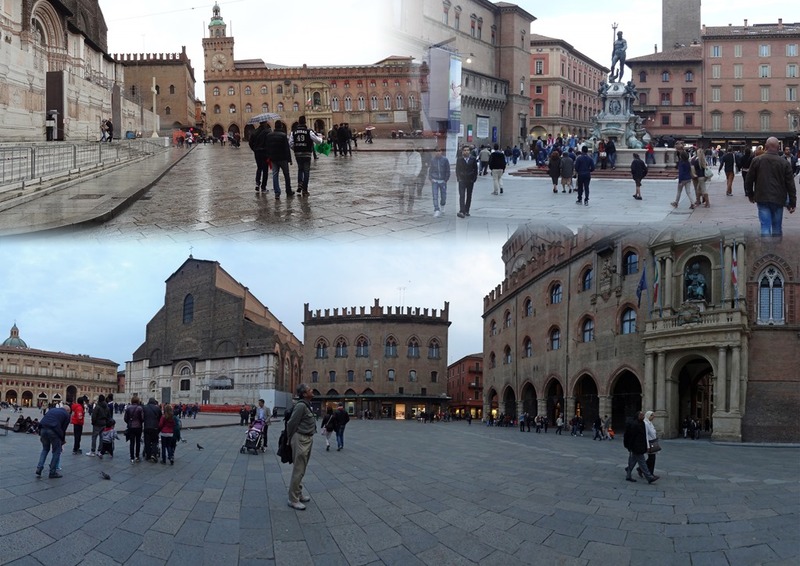 As in many European cities, the Cathedral square is impressive in its size and the beauty of its architecture, Bologna matches up to all my expectations. Note the handsome Neptune fountain in the picture above. The upper part of the Cathedral is uncovered brick, it seems they ran out of money while renovating it. This gives the Cathedral an interesting air. Piazza ri Enzo is adjacent to the Cathedral square. The old Pallazzo looms over the road, looking mildly grim. Our friend informs us that it is used for hosting business events etc. 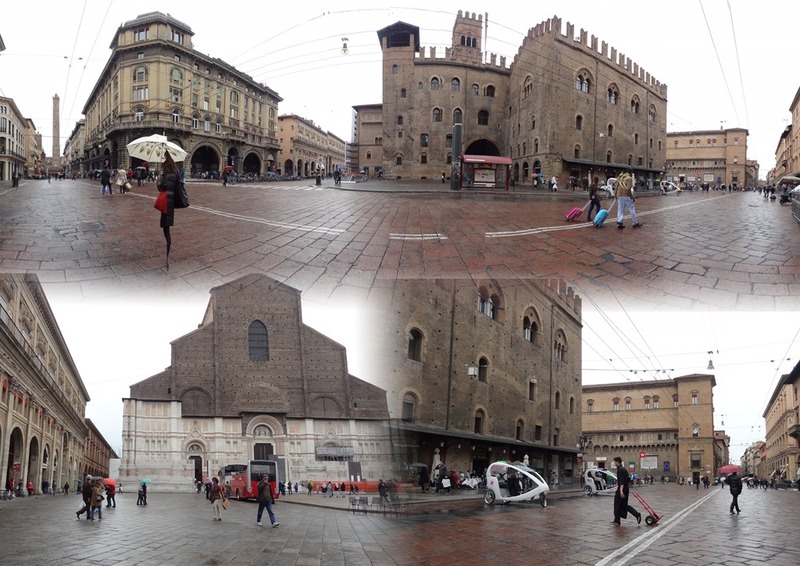 Bologna has a busy and vibrant market place. 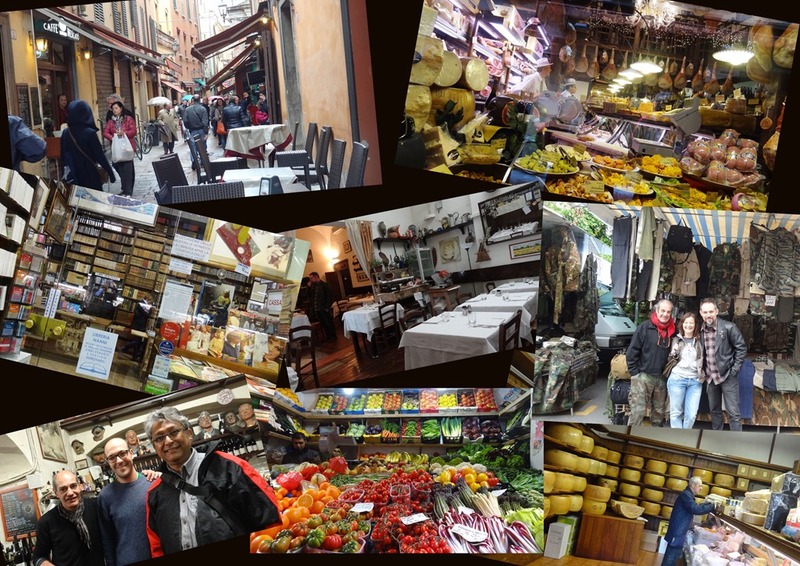 There are lovely looking delis, fruit and vegetable markets, cheese shops selling enormous blocks of cheese, book shops and a Saturday Market selling the usual market-ware. I take it all in, enjoying the buzz that a market produces. I do like Italy! 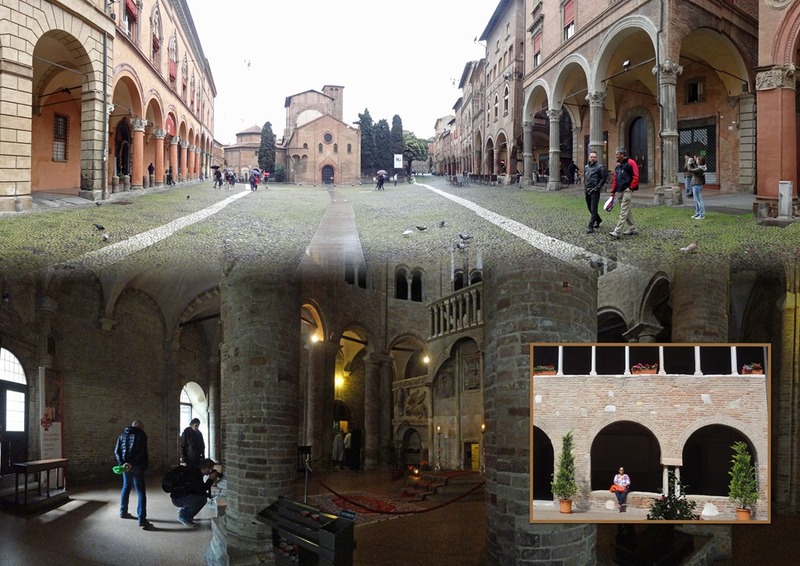 The Basilica San Stefano is very interesting. 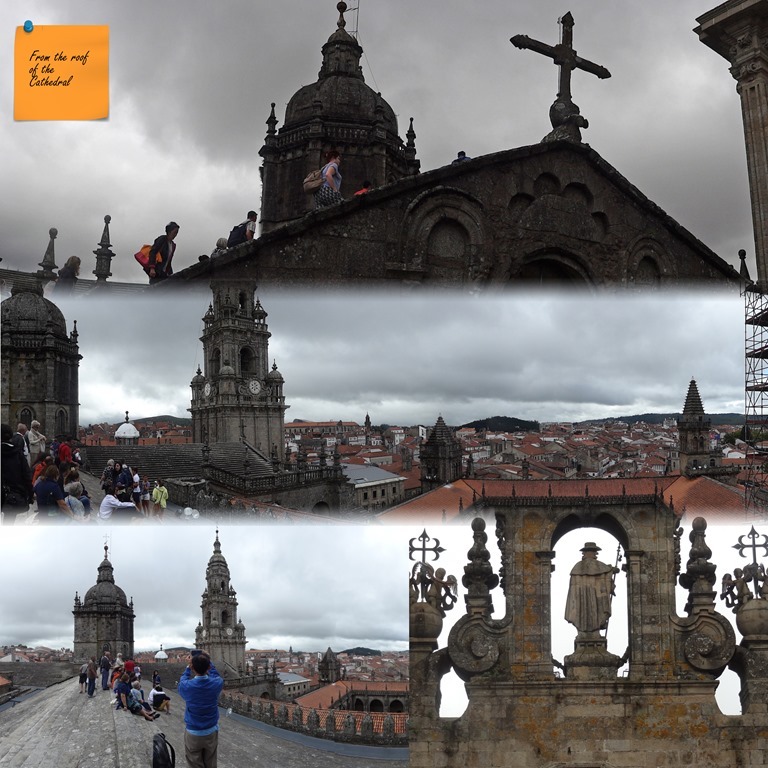 It is a complex of five churches in one, ranging from the 4th to the 13th centuries. I don’t believe I have ever seen a 4th or 5th century church before; I am interested to see how different the ancient church looks to the churches of today. None of the churches are heavily decorated, but I still like it very much. 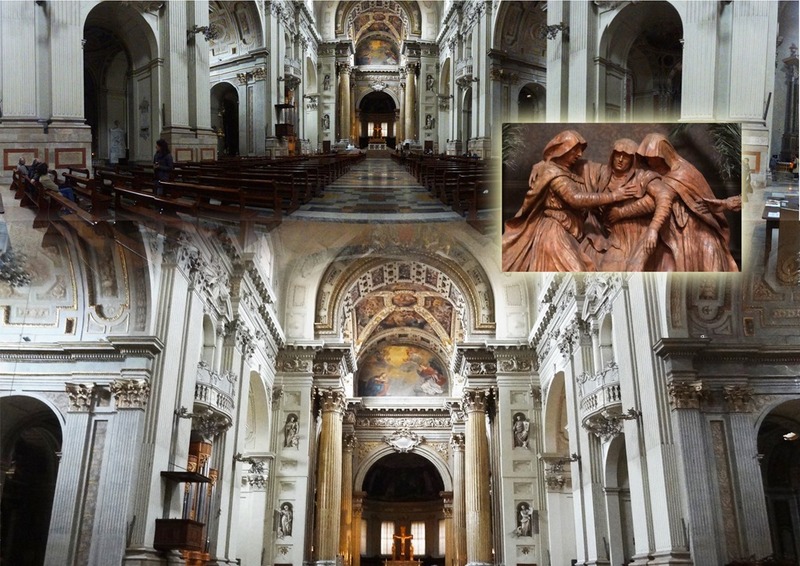 I have a quick look inside the Cattedrale Metropolitana di San Pietro; it deserves a more leisurely explore but the others are not much into churches and I feel guilty about making them wait. There is a marvellous terracotta sculpture by Alfonso Lombardi (16th Century) which catches my attention. 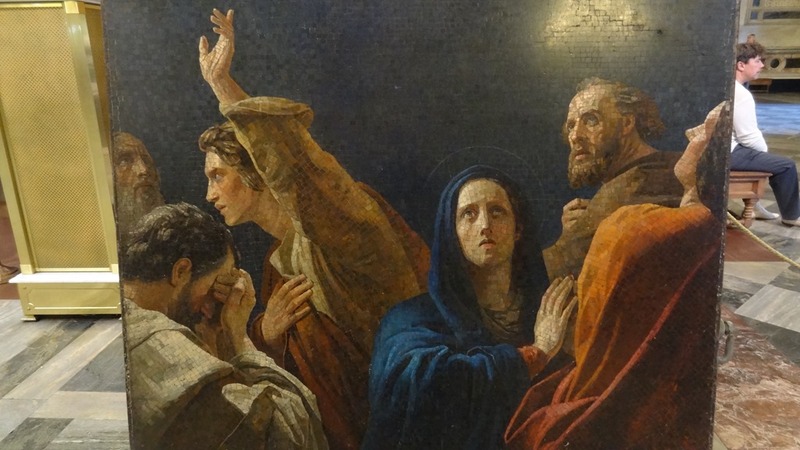 The expressions of the figures are so real! Best for last – the Basilica di San Domenico has a chapel for the Saint with his remains in an exquisitely carved sarcophagus. The carvings are such a delight! I cannot find the words to express how beautiful I find them! What amazing artistry! What an imagination! For me, this is the highlight of our trip. I walk around to the back. There is a skull inside a reliquary; is it really that of the Saint? A little macabre, no? 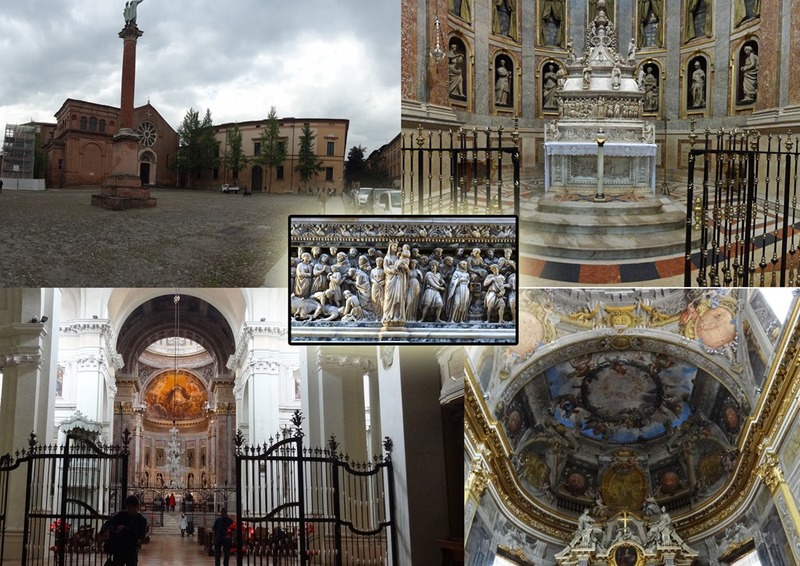 The amazing Basilica of San Vitale is an early Christian church with a highly decorated interior quite unlike other churches I have seen. My guide book says that this kind of Mosaic work is the best outside Constantinople; I can well believe that! No photos can do this justice, you just have to see it for yourself! The shape of the church, an octagon, is also interesting. 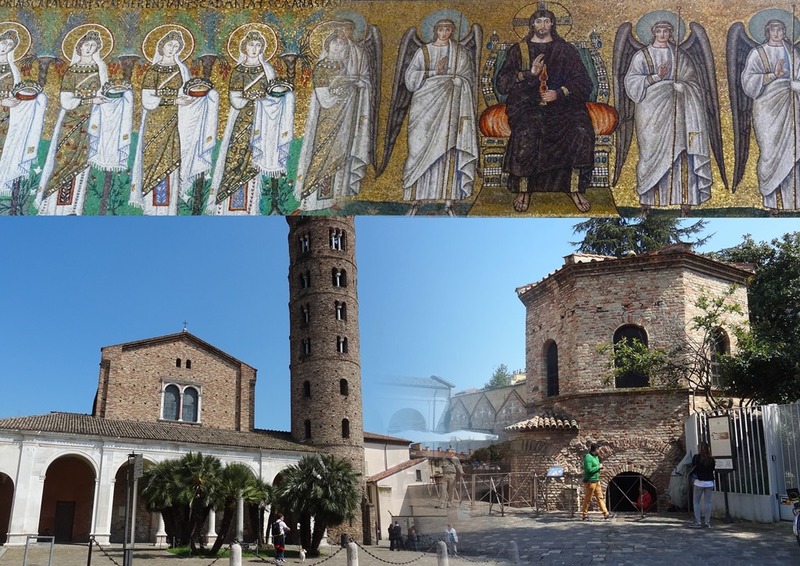 The access to the Mausoleum of Galla Placidia (5th century) is from its gardens. again, I admire the Byzantine mosaics. Next we visit the Baptistery of Neon (4th-5th century), the oldest monument in the city (above left). Again, this is octagonal. ‘Is there any significance in that? Is the number 8 sacred in any way?’ I wonder. The Cathedral is next to it behind which is the museum which we visit. There are a few quite interesting exhibits but photography is not permitted inside. Seeing that Dante’s Tomb is here, I demand to see it. We wander around a bit lost but that’s ok, I quite enjoy the walk and admiring the architecture. 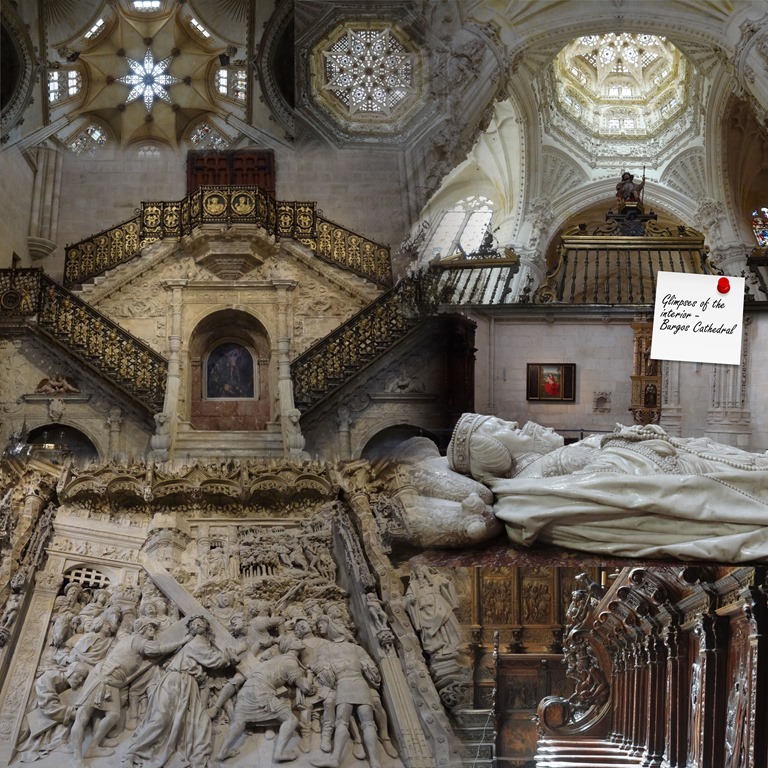 Dante’s tomb in itself is quite a simple structure (above bottom left and right). 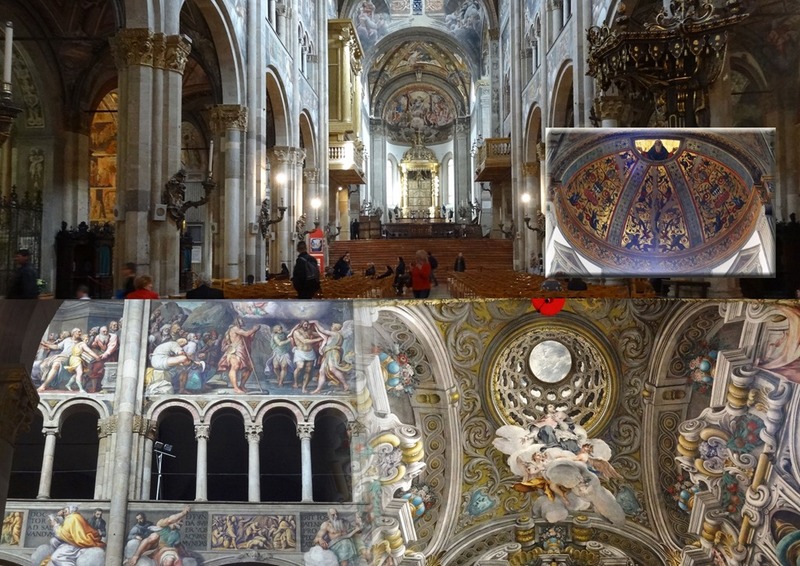 We next visit the Basilica Apollinaire Nuovo (6th century), again with some wonderful mosaic decorations (above top). The last monument we visit is the Arian Baptistery (4th-5th century). 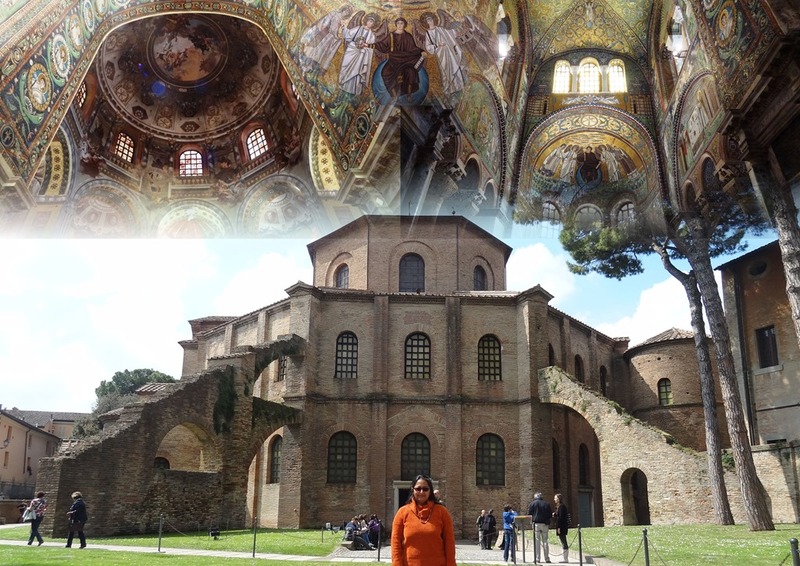 I am very satisfied with our visit to Ravenna as I have seen some of the oldest churches in Europe. Ravenna Tourism is very organised; there is one ticket for all monuments and they provide a good map with it. We wander back to the car, admiring the impressive Piazza del Popolo which is buzzing with life. 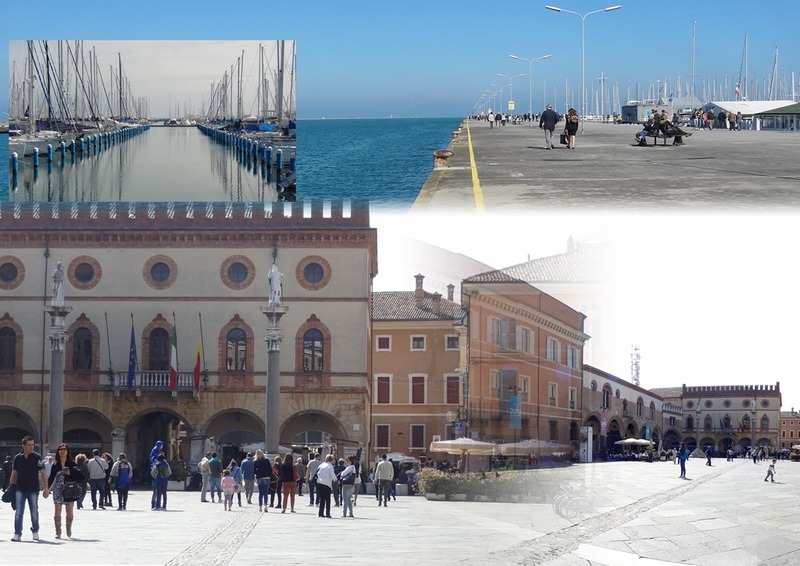 On the way back to Bologna, we take a small detour to admire the port and the canal. 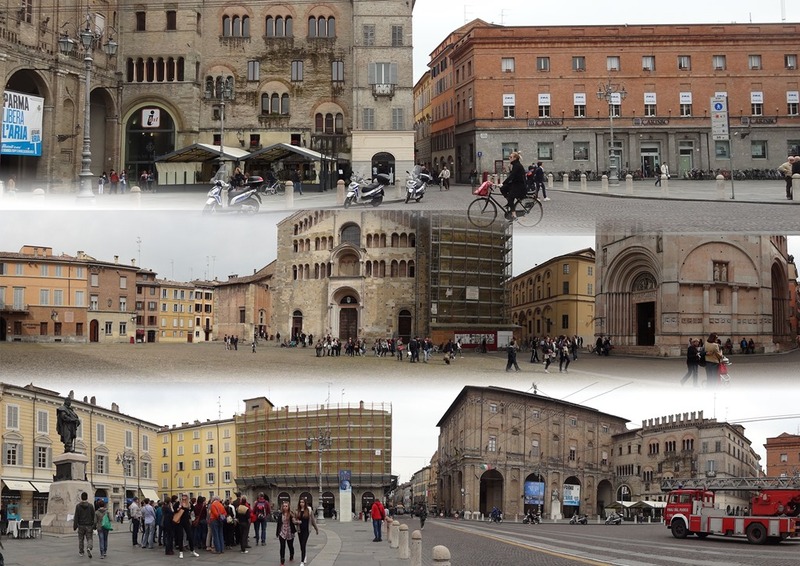 We take a morning stroll in Bologna, taking pictures and checking out places we had missed before. This is a very photogenic town, my eye is caught by many an attractive corner. This has been a good little break; it is with a feeling of contentment that we wave goodbye to Bologna.